We have learned over the past year or so that little blips can raise their head at the most inappropriate times and the past few weeks has done just that. So……… lift-off had to be cancelled and this amazing trip we have looked forward to for the past 12 months has gone up in a puff of smoke. BUT we must not dwell on that and rather be very grateful that this little medical event happened here at home instead of in Beijing this week or next. After a week in hospital the clothes had to be packed away for another day, another time and, for now, we are both content with that because this is where we need to be for monitoring over the next few months. It certainly isn’t a time to be sad – how can you be when you get the most wonderful medical care here at home? 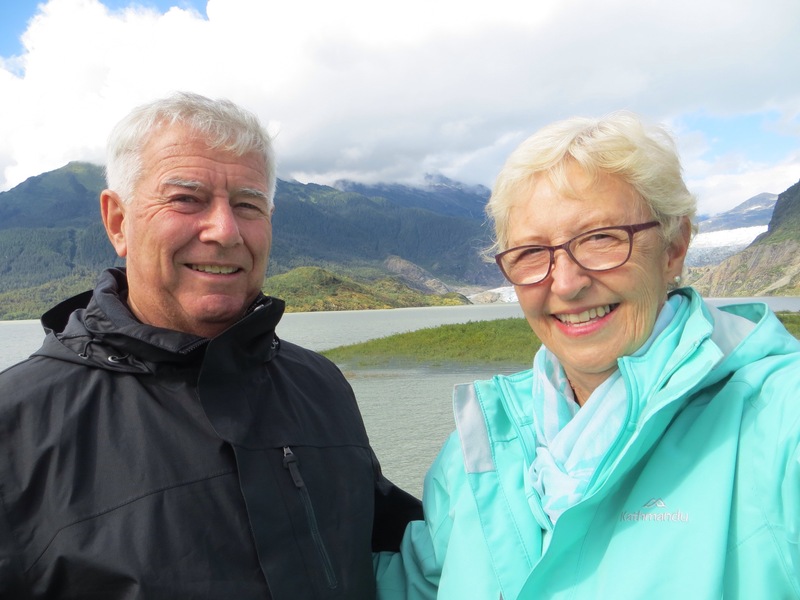 How can you be when you have grandchildren who provide joy and have all sorts of things planned for us to attend – soccer, netball, hockey, band concerts, holidays in Pauanui and visits from the older ones for lunch when they can squeeze it in? We are lucky. In the meantime, if we do anything exciting and it is worth reporting I will post something to make you smile. Our travel books will come out again to plan the next adventure in a wee while. Meanwhile – stay well, take care, make the most of every day and…….. keep smiling. We are preparing for takeoff! Well here we are getting ready to depart for our holiday in China and Japan. So much has happened since the one who looks after the “B’s” dragged me down to House of Travel last June – who would have thought that the lead-up to takeoff would produce a few rocky bumps but they were negotiated successfully so here we are – currently surrounded by enough clothes to cover off everything from a heatwave to a snowstorm! I can see a few negotiations coming my way because the one in charge of the “B’s” can be stubborn at times. You would never have guessed that would you!*@#?? We leave for Beijing at midnight on Monday 7 May and, because we have come to realise that we are not 21 anymore, we have given ourselves two days to recover from that rather long trip. That’s good actually because we haven’t done much training on using the chopsticks – I have never been able to fathom how to eat rice with those sticks but I am planning on doing some YouTube tutorials to help us out with all that because on our last visit to Madam Woo I had trouble negotiating the lettuce salad! We are pretty excited about going to the Great Wall, the Terracotta Warriors, the Three Gorges Dam Project on the Yangtze cruise, Tiananmen Square, Xian, Shanghai and I see we are even going to have to dress in our finest Chinese gear to attend a gala dinner – guess that means I need to drag the boss to a market with the millions to choose an outfit!! I am thinking that by the time we leave here we will be certified chopstick users – or the rice will be all over the floor! We have started watching Nobu’s Japan and Taste of Hong Kong because we got sick of waiting for Rick Stein to have a long weekend in Shanghai! We fly to Tokyo after 16 days in China and begin our Japanese experience going to Five Lakes, Hakone, Mt Fuji, Himeji, Hiroshima, Miyajima Island, Kyoto and Osaka. Then Aidan and Jenny join us in Osaka and we go out of the cities and into the mountains for a week to Takayama and Kamikochi to the more relaxed pace of walks, bike rides, fishing and a cooking class. I need to check if we need to practise walking in platform wooden jandals with our sox on. I am just hoping the boss doesn’t make me put that white foundation all over my face and do up that big bow at the back of my dress! He wouldn’t would he? You won’t be getting any more boring stuff to read until we arrive in Beijing and have had our first chopstick dinner because I know you will be excitedly waiting to hear how it went! Just remember – good things take time! 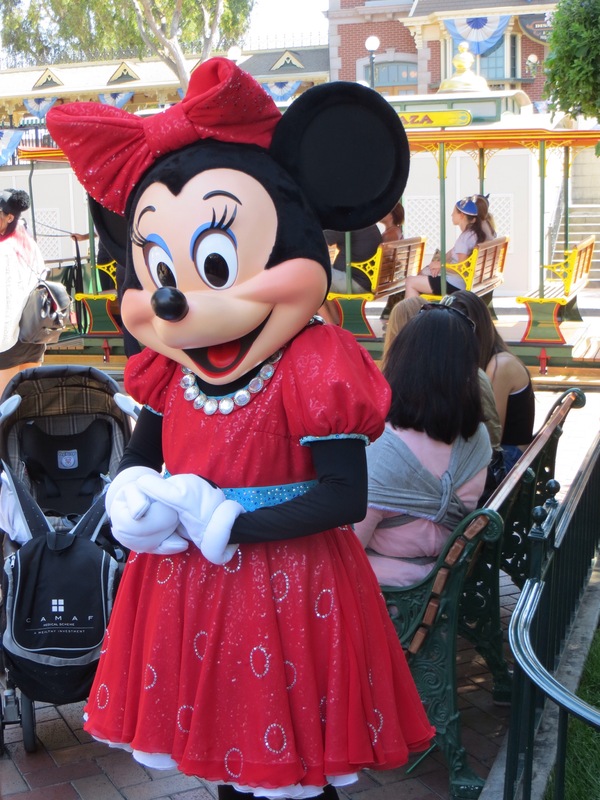 Last stop – Disneyland. Can you belieeeeve it? This was at my request and the boss agreed (although he is probably regretting it!) 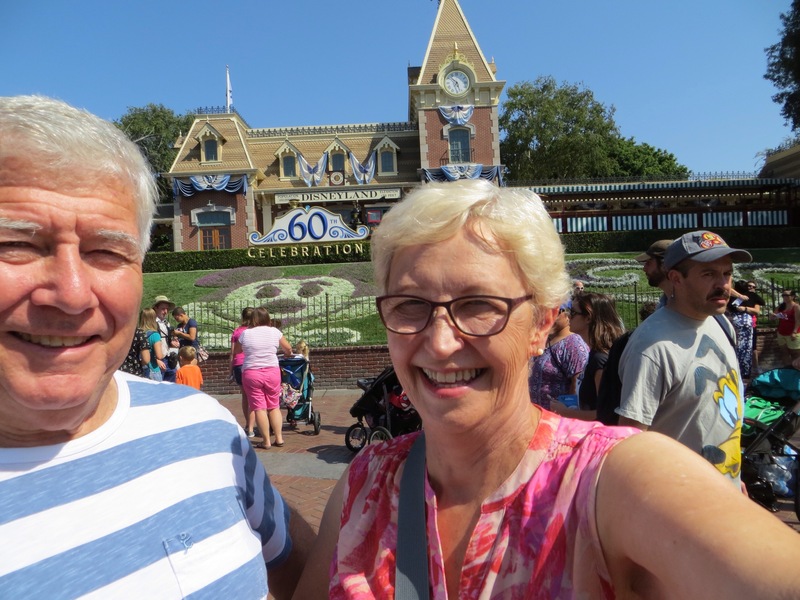 We arrive back in LA on a hot afternoon and straight to Howard Johnsons just down the road from where Mickey and Goofy and friends live and, by the look of the temperature gauge, it is just as well we put the shorts and t-shirts on the top of the case! It is a warm 33 degrees as we set off after breakfast to be kids for 2 days in the land of fantasy. 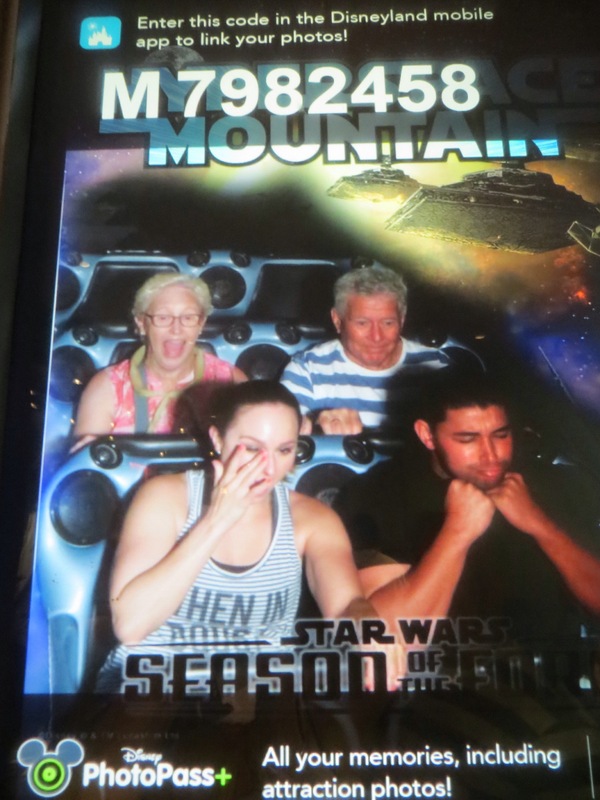 The littlies have emailed us to tell us what their favourite rides were last year and I can see that every bone in our bodies is going to be rattled as we hold on for dear life on rides which scream around in the dark and in the light and where Star Wars Chewbaccas are using every tool in their armery to awaken us!! We ride Big Thunder Mountain Railroad, Splash Mountain (where we were more than splashed), the Matterhorn Bobsleds, Pirates of the Caribbean, the tameness of Finding Nemo Submarine and It’s a Small World, Hyperspace Mountain, Star Tours, Astro Orbitor, Buzz Lightyear Astro Blasters and then it’s over to California Adventure Park to do Mater’s Junkyard Jamboree, Luigi’s Rollicking Roadsters, Radiator Springs Racers, the Grizzly River Run on rafts and the amazing Soarin Around the World which we line up for twice. 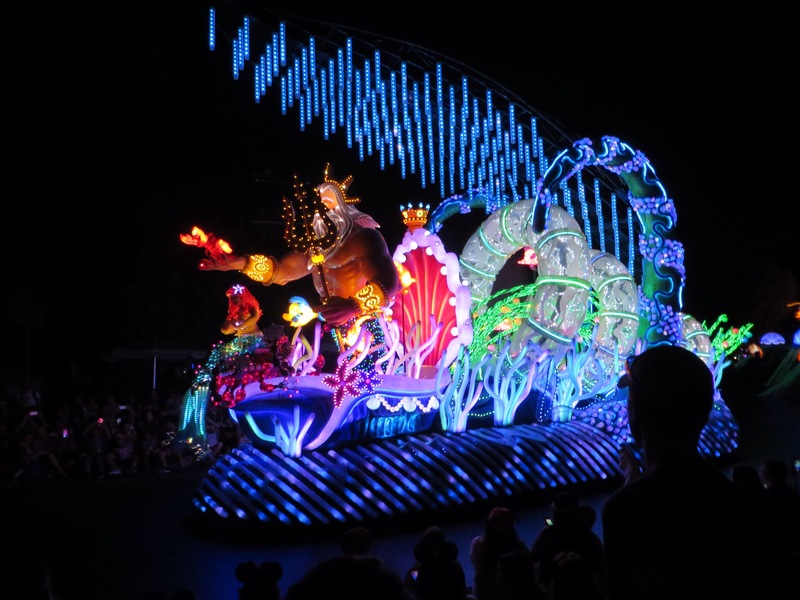 The first day we managed to do 10 hours of all this excitement staying to watch the Paint the World light parade and fireworks before hobbling back to the hotel and fallin’ into bed and sleeping like babies!! Next morning we were back there to finish off the list the kids had sent us. We then hobbled back again to have a swim and shower and even fell asleep on the loungers at the pool before the shuttle came to collect us. We are just hopin now that we don’t need to go to the physiotherapist next week to sort out our bones that have probably come out of alignment with all this shaking and turning (and screamin!!). So the journey is over and what an amazing one it was. Highlights? There are too many to mention; too many contrasts of wonderful scenery, experiences and monuments from the big cities like Washington, Montreal, Quebec, Toronto and Ottawa to the madness of New York and Las Vegas; the heat of the deserts and canyons in Arizona and Nevada; the pretty and beautiful places like Victoria and Yosemite; the sheer magnificence of the Rockies with the huge mountains, the blue lakes, the never-ending Christmas tree forests; the interesting and unusual life of the Amish; the quaint places of Maine and Nova Scotia like Peggy’s Cove; the black bears, moose, caribou and other amazing wildlife of Canada and Alaska; the glaciers of the Inside Passage; the wilderness of Alaska with its mushers, log cabins and the salmon running to get upstream; the incredible flight over the Arctic Circle to Coldfoot and Wiseman to get an insight into this very different life – all of it a feast for the eyes and an experience we never thought we would be fortunate enough to get. We are blessed. We are completely over Trump and Hillary and glad we have left them behind and we are over queuing at the bathrooms and looking under doors to see if there are feet there!!! We have travelled in excess of 12,500 miles on land sitting beside each other on a coach (and we are still talking!!) We have slept in 36 beds, enjoyed wonderful food, and had too many wonderful experiences to recall (the blog was written partly for us!) It was mainly written for family and friends to travel along with us and we hope you have enjoyed it. We have just loved writing it. So we are home – we managed to get to the right place for breakfast at the right time and we didn’t need to put our cases outside the room for collection. We had a love affair with the washing machine on the first day back and the car was quite nice too!! This adventure has ended but make no mistake – there will be another sometime, somewhere. It might not be as far away or for as long as this one but we already have some ideas! Heaven forbid! Just need to buy the Lotto ticket! Golden postcards.org will remain and we may even write about other holidays. We are off to Melbourne in October for a special wedding; to Pauanui for a few months over summer and Martinborough for another special wedding in March so we will post photos and a short commentary of our continuing adventures. Now we look forward to catching up with y’all here at home! 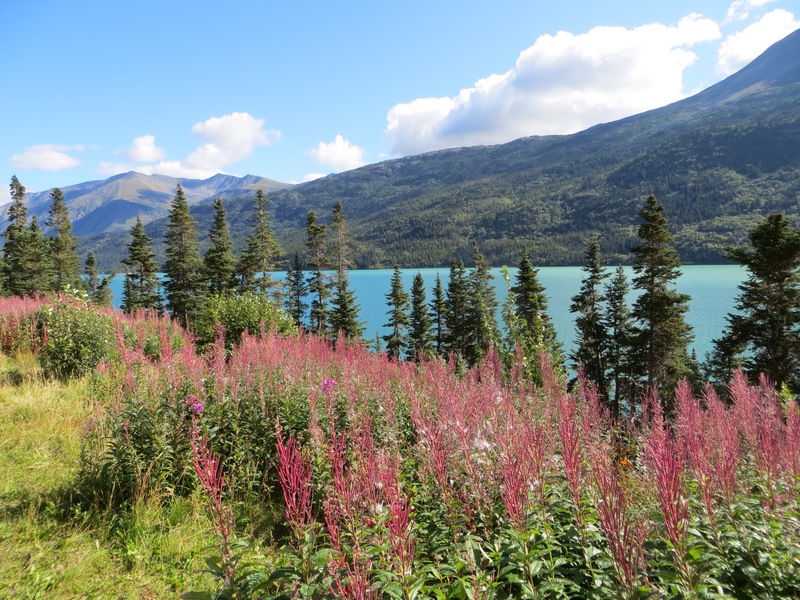 We depart the beautiful Copper River Wilderness Lodge and set off for Denali travelling down the highway before turning off to travel west on the Denali Highway – the road less travelled and before long we are off the tar seal and onto the rough. Now all our suitcases under the bus have been wrapped in tarps today – oh deary me – there is a message here!! We move into the alpine region and blow me down – some hardy people actually live here. We pass the area where the Arctic Man competition is held each year and this is a huge festival apparently where men on skis are towed behind snowmobiles on the ice and snow. Heaven help us if the boss decides this will be the next thing to train for! The scenery is very different and almost devoid of trees now but we are seeing a low foliage carpet of reds, browns, greens, yellows, oranges with little lakes in the midst of it and it looks like an artist has swept the palette over it all. 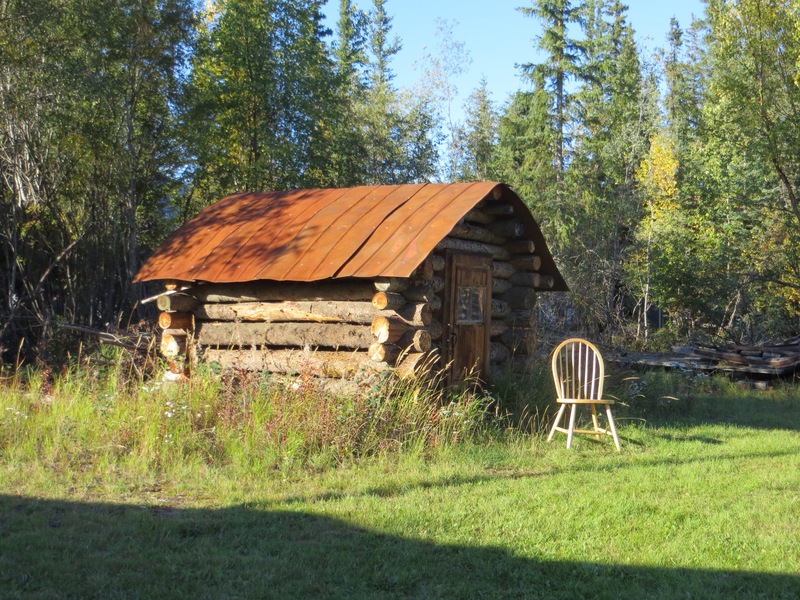 The bathroom – well let’s just say we have just had a stop at a little shack and experienced an outback Alaskan restroom – I will say no more but you get the drift! I have a feeling we may have to experience a few more of these as we travel west on this ‘ere road! 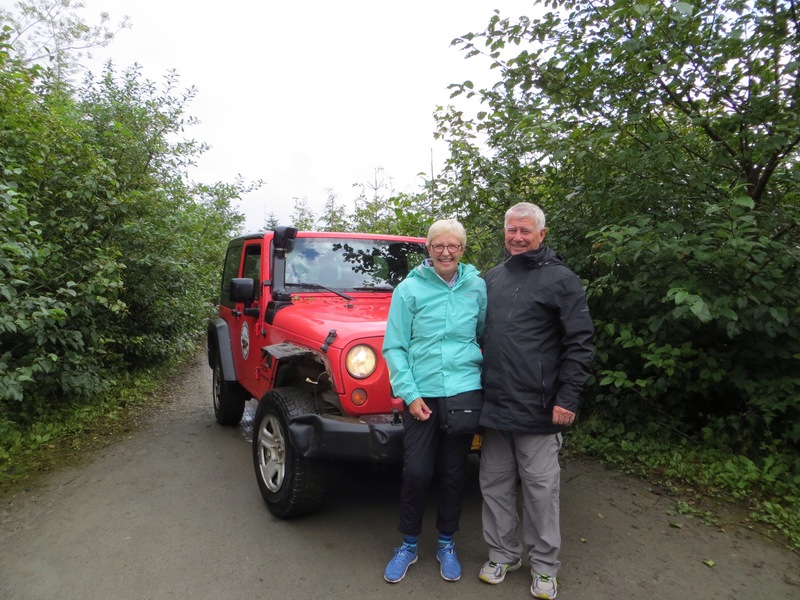 As we travel on and reach the summit on this bumpy road we look down on hundreds of little lakes and Jim, the driver, tells us we are really now seeing the heart of Alaska. The road is built up with sand and shingle because of the permafrost and so we are looking down on the tundra surrounding us. 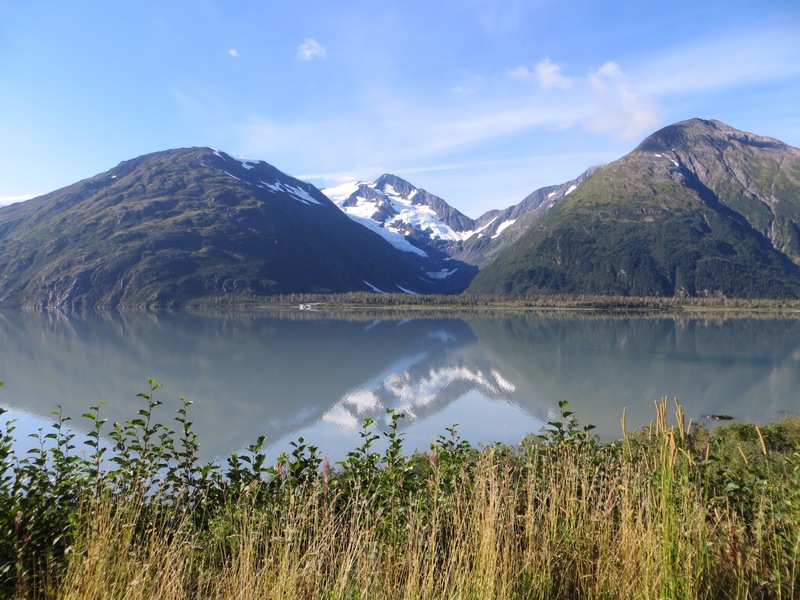 This is why we wanted to stay on here and travel inland to see the real Alaska – the little outposts where life is so very different to what we are used to. We pass hunters with their rifles over their shoulders. This is moose season and Jim also tells us that some of these hardy characters stay out here for a month hunting for moose to add to the supplies they need to get through the winter. The beavers have made their dams in lots of these tiny lakes. 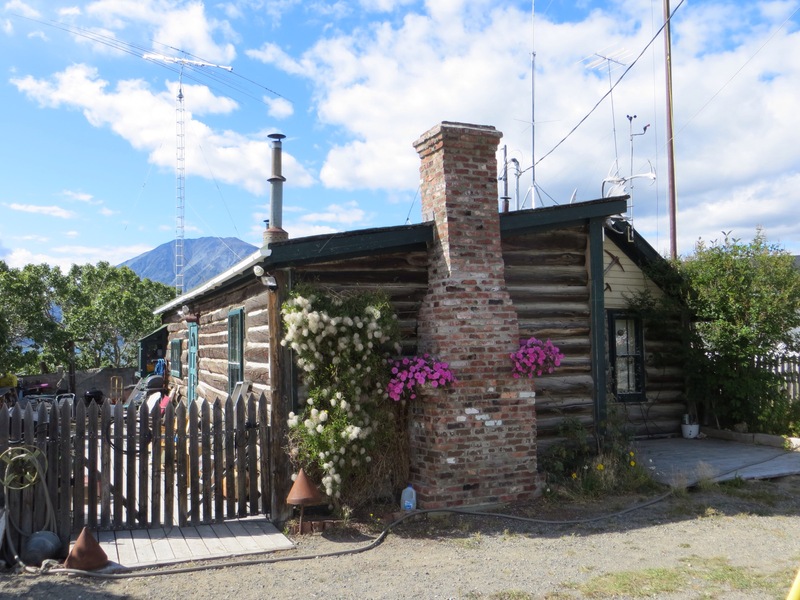 We stop for lunch on this rough highway at McLaren River Lodge and, as we are getting used to in this part of the world, the manager comes out to the coach to welcome us to this quaint log cabin cafe in the wilderness. Their “world famous” soup table is awaiting where it is help yourself to as many bowls as you like with freshly baked bread and topped off with berry pie. It was a very efficient way to feed 40 of us and their warm hospitality made it memorable. 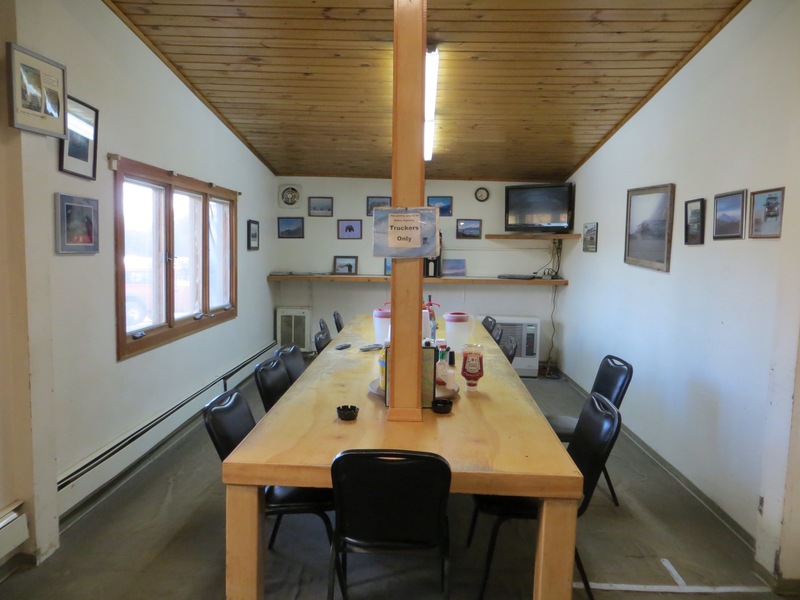 The cabin was decorated with $1 bills and a large bear skin on the wall. So off we trundle dodging the large potholes and still admiring the scenery with a few large glaciers thrown in now to attract our interest. 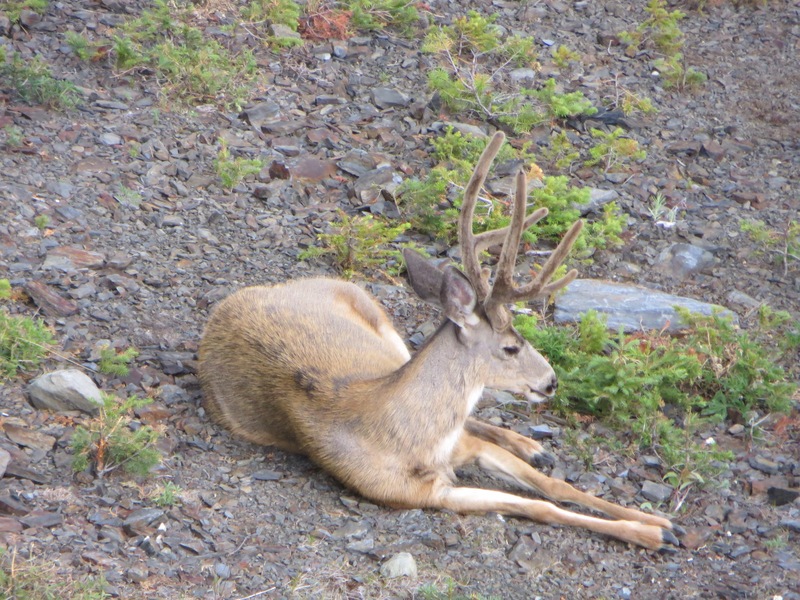 Suddenly there are more hunters with rifles, many little tents propped on shingle, RV’s, caravans and it seems the area has come to life after many many miles and we then see quad bikes with caribou racks with their catch in tow and so many people here for the hunting. We also see a moose and her calf down by a little lake. 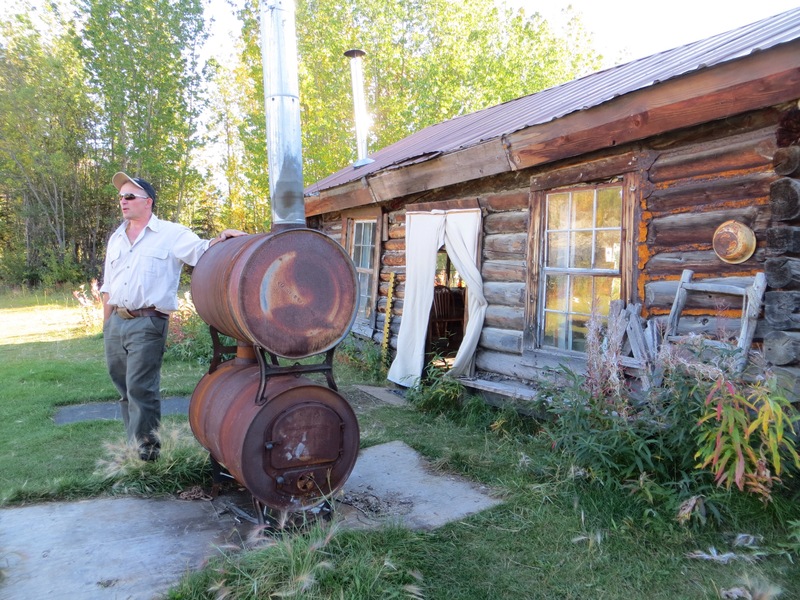 We are heading for the next stop at Cantwell, a small town which began as a flag stop on the Alaskan Railroad and then onto Denali Wilderness Lodge just outside the Denali National Park. 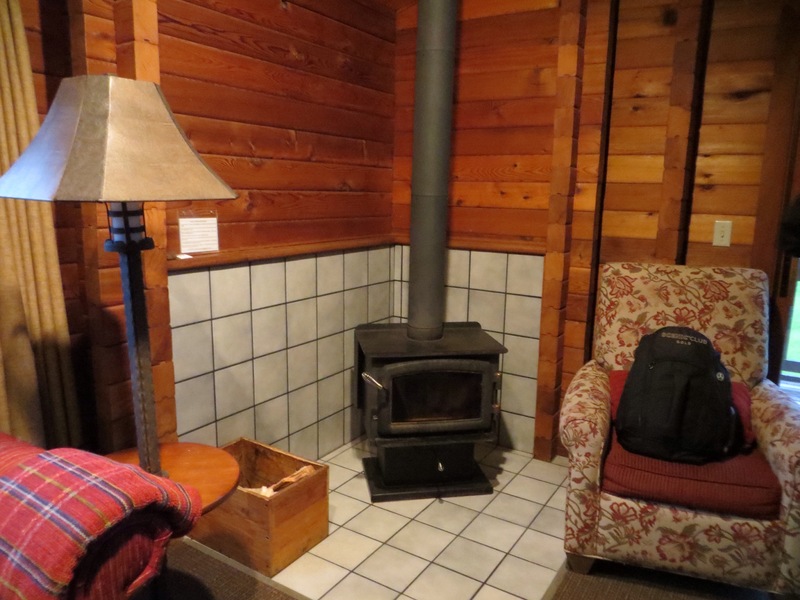 Our stay here is for two nights and the lodge is spread out in several large log-cabin buildings. 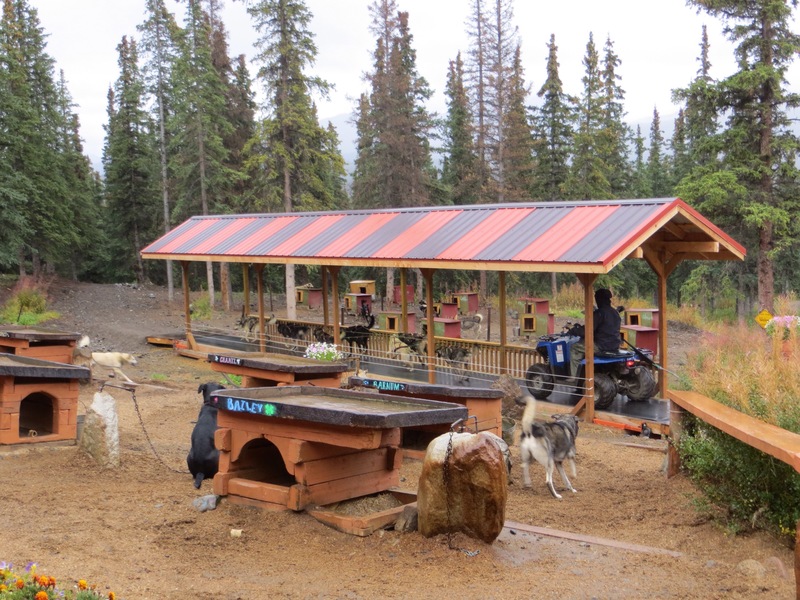 This morning our excursion is to Husky Homestead which is owned by Jeff King, a four-time winner of the 1000 mile Iditarod Dog Sled race and an amazing place it is. 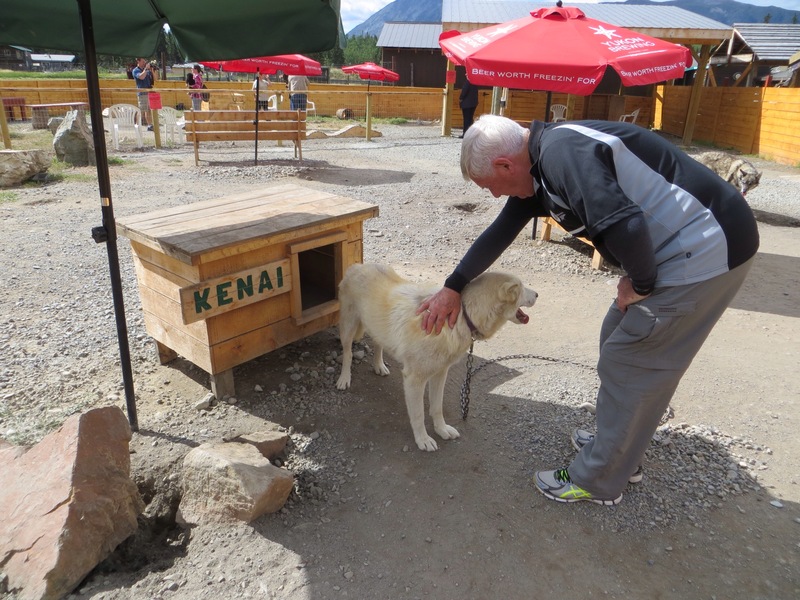 Jeff has about 20 dogs and the same number of puppies but all is relatively quiet on the dog front when we arrive. We are given a puppy to hold and cuddle and very cute and fluffy they are. 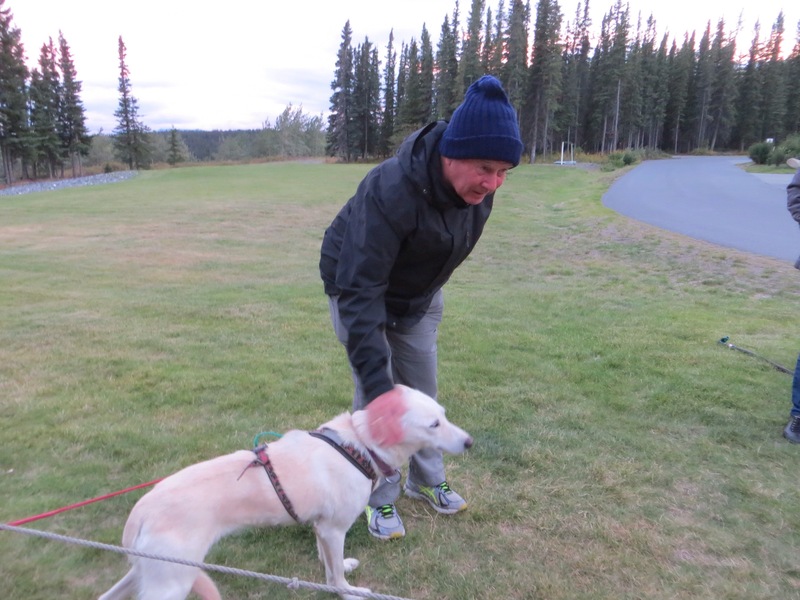 Then Jeff speaks for some time about the training of the dogs, diet, weight, exercise etc and he is very entertaining. Then it is time to give everyone a demonstration of the dogs pulling an ATV or large quad bike. 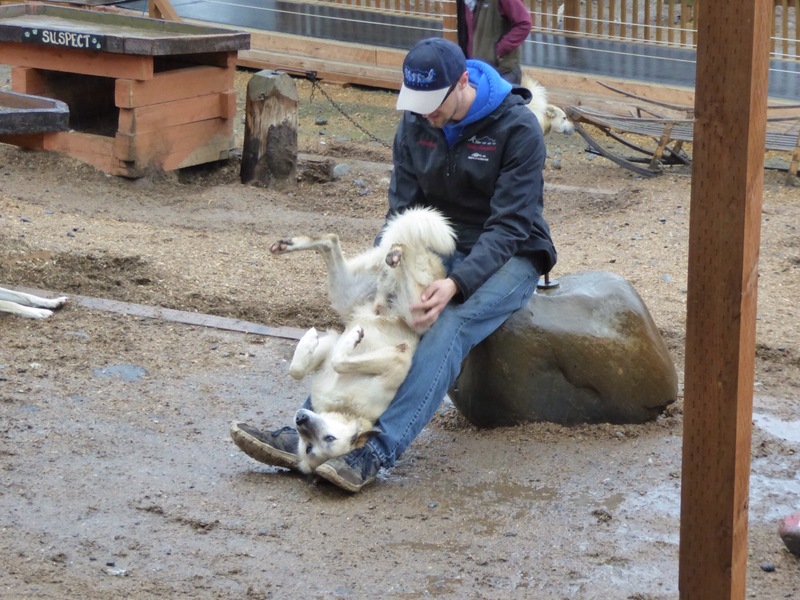 Well – as soon as the dogs see the mushers going to get the harnesses they go absolutely bananas and they howl and bark and leap and dance around hoping to be the chosen one! The morning was a highlight watching these very very fit huskies pulling the ATV at a million miles an hour around the forest track and, as soon as they depart on their training run, the other dogs settle back down and all is quiet again. If only the boss and I could be so excited about doing the exercise when the alarm goes off on the mornings we go to the gym class! I might try it and watch his reaction – but then again, he may have me locked up so I will reconsider that little idea! 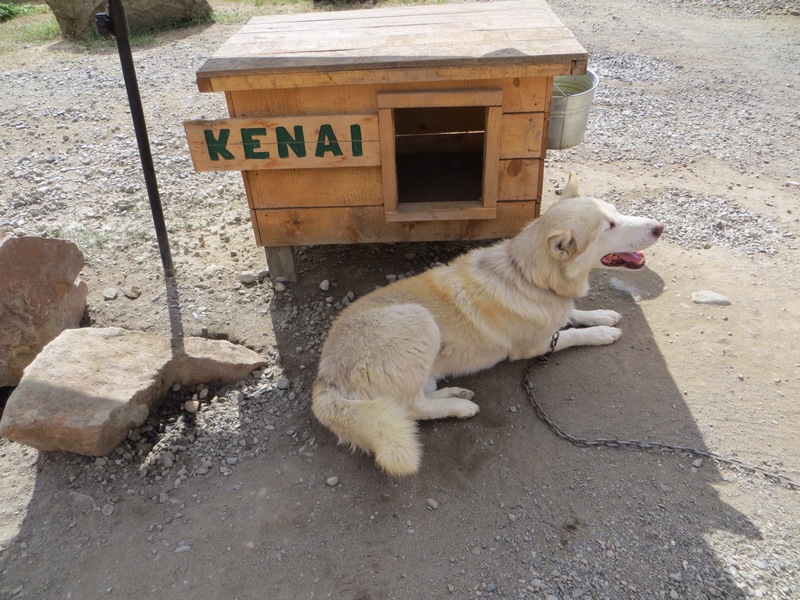 We are sure getting our share of huskies here because this afternoon we get a shuttle to the Denali Visitor’s Centre down the road and attend the Dog Show at the National Park Headquarters. 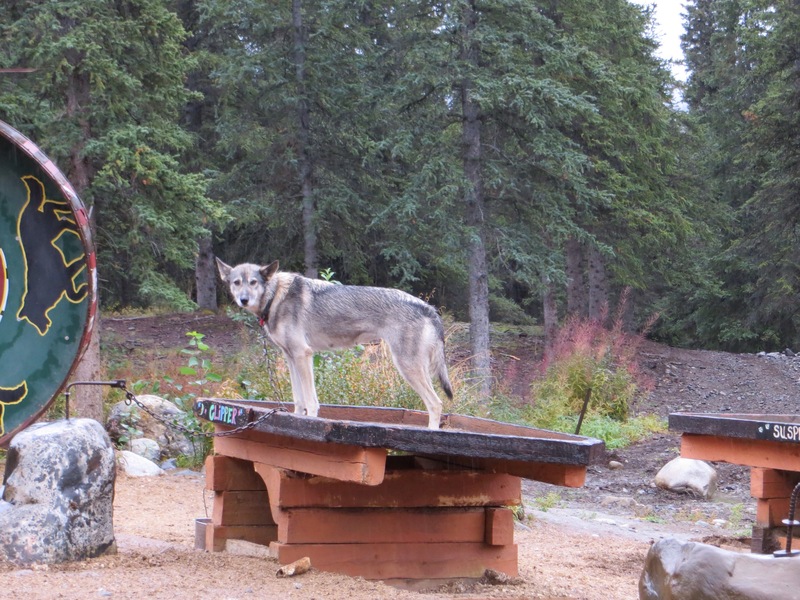 These dogs are not trained for the Iditarod but rather they are working dogs who do work in the National Park pulling sleds during winter to get the Rangers to various places in the park. 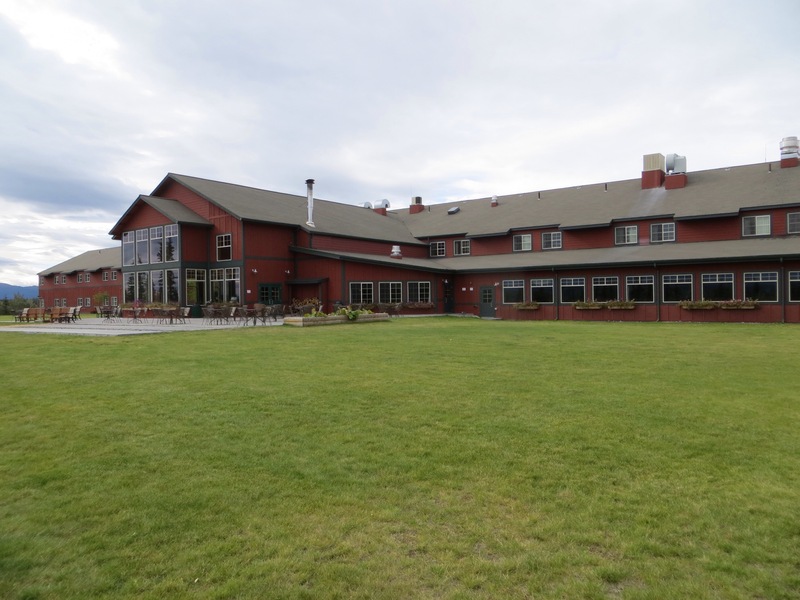 We depart the lovely Denali National Park and Glitter Gulch and it seems incredible that in a month’s time air will be blown through all the water pipes of this huge Lodge and all the adjacent hotels and shops and the place will resemble a ghost town. The seasonal workers are all leaving and just the hardy souls who live in this part of the wilderness in this amazing country will hunker down for the winter. 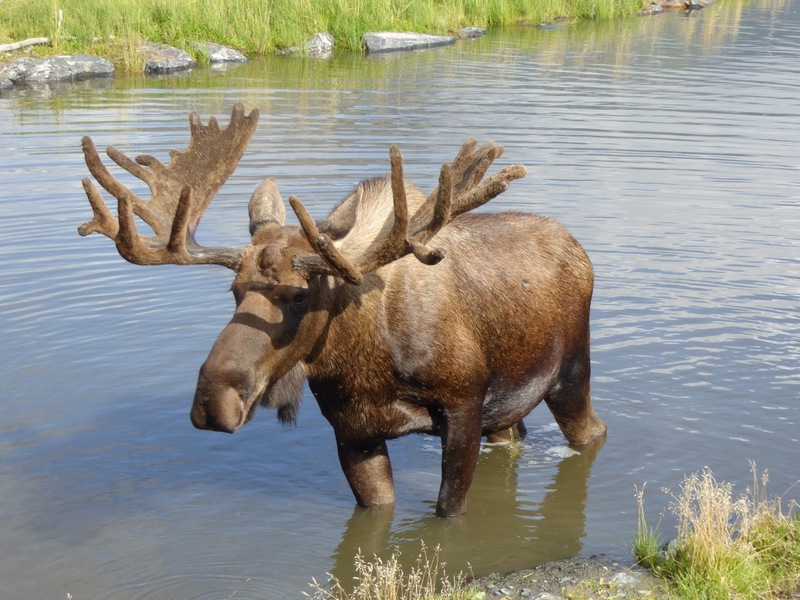 Some of the men will work over winter trapping for fur or hunting for moose and others may leave to get work on ski fields in Colorado or somewhere else. Other families will live off what they have managed to save over the summer. 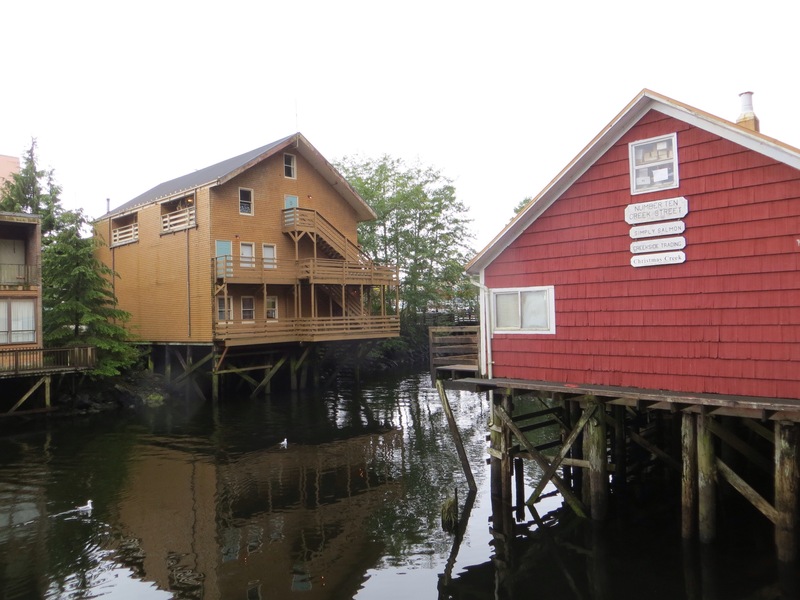 Some people in Alaska live in dry cabins – now that means no running water. Can you believe that every day they have to fetch water from a spring, river, lake or melt snow to get water. 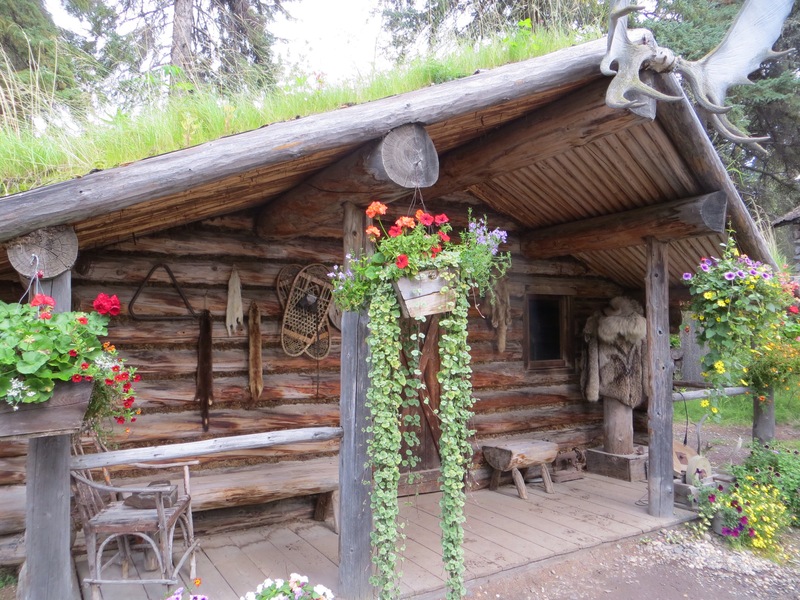 Oh how happy am I that I was not born in Alaska because I can tell you for sure that I would be writing some very interesting stories about ze bathroom if we lived in a dry cabin! Heaven forbid. 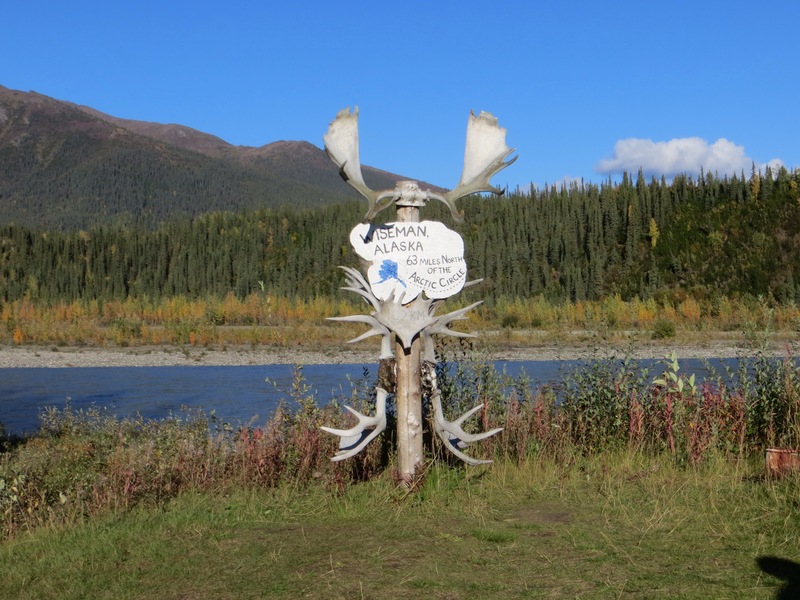 We are heading to Fairbanks passing through Healy (the coal mining centre of Alaska) and Nenana. By the way – petrol has risen to $US3-7 per gallon up here which is much more expensive than the lower 48 states (as they refer to all states apart from Alaska and Hawaii). 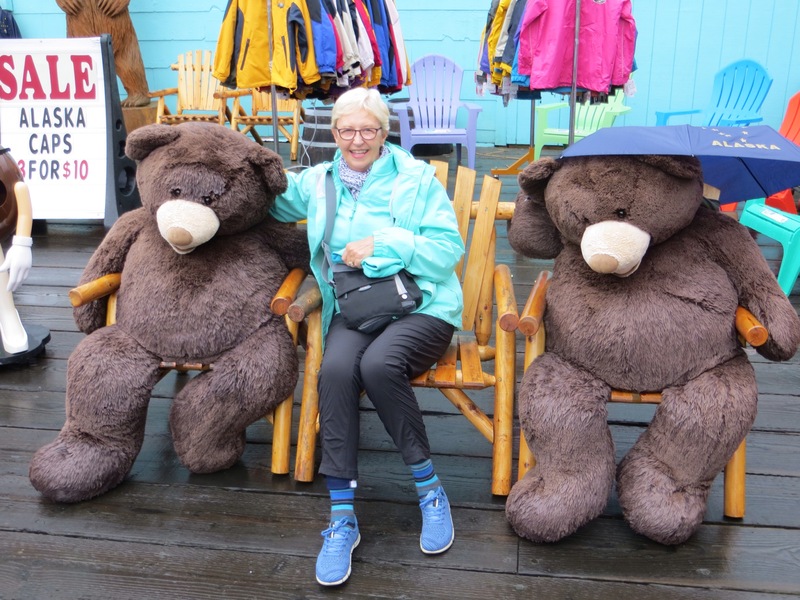 Now I must tell you – the teddies – well they have become a foursome now because a Canadian Mounted Police teddy has joined the family – obviously to keep them all from breaking the law! Now there is one thing I need to tell y’all – the one in charge of the B’s has been on the job for 10 weeks and his contract states he will get a break in about five days time. He surely needs a break because there has been a serious breakdown in the delivery of his responsibilities. He managed to “misplace” his glasses. Of course it was definitely NOT his fault (so states he!) Needless to say, he can no longer see which is a benefit to the one in charge of the P’s because, as you will know, American banknotes are almost all the same colour so how is he to know (or see) that some might be missing from his wallet! 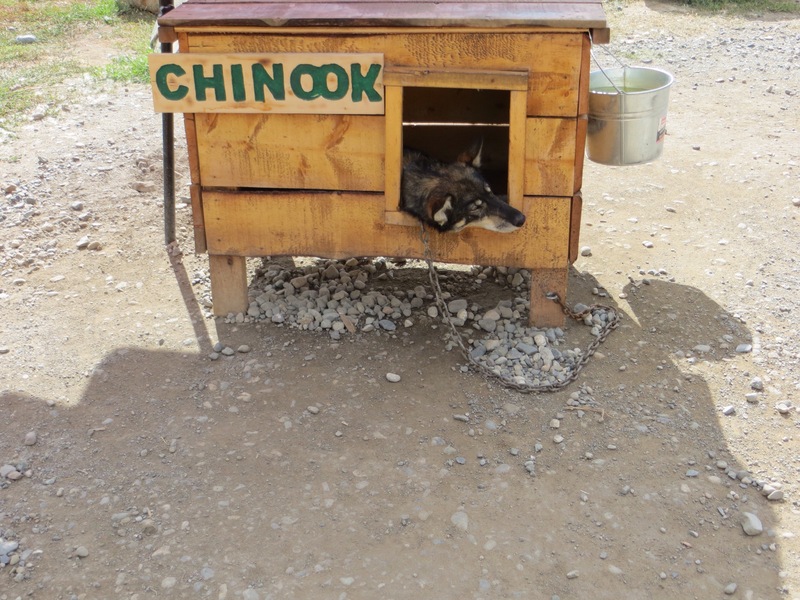 He makes several phone calls to lodges all over Alaska to no avail. But St Anthony does his job again because while I am in the shower he rushes in to tell me he has just had a phone call from the front desk to say a lady is coming to see him in our room to deliver the glasses which have arrived from somewhere else in the wilderness! He wants to ensure I don’t march out of the bathroom wearing very little or nothing at all. He has arrived in the bathroom changed out of his nightshirt into something respectable to welcome this lady so excited is he that the lady is coming. But this is sad news for me because I can no longer peruse his wallet for those $50 bills. 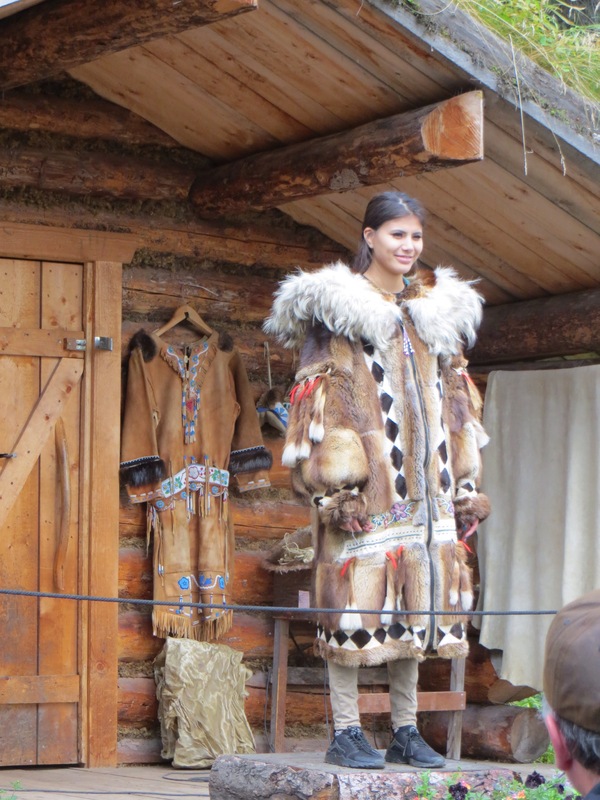 We go on a riverboat for a lovely cruise down the Tanana River seeing a huskie demonstration on the way and an Athabascan village which was wonderful. The problem here was that the boss spots a “For Sale” sign on a house and he suggests we could come here and live the “easy” life. I am sure he has completely lost his marbles. When the heck did he turn into an Athabascan I ask myself? The last time he noticed a “For Sale” sign was in the heart of the Arizona desert where I pictured us running around in thongs and now his bright idea is Alaska where we would need blimmin snow shoes and the fur of an Arctic fox around our necks! Can you honestly belieeeeeve it? 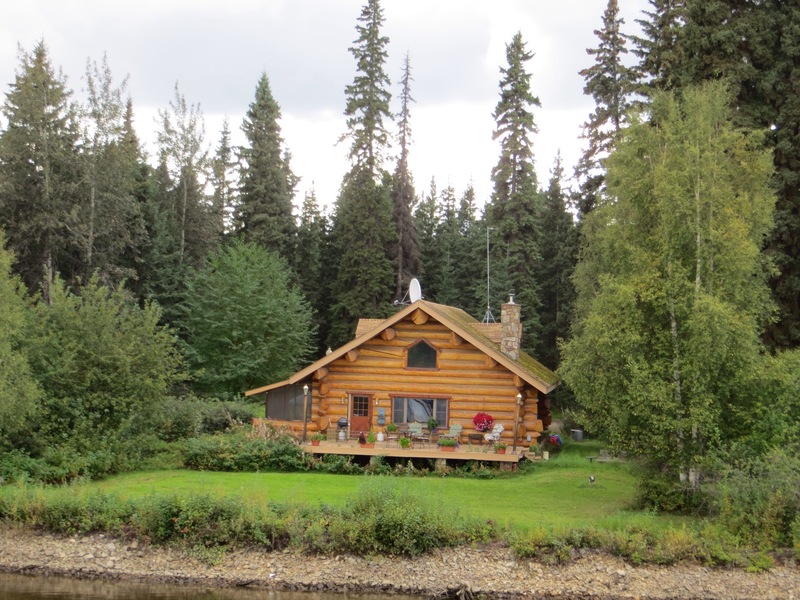 The other interesting thing we see is many beautiful log cabins with the logs extending out so that the hunted moose can hang. Now we didn’t do this at Pauanui, as you will all have noticed, because the boss is completely useless at hunting moose and I would not be letting him loose with a gun I can tell y’all. Today’s excitement is a trip to the Arctic Circle and the towns of Coldfoot (population 20) and Wiseman (population 12). 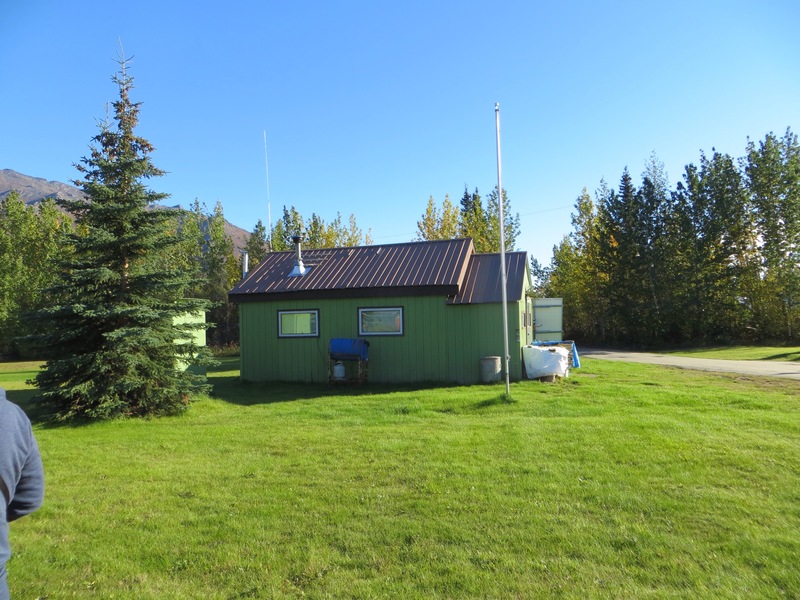 We travel just down the road to the Fairbanks International Airport which is interesting in itself. 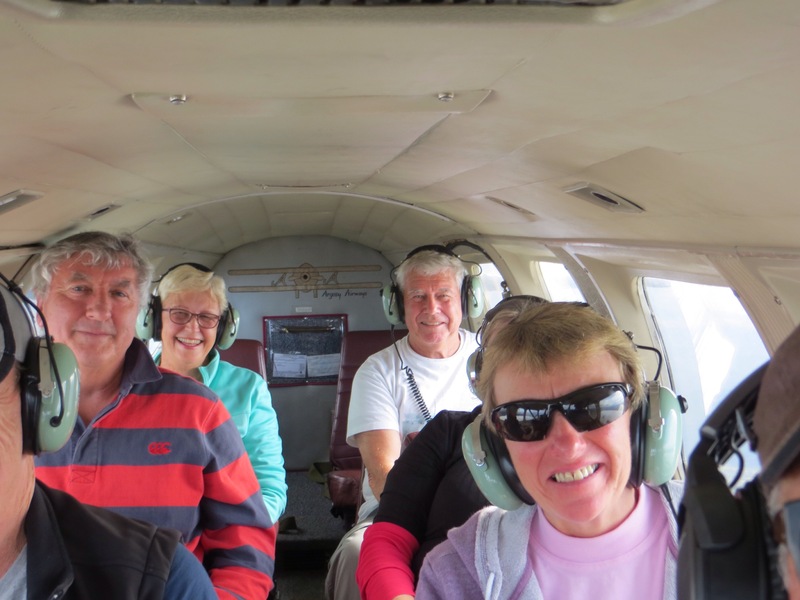 It looks like the car yards of Wairau Road lined up with small planes – there are hundreds of them and we learn that 1 in 5 people in Alaska (population 800,000) has a pilot licence. 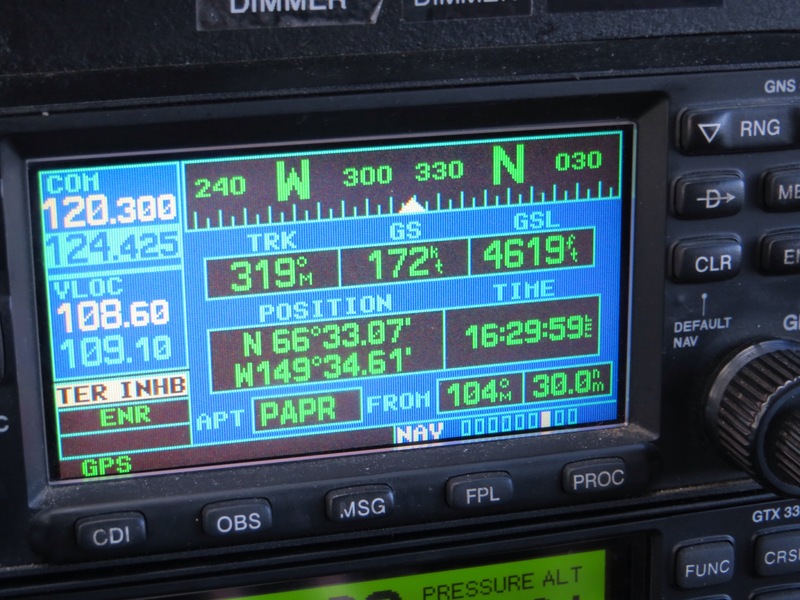 Off we go for the 1 hour flight to cross into the Arctic Circle (they call it the 66-33 parallel) and cross over the Alaska pipeline, Livenwood (an active goldmine) and the famous Dalton Highway. This highway is interesting for a few reasons and later in the trip we actually drive on it. 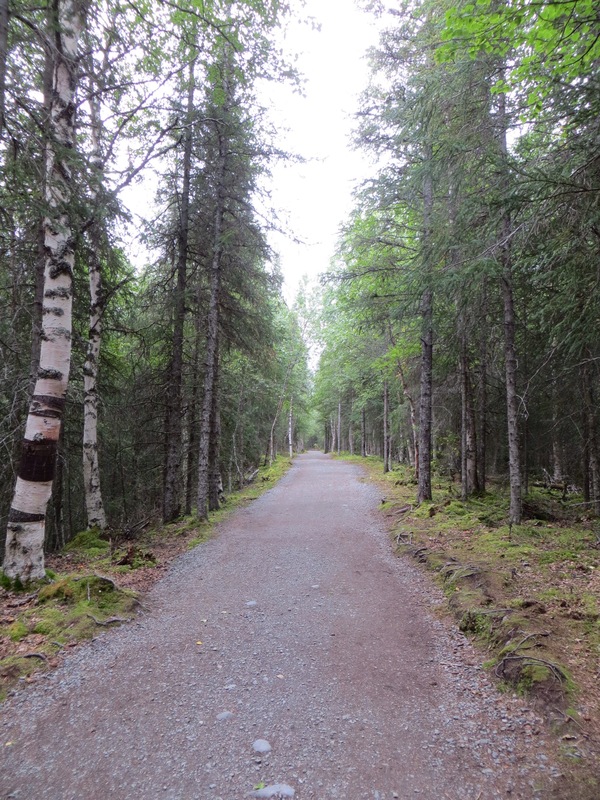 It is the only road giving access up here and ends at the Arctic Ocean; is 413 miles long and has a sign indicating there is absolutely NO service of any description for 380 of those miles – zilch! If you rent a car to travel the highway it costs $US250 per day and you are issued with one spare tyre and a satellite phone. Thankfully, the boss has no desire to do this…….as yet!! – heaven forbid! It is also the road that those TV Ice Truckers drive. 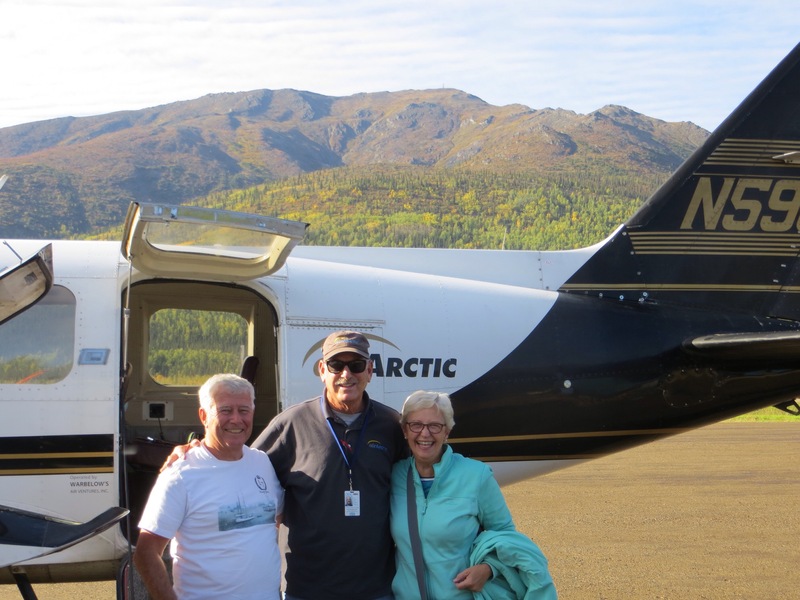 Just over an hour flying over huge areas of forest damaged by fires, the Yukon River and an Athabascan village with a population of 80 (no cars here…..no roads either), we arrive at Coldfoot. This tiny place with its tiny population experiences 33 days of the sun never setting from the summer solstice on 21 June and 33 days of the sun never rising and continuous darkness from the winter solstice 21 December. Now that summer is ending and the fall has started they are losing 10 minutes of daylight per day – over one hour per week as the days draw in towards the long harsh winter. Fuel up in these parts costs $US13 per gallon. 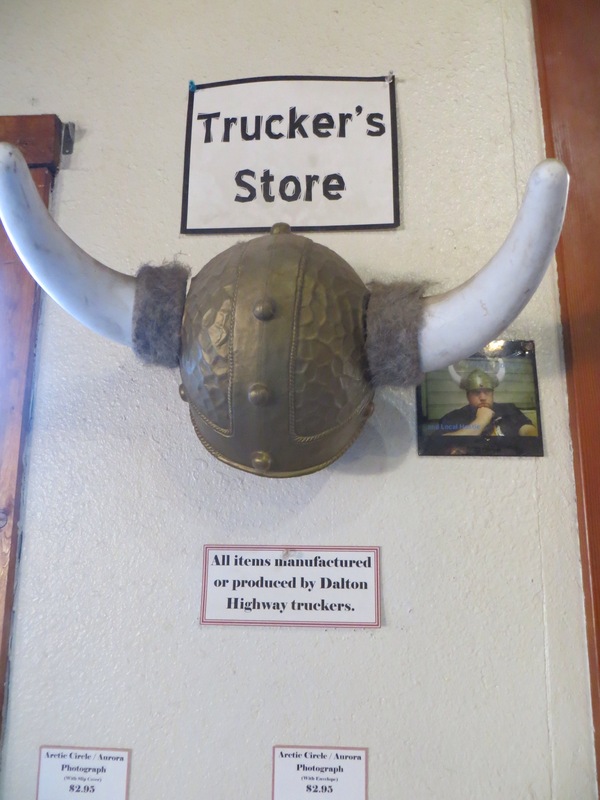 The only store here is the Post Office attached to the saloon and bar which primarily services the truckers and maintenance workers for the pipeline or other services. The white spruce trees here are tiny although old, caused by permafrost under the ground. Actually 50% of Alaska has permafrost. 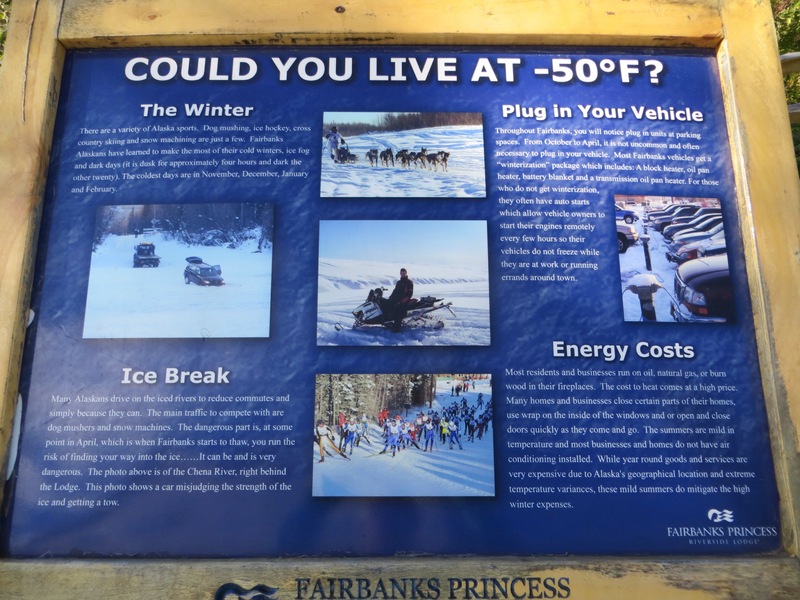 The Arctic and Fairbanks is a frozen desert – it is considered an arid area getting only approximately 30 cm of rain a year but, of course, this rain freezes so the temperatures drop dramatically. The average temperature here between November and March is 17 below to 40 below. The coldest day recorded was 62.5 below in 1971. We are very privileged because only 10,000 people visit this area per annum and we are two of them and here we are at the foot of the Brooks Mountain Range on the edge of the Arctic National Park which is 8 million acres in size. On the drive back to the little airport a black bear appears out of the bush on the side of the road so we stop to admire this fella from the wild farewelling us. At the airport we eat our boxed dinner in the saloon/cafe where those Ice Truckers sit to enjoy theirs and think how very lucky we are to have had this amazing day. Our pilot is awaiting for the flight back and we board the little plane and fly over the pipeline again and a ski area with long runs. 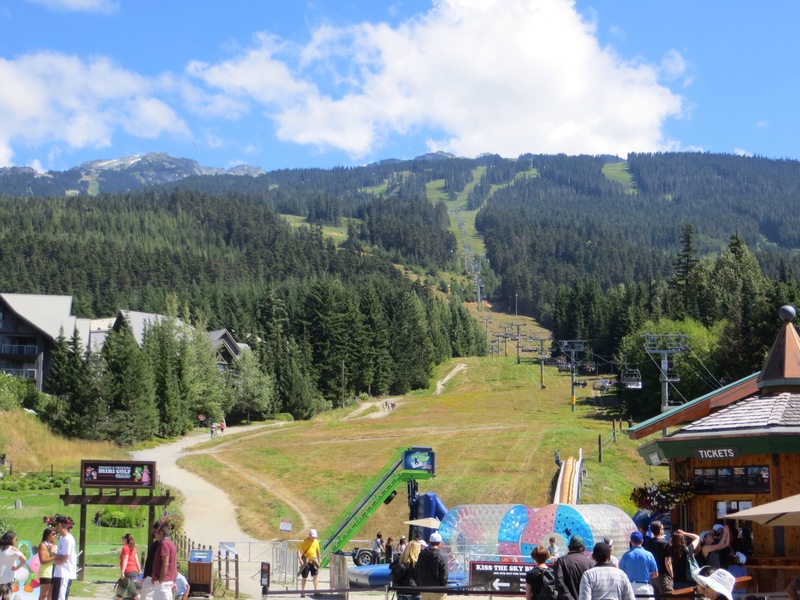 At this ski area you are driven back up the mountain after you complete your run because there are no chairlifts – the reason being that if the chairlift broke down you would freeze before they could get to you. Well, I am thinking you would be a hardy soul dressed up like the Michelin man to even ski there! This wonderful day ends our Alaskan adventure and what better way to do it. And leave as the ground starts to freeze. On this spectacular wilderness land. And those beautiful red salmon are canned. 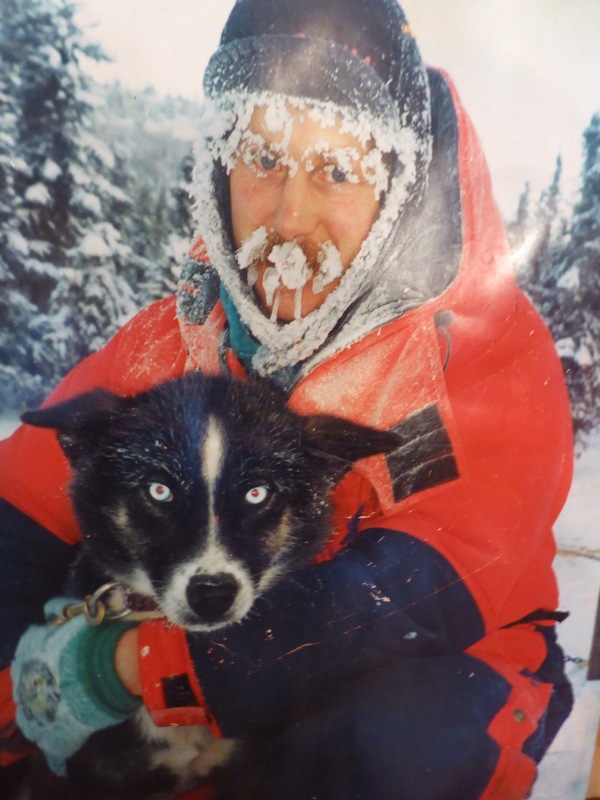 Their mushers are hardy gals and blokes. To celebrate our golden year. One more stop folks – Mickey we are a comin! The ship arrives in Whittier on a sunny Saturday morning and we disembark and meet Jim, our coach driver for this part of the tour. He gives the commentary – Whittier has a population of 300 and almost every one of them lives in a tower block of 15 stories which has an underground tunnel leading to the school over the road. No excuse for not going to school when the snow is 2 m deep! The tour of Whittier takes all of three minutes as we literally circle the apartment block and boat park where all the fishing boats are parked, a grocery store and hotel. 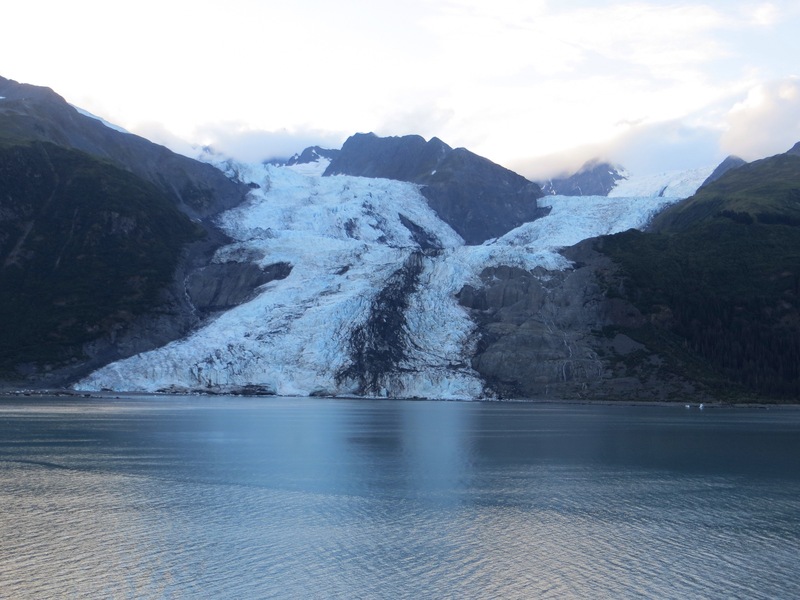 Whittier is a deep water port in Prince William Sound and this tiny place is accessed through the longest road tunnel in North America (4 km) shared with the Alaska Railroad. Every coach has a pre-determined time to travel the tunnel so we have a little time to fill in at this tiny place. We exit the tunnel to beautiful scenery of green mountains left and right with huge white glaciers spilling down the wide valleys. Salmon is spawning in the rivers and the sun is enhancing this beautiful visual feast. The bright pink fireweed is starting to go to seed and we are told this is one of the markers that snow will indeed be fallin here in about six weeks and the long eight months of winter will begin where these people do not ever see the sun in that time and have approximately five hours of daylight a day. You don’t need to be told that you don’t see shops selling bathing suits, beachwear or boogie boards in this place! Deary me – we packed the togs but I can tell y’all they haven’t come out of the case and there is no time today to ride a bore tide – darn it! 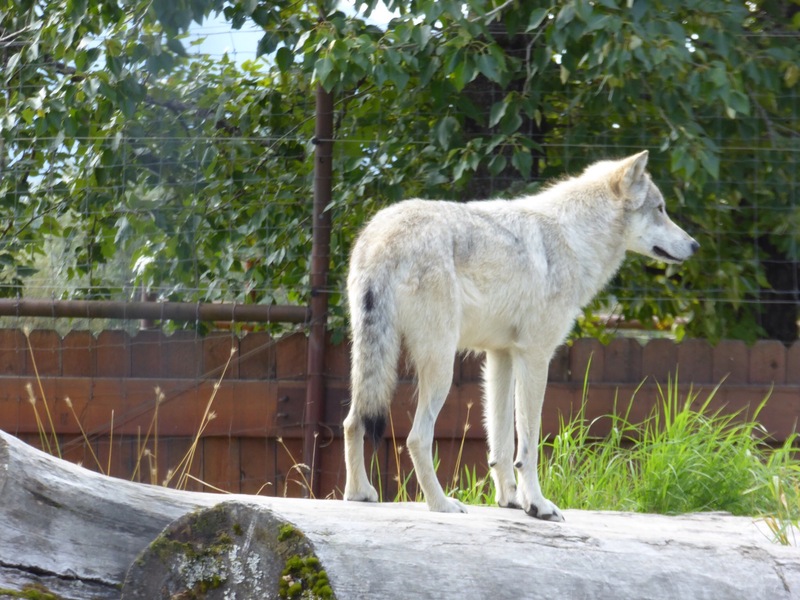 We stop at the Alaskan Wildlife Conservation Centre to view these elusive black bears, brown bears, bison, elk, marmot, Lynx, wolves, black tail dear, red fox, porcupine with lots of area to roam. Today was birthday day and our group enjoys a happy hour out beside our little log cabin here at Kenai Wilderness Lodge, perched near the confluence of the Russian and Kenai Rivers, because two of us in the group have a birthday today and funnily enough we are both turning 22 so that surely is cause for celebration! The sun is shining and our happy bunch makes the most of the happy hour out in the fresh air. 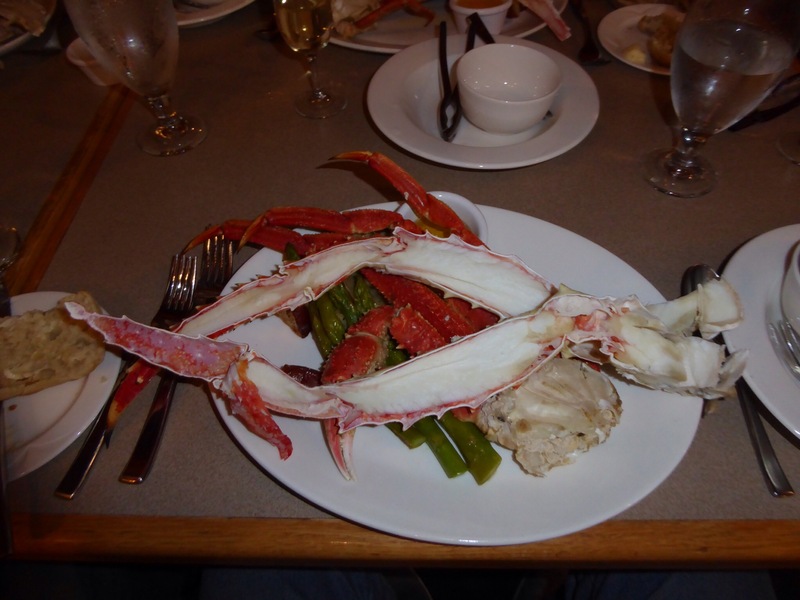 All this excitement is followed by dinner – an Alaskan experience you might say because all six of us at the table ordered Bering Sea King Crab – the biggest crab legs you ever did see accompanied by a toolbox of implements to extract the absolutely delicious meat. All this was washed down with a few glasses of bubbly and a happy day came to an end with best wishes from many friends and all the family and special grandkids. 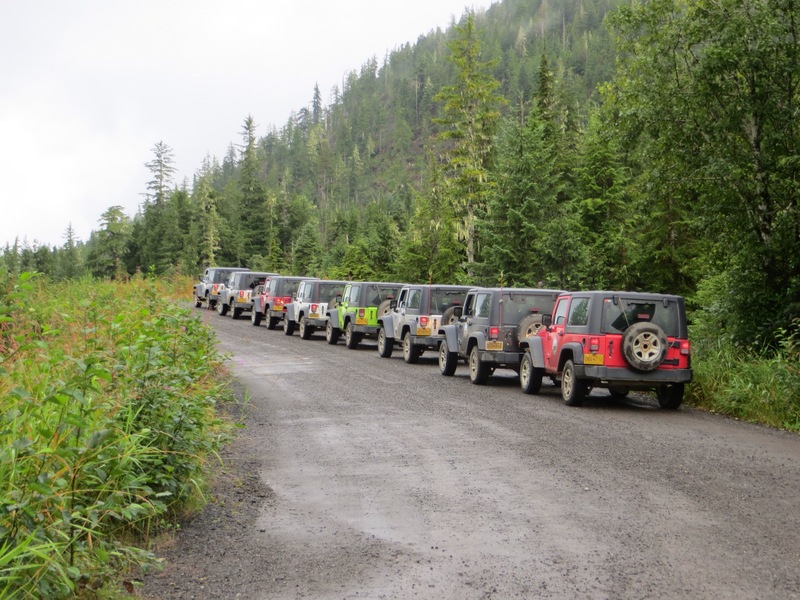 This morning we had signed up for one of the Freechoice excursions that Scenic puts on for us at most places we visit and we had chosen a four-hour nature hike so off we set to be delivered to the company providing this and two young ladies drove us out to the starting point. 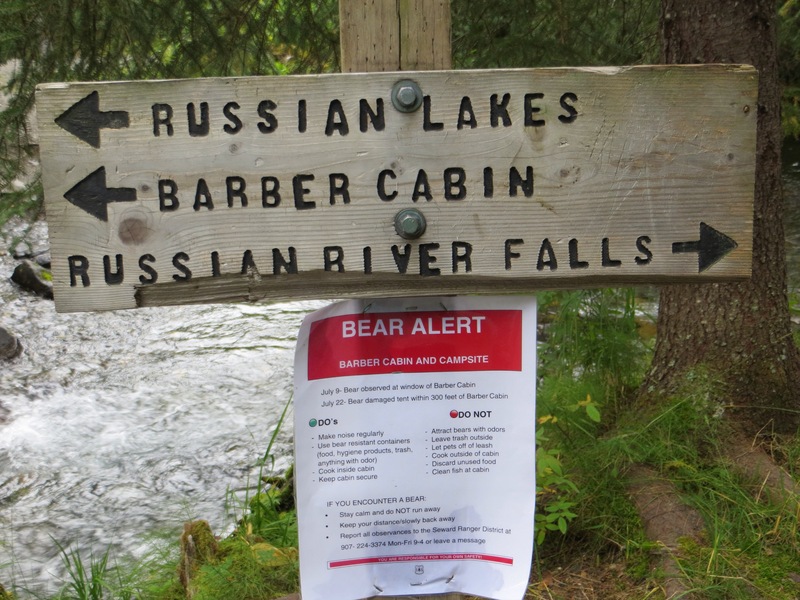 Heaven help us – there is a new Bear Alert notice at the entrance to the track so I’m thinking we might break the record for the 5-mile hike! We hiked on a nice track called The Russian River Hike to a river where the salmon were trying their very best to get upstream to spawn. It was fascinating standing on the platform watching all the activity. Then these two girls put down a tablecloth on the steps, a vase of wild flowers and an array of snacks for us to enjoy before we hiked back to spend the afternoon relaxing at the lodge. 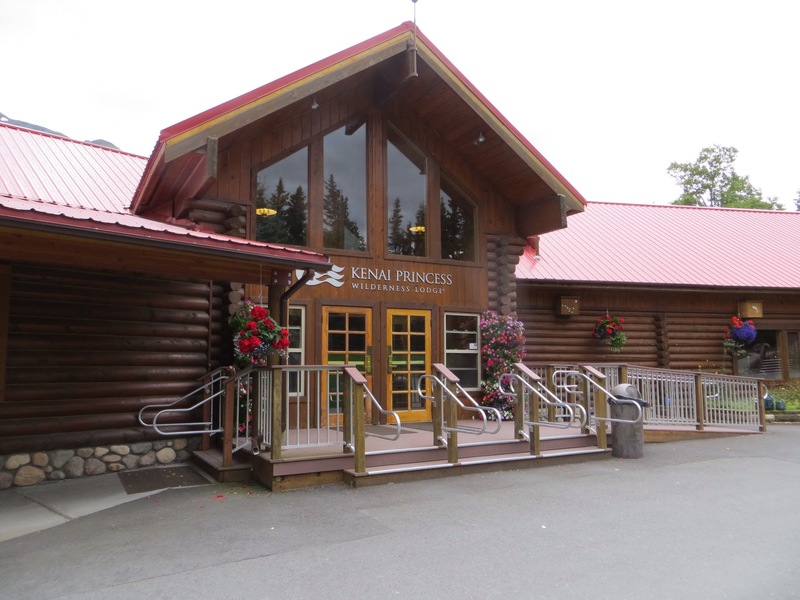 Monday today and we depart the lovely Kenai Wilderness Lodge on this rainy morning and start the drive to Anchorage. 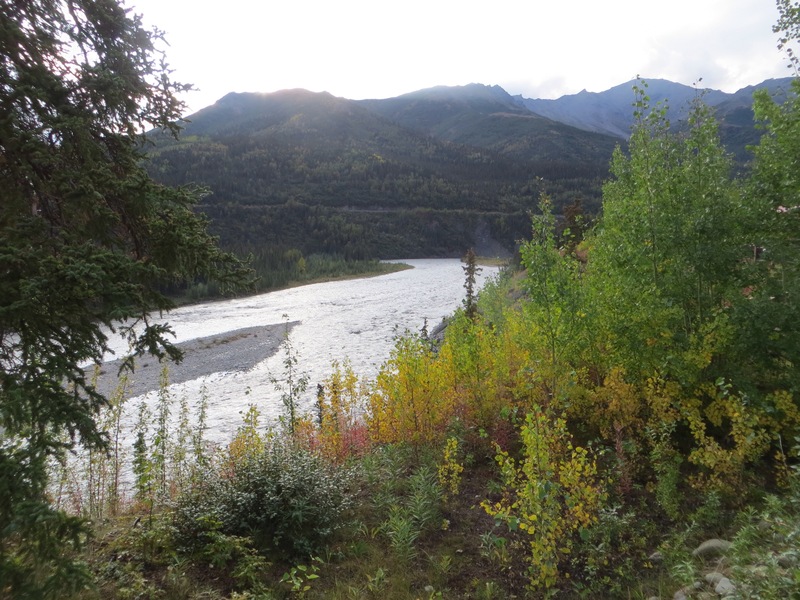 The changes in the landscape are noticeable with the fall colours starting to show up on the birch trees and the swathes of red fireweed are dying. It is interesting to talk to people here as many working in the lodges and for the tour companies are here only for the season and the season is coming to an end. 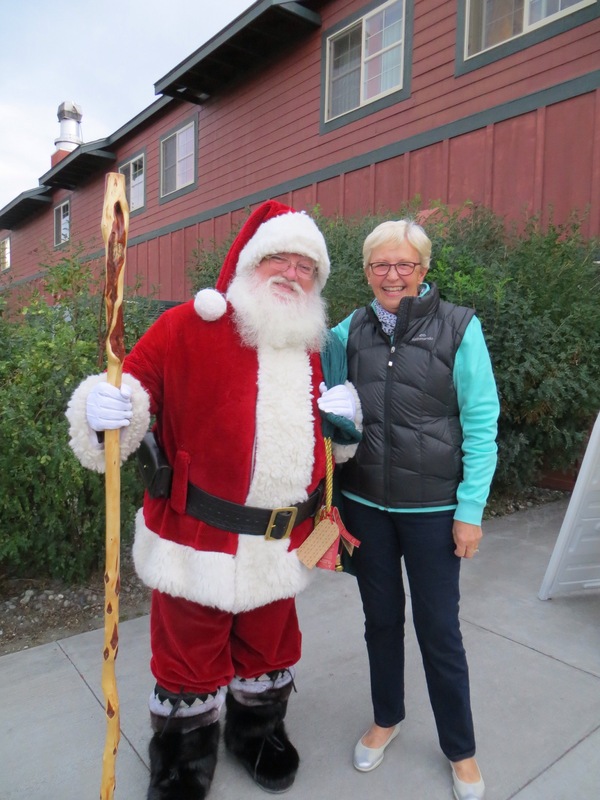 A lady we spoke to last night told us she and her husband are retired but they drove 6700 miles from their home in Florida to work here in Kenai for the season. They drove their RV, towing a trailer with a little car and a boat and they have loved the season here and are thinking of returning next year. As we get to the Turnagain Arm the tide is coming in and we witness a bore tide where a wave forms on the incoming tide and that wave can continue for a few kms so the surfers love it. 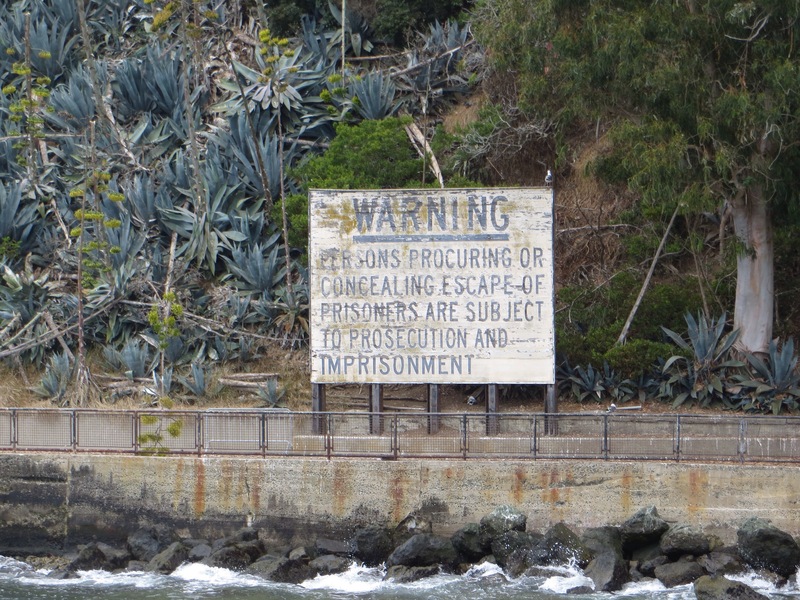 But my question is – how many surfers are livin ‘ere? The coach driver Jim tells us that the Beluga whales can often be seen here and no sooner are the words out of his mouth and one surfaces and as we drive along the coast several more pods surface to our amazement. We continue on and the bald eagles are also staring at us from their perch at the top of the trees. There are many many dead trees with their feet deep in salt water as a result of an earthquake which caused the road to sink a few metres. We stop in Anchorage for lunch. The city centre is about the size of Hamilton and it is a busy place. 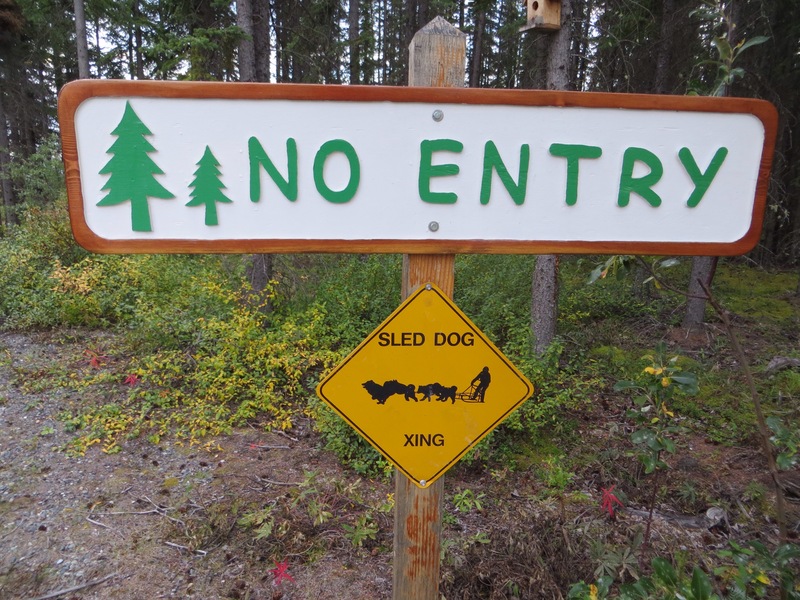 We stop at the official start of the Iditarod Trail but we are also told that last year they had to truck in enough snow so that sleds could actually start here. There are two airports here and an awful lot of planes because many places in Alaska are not accessible by roads so the planes are kept busy. The streets are named A, B, C, 1, 2, 3 here in Anchorage – easy! After lunch we set off towards Copper River and we are now travelling on the third of the Alaska’s three freeways and a busy road it is. All vehicles must have their headlights on when on the main highways and freeways by law. We pass two very large military bases up in this part of the world and we are reminded that Russia is very close by – in fact it is only 50 miles from Alaska! 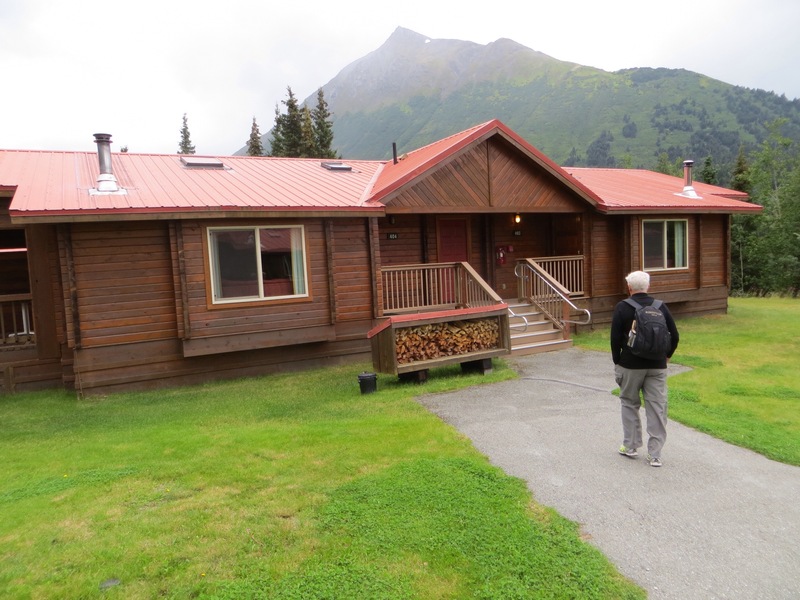 We arrive at the beautiful Copper River Wilderness Lodge in a very pretty setting looking out to the mountains which are sprinkled with snow. We could easily be in the South Island and it is reminding us of Glenorchy. 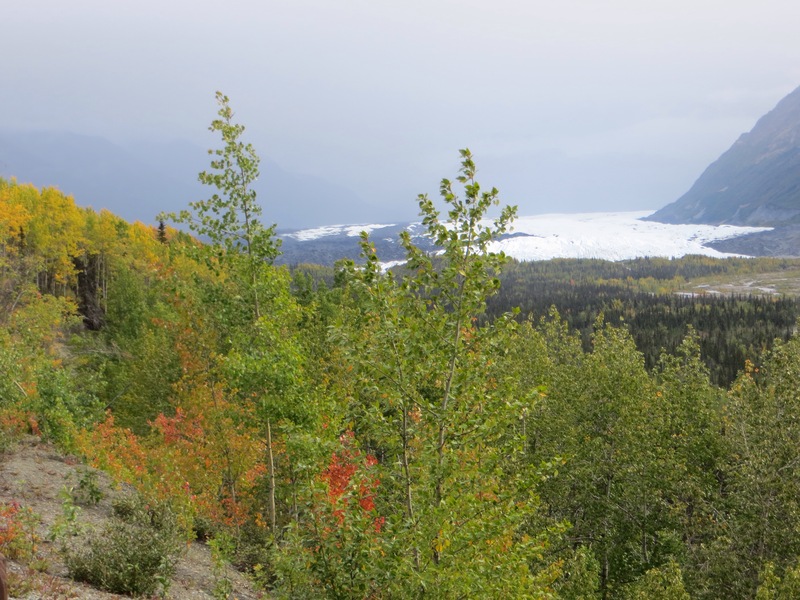 The Lodge is situated beside America’s largest national Park, Wrangell-St Elias and the area has a rich mining history. 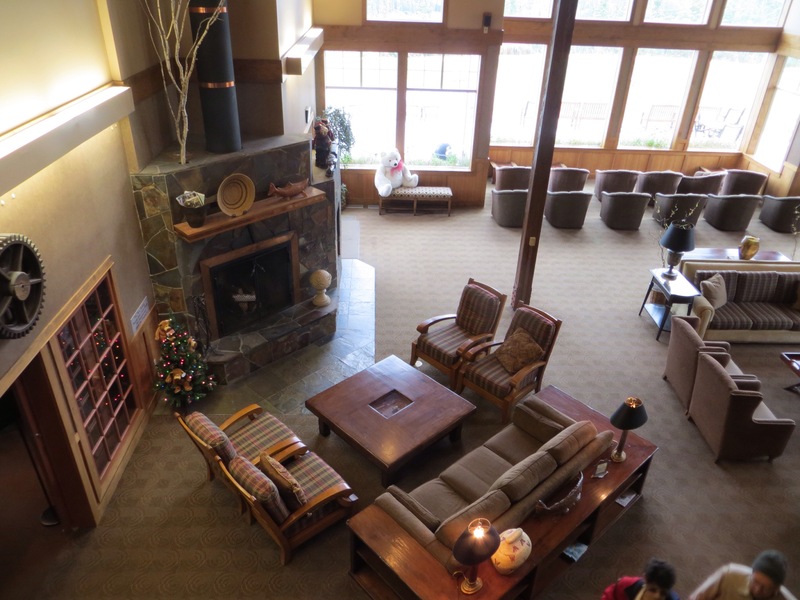 They are also celebrating mid-winter Christmas here so the Lodge is all decorated up with Christmas trees and lights, Christmas music, the fire is roaring in the lovely lounge area and Santa is visiting tonight. We have two days here in this beautiful setting so this morning we set off for a little nature walk through the bush. The aspen trees are very tall and the fall colours are still evident even in the bush. At 8.30 pm there is a flag lowering ceremony outside the main entrance of the lodge so we all go off to witness this. The music is playing and the flags are slowly lowered – the final flag is the American flag lowered to the national anthem. One veteran present was selected to accept the folded flags and put them into the box and at the end of this rather emotional ceremony about eight veterans who were present were asked to come forward and accept a miniature American flag. 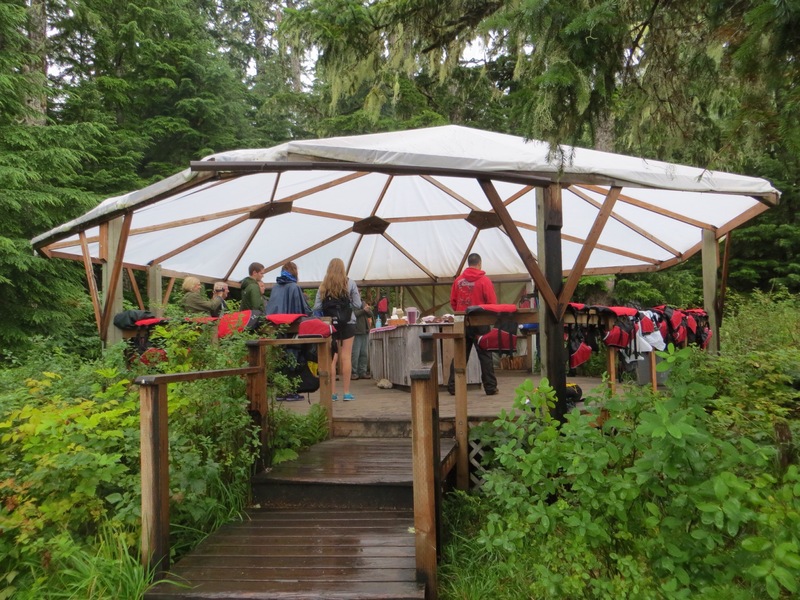 After lunch we head off as a group to the Wrangell-St Elias national park. Now this national park is the largest in America – it is also bigger than Switzerland in size with higher mountains. It has a total area of 13.2 million acres. 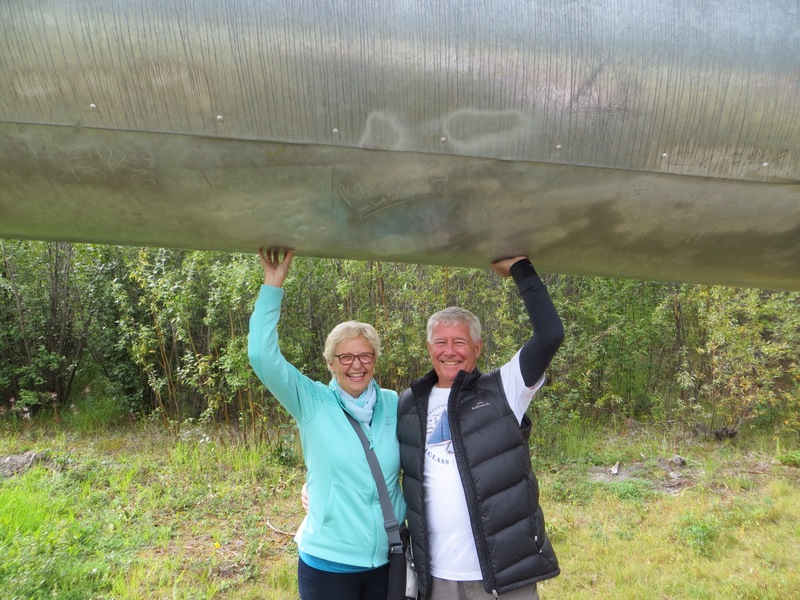 On the way to the park we make a stop at the great Alaska oil pipeline which stretches 800 miles or approximately 1200 km in length. 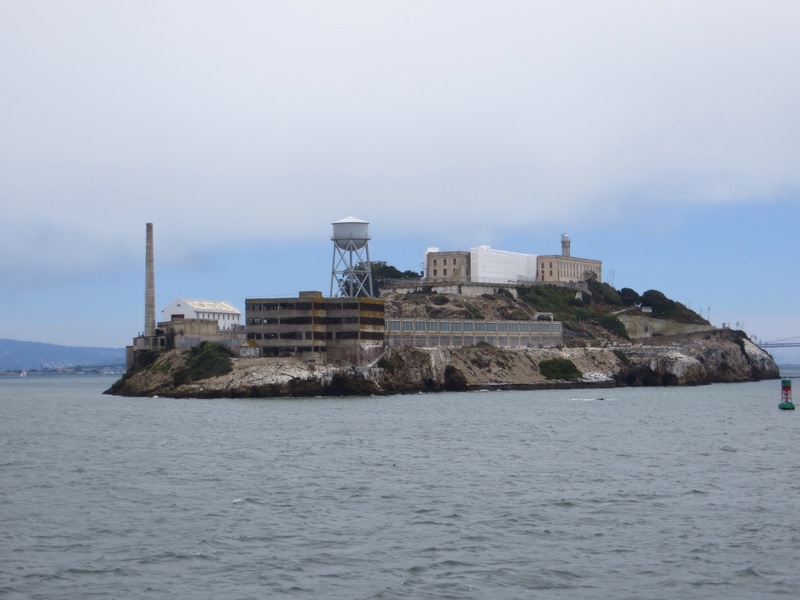 The building of this began in 1975, finished in 1977, cost $8 billion and was privately funded. When it was built it was considered to have a 30 year lifespan but it is still being used although many of the oil fields have closed. It crosses three mountain ranges and over 500 rivers and streams. When it was being built there were concerns that the line would hinder the caribou migration but the caribou have grown to like it often settling under the line when the ground starts to get cold. We were told that in winter the pipeline is slightly heated so the oil will keep flowing and was built to withstand an 8.5 magnitude quake and has, in fact, been subjected to an 8.3 magnitude quake. It is truly a clever example of engineering. 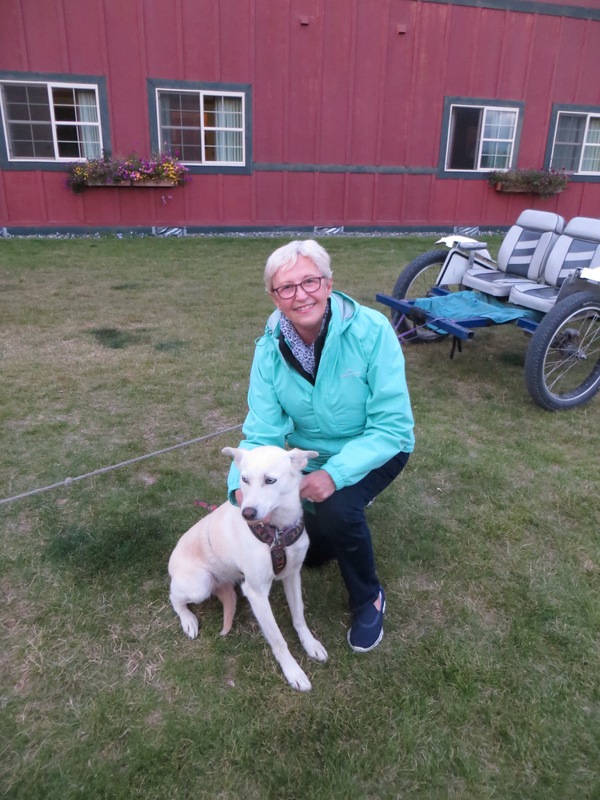 We return to the Lodge to see a film on Aurora Borealis and then, after dinner, the sled dog ride. Well, goodness me – this was a highlight. 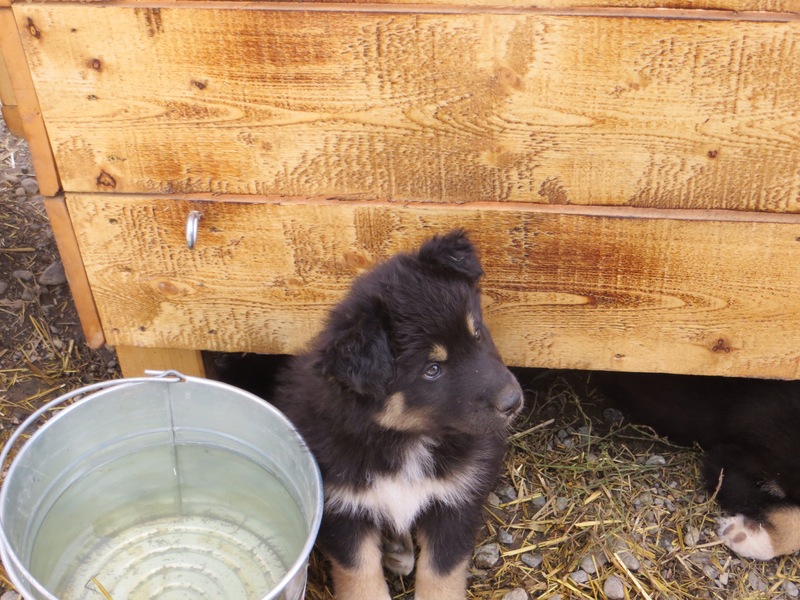 The guy running the sled dogs is an interesting character – he lives with 20 dogs and I am thinking his living conditions are pretty basic. He tells us that he hasn’t left the area for 10 years; originally was a truck driver and then got a reputation for looking after dogs very well. Before he knew it he was getting calls from far and wide to take another dog. These dogs respond just to his body language and a few words and he certainly has a very close connection with them. We board the “sled” which is a very comfortable vehicle on wheels for the dogs to pull. 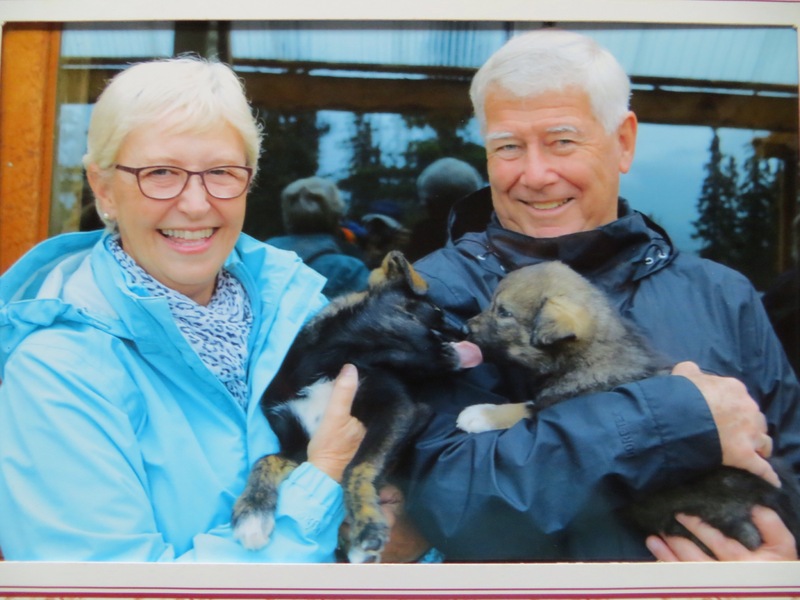 He links three dogs up to do the first run and then we go back to the base to collect the 6-month old puppy to add to the mix. These dogs are so eager to get to work – they get so excited at the thought of pulling us and this guy hasn’t even asked how much we weigh (thank goodness for that because we told you about the shrinking clothes and we are not keen to go anywhere near any scales!) 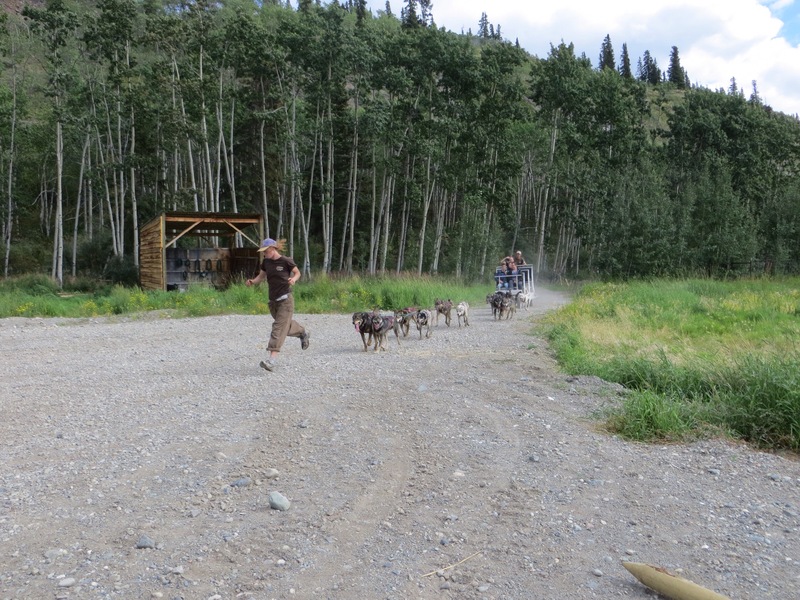 Off we go and we are loving it and these dogs are loving it and the musher seems to be enjoying himself too. 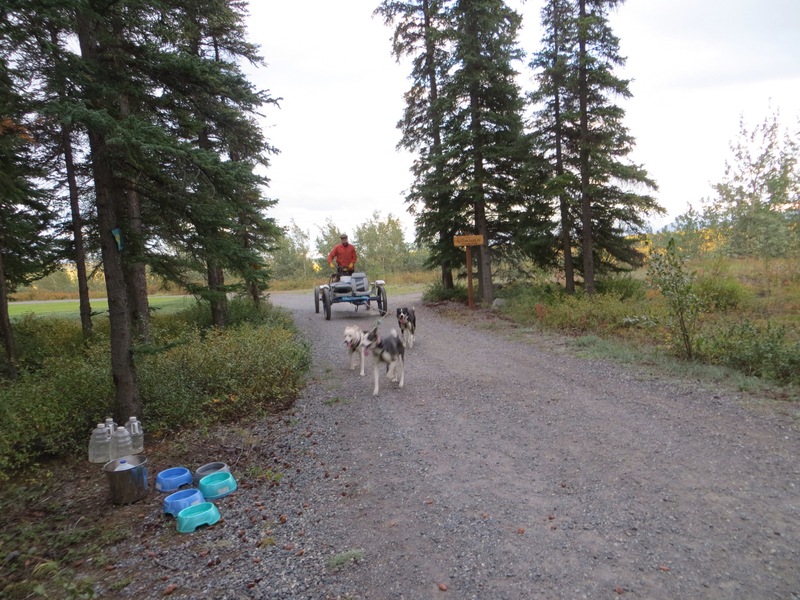 We stop again – the dogs get ice in their bowls this time and this is a real treat for them. By this stage some of our group is standing outside the Lodge waving and awaiting our return so that they can pat these beautiful dogs. We are so pleased we did this even though there was no snow on the ground! And to our relief the dogs pulled us easily so we are thinkin we are lighter than we thought! On we go now to Denali and the last few days of this absolutely amazing adventure. 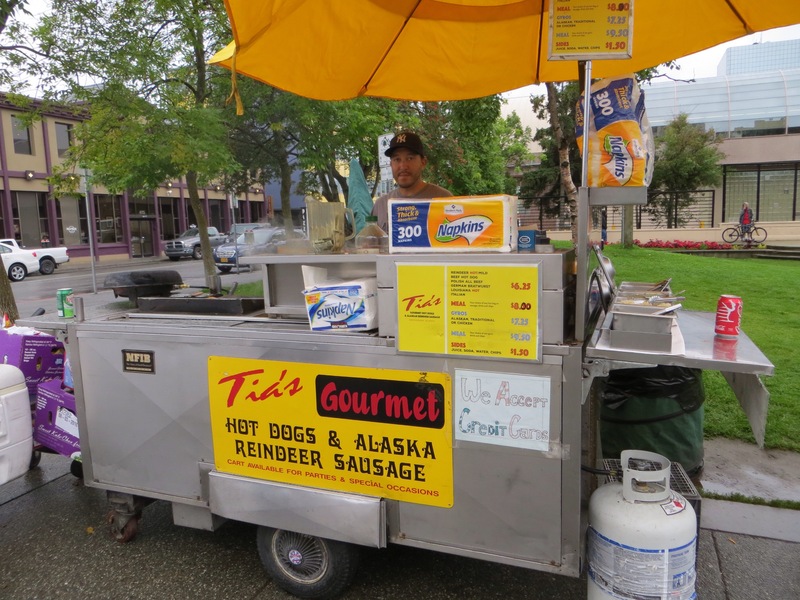 And no – we didn’t have a reindeer hotdog because we knew Oliver and Isabella would never forgive us if we did! Yes it is north to Alaska and I can tell you the rush is on because it is a highway of cruise ships making their way up the Inside Passage and our first stop in Ketchikan has five ships lined up like it is a parking lot. 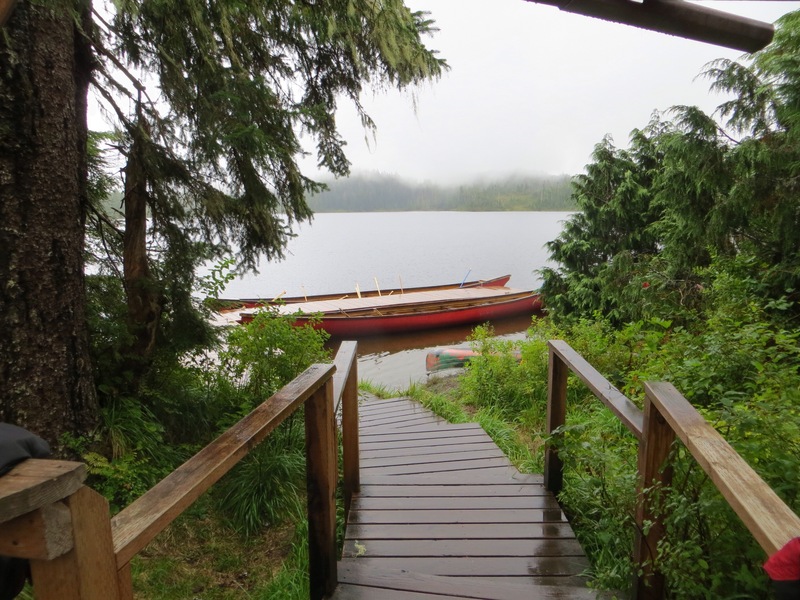 It is a misty day with a little drizzle in Ketchikan but I can tell y’all that this place gets around 4 metres of rain a year so it seems to me that arriving here on a brilliantly sunny day would be a very rare thing. 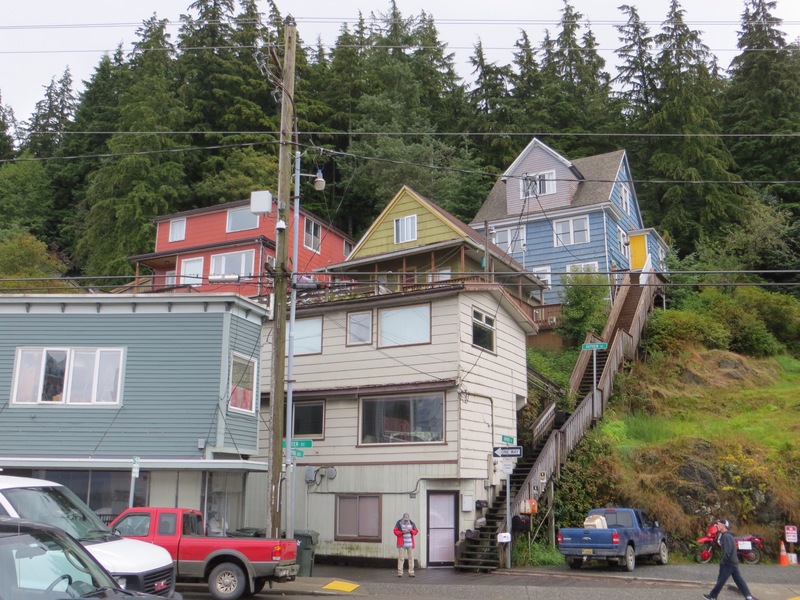 Ketchikan has a resident population of about 8,000 but in the tourist season which runs from 1 May until 30 September that population rises to 13,500. In the peak summer months the temperatures “peak” to between 15-18 degrees! Great – the sunscreen and big hat can go back into the bag! 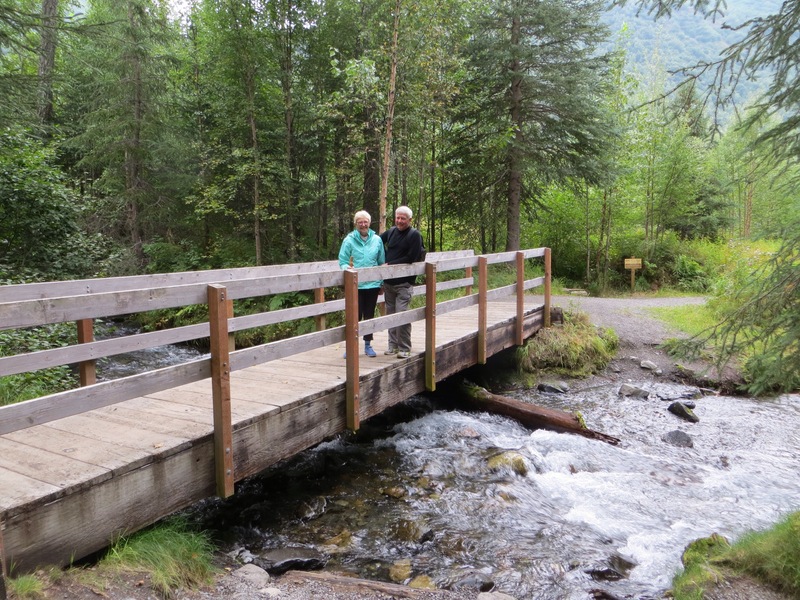 We survived the journey and came back into town to have a look at the famous “Creek Street” – an historic boardwalk which was a Red Light District during the Gold Rush. 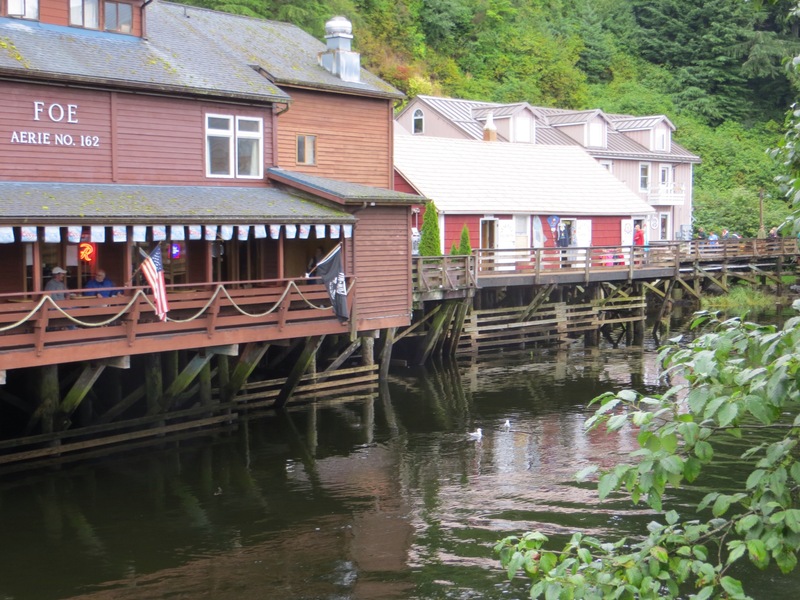 The shops are propped up on stilts above the water and there are some huge salmon running here just now. The houses propped on the hill by the dock are quirky wooden houses, painted in all sorts of colours and some have hundreds of stairs to get up to them. Many are in need of a repaint but whenever would they get a fine day to get up the ladder? 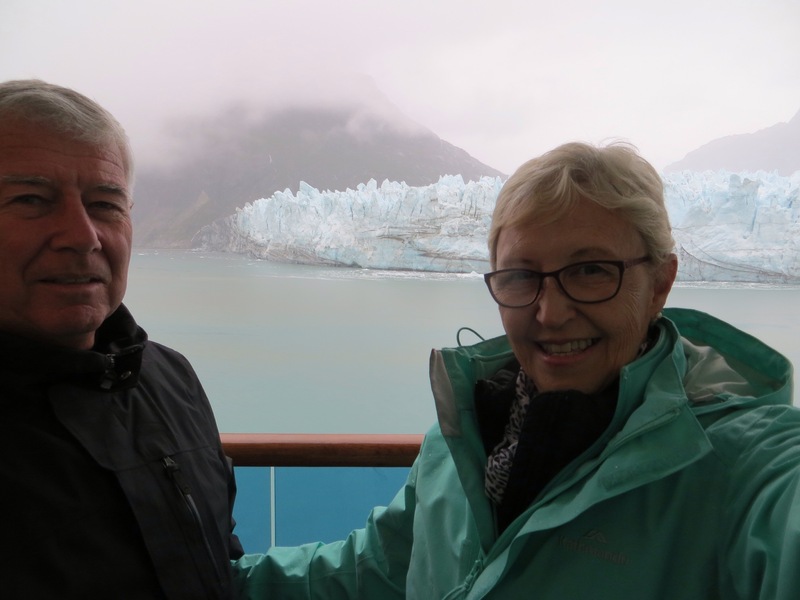 We set sail at 2 pm and sit comfortably on our deck with our cuppa to observe all the action as our ship departs Ketchikan to sail the 240 miles to Juneau where we arrive in the morning. One little piece of trivia we were told about was that Walmart opened a branch here in 2000. There was so much excitement all around that people travelled from far and wide and they sold out of everything in one day. They had to wait a week to get stocks in by boat so they could reopen! We wake up to another misty morning here in Alaska in the city of Juneau – the only US state capital accessible only by boat or plane. 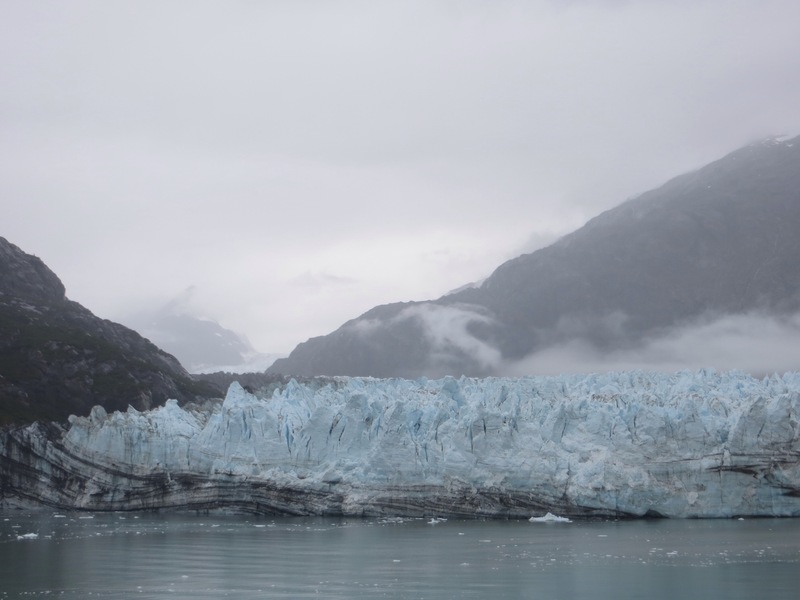 Juneau is the rainiest city in the USA with approx 4 metres of rain per annum. It has a population of 8,200 residents but that increases in the cruise season to 14,000 so similar to Ketchikan in that respect. 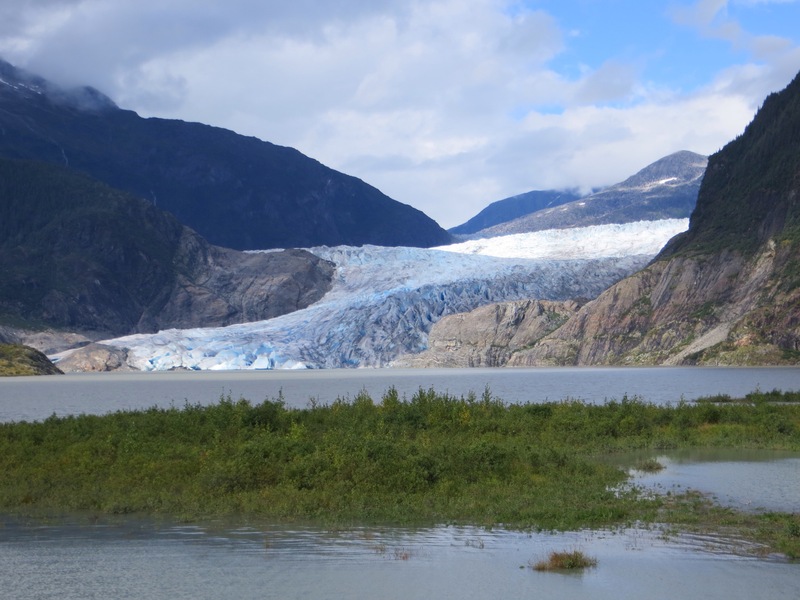 If you travel the roads here you soon get to the end of the road because Juneau is surrounded by Icefields and hundreds of glaciers. We set off after breakfast for a walk into town to explore this bustling metropolis – it is the commercial centre of Alaska. There are more boats than cars here and the airport is on an island so you actually need to get a boat to get to the “international” airport – it has that status because occasionally a chartered international flight may possibly land here. It may land but I don’t know how it takes off because it looks a pretty short runway to me. The shops open here 1 May and 90% of them close 30 Sept at the end of the cruise ship season. However, because the second smallest Walmart in the world is here and supermarket, drug store etc many Alaskans will pay the exhorbitant fees to get a boat here or a float plane to stock up on essential supplies every 3 months or so. We have been told that Princess cruise line actually owns a large number of shops in the towns up this coast and, for some crazy reason, there is an absolute abundance of jewellery shops in every town. 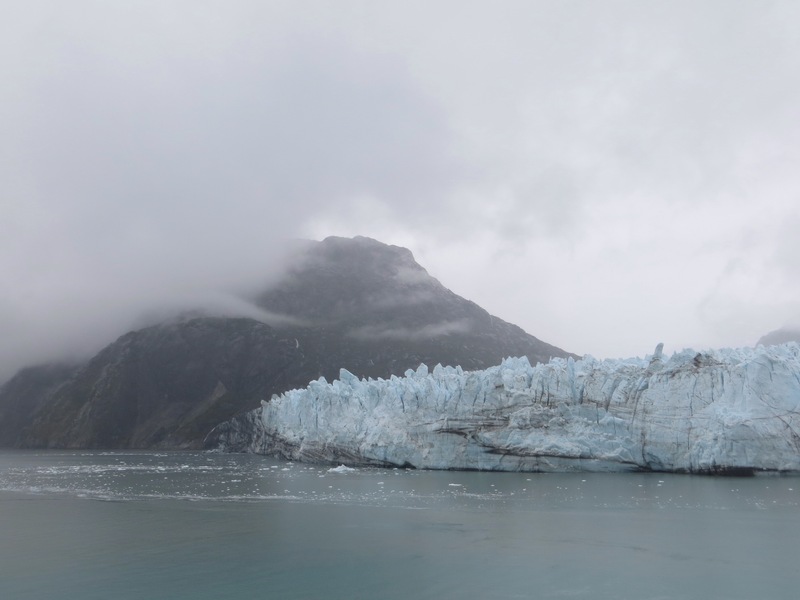 We set off today to the Menenhall Glacier – a glacier which is the overflow from a huge icefield and sadly receding and, like most glaciers, it moves and displays a massive power of erosion as it has ground its way through the landscape. 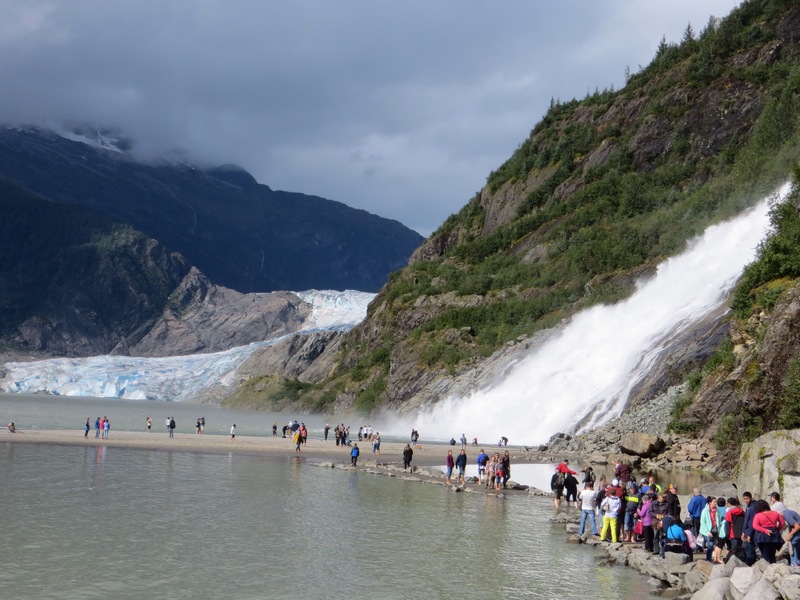 We do a nice 2 mile walk to the glacier and back and a lovely waterfall and then a visit to the rather lovely Visitors’ Centre. 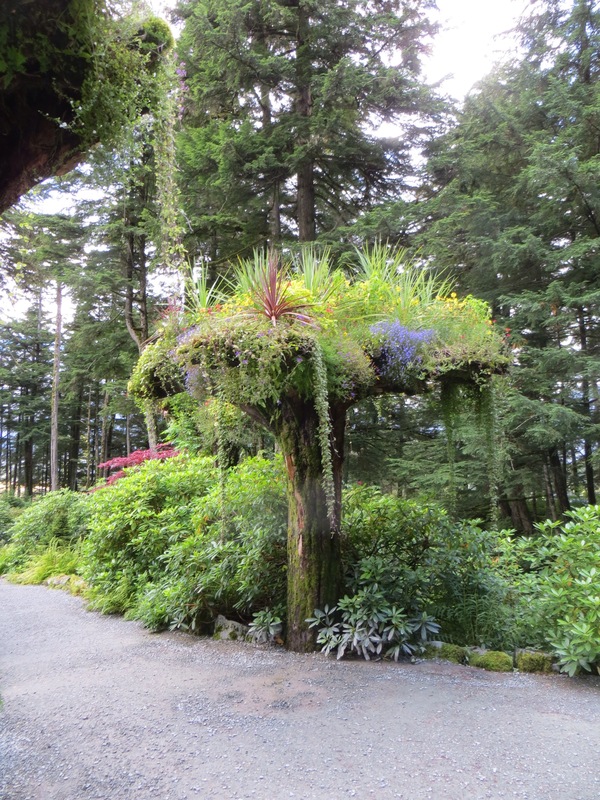 The glacier is only 30 minutes out of town and on the way back we visit the Glacier Gardens which is a unique garden of many upside-down trees (replanted dead trees) planted like huge flower pots and we climb up high in special vehicles to get to the top of this special rainforest to see views of Juneau. This morning the boss pulls back the curtains and we are almost hard up against a Rocky Mountain surprise surprise! The sun is also shining – another surprise. 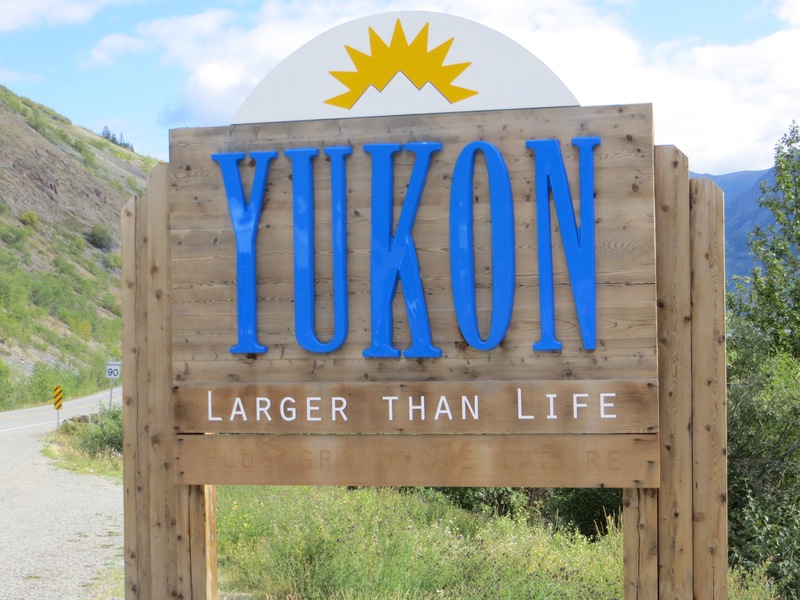 Our adventure today is to the Yukon Suspension Bridge and White Pass Summit so off we set to cross the border into Canada and explore a small part of the Yukon – yee ha! We discover that the water here at the wharf is an astounding 500 feet deep and it is 2000 feet deep in the channel so I think we are OK! We are amazed at the “graffiti” on this rocky wall but we discover that the tradition has been that when a ship has arrived here for the first time the adoring crew have painted the name of the ship and the captain over many years and this has formed a patchwork of history of the ships that have come here. This little town has 900 residents and is a heritage town where the authorities control the “look” of the shop fronts and people do not have physical addresses, churches are painted different colours – the red church, the blue church etc, there are no doctors or dentists but a medical practice run by nurses, the average price of these small simple houses is expensive at around $US250,000 and the “international” airport is the largest unmanned airport in the world! Heaven forbid! 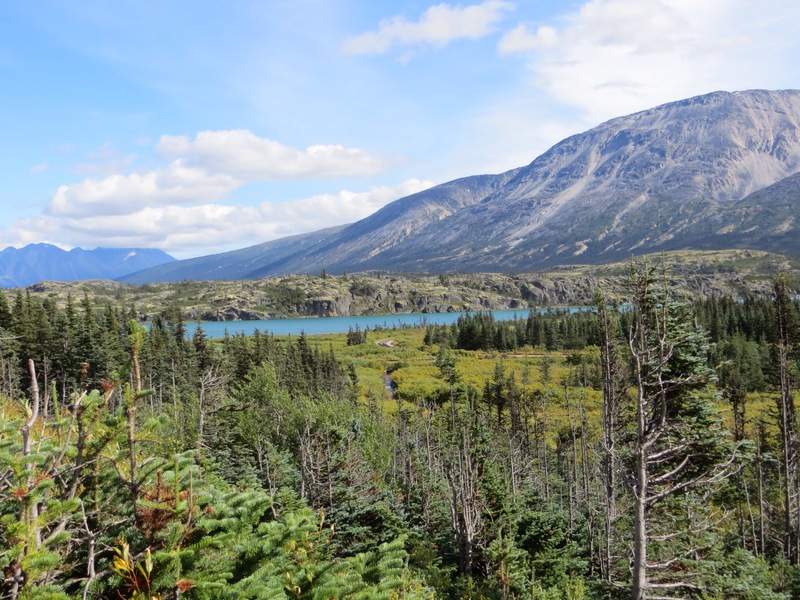 Off we set down the Klondike Highway built in 1978 and we climb 3992 feet (I am a little “over” the feet/inches/gallons thing here and wish they would change to metric because my brain is doing the sums all the time) to get up to White Pass Summit in the sub-alpine tundra. Well, I can tell y’all that it certainly was White Pass Summit this morning because we didn’t see anything but thick thick fog. Now just to wake us up the lady in the seat in front of us suddenly decides to change her clothes and she stripped down on top to less than you would think would happen on a coach full of people. Can you honestly belieeeeeve it? And don’t get excited because I didn’t have the camera ready for that! 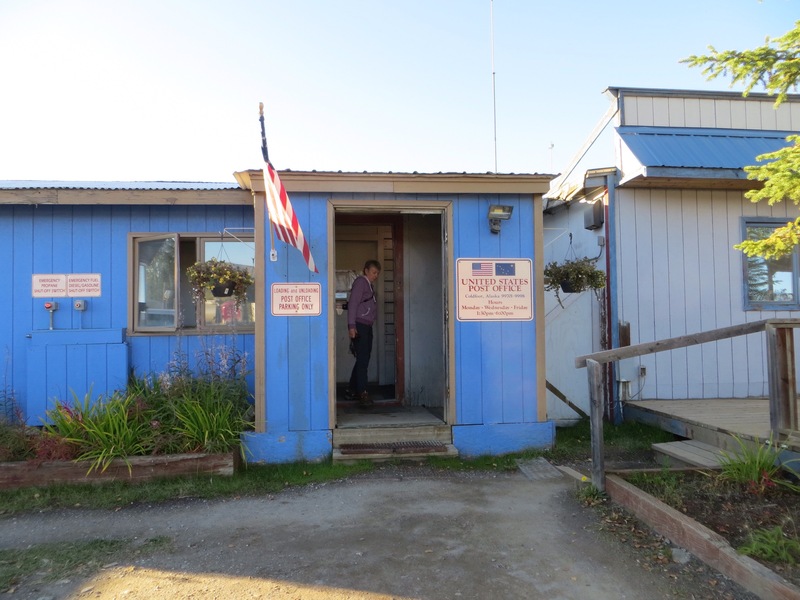 We arrive at the border to Canada and this little outpost is in an area which gets 36 feet of snow in winter. Now honestly – would you want to be posted here for 2 years checking passports and frowning at people all the time? There are snow marker poles all the way up the side of the road here because, miraculously, the authorities keep this road open all year – what? What the devil do you ride in I wonder? 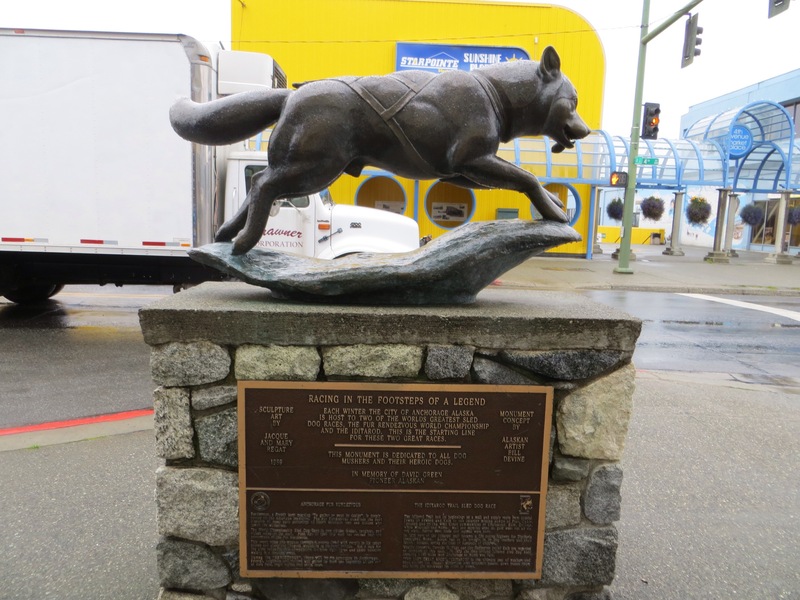 We arrive in Fraser, British Columbia which has a population of 15 (not a typo). Well, I guess they know one another pretty well. 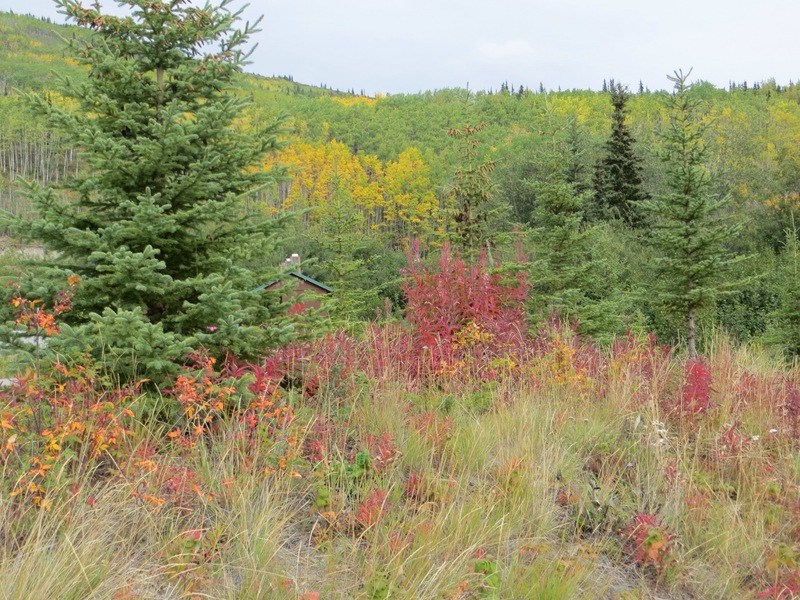 The black spruce trees are stunted, crooked, are almost hugging each other they are so close together, have very little foliage and are struggling in this harsh climate but as we wind our way down through the valley they are looking a little healthier. 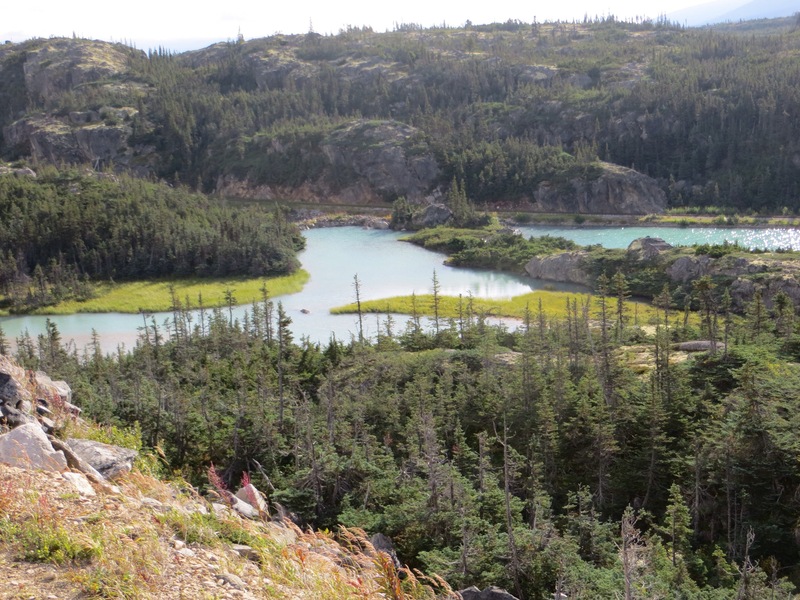 In this rather beautiful area there are lots of very blue lakes, very high sawtooth mountains of grey granite striped with a few streaks of iron oxide and Quartz. 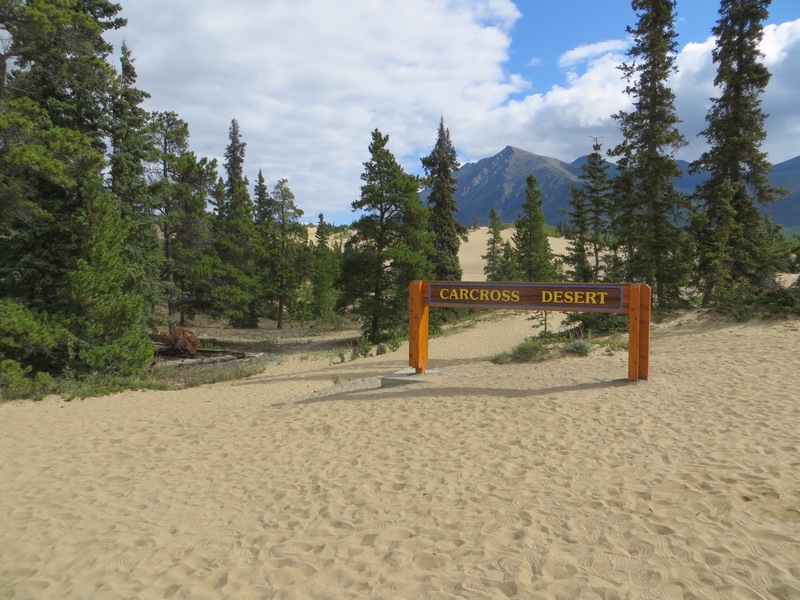 We travel on through the Yukon to Carcross which was formerly known as Caribou Crossing with a population of 300 hardy souls who manage to survive an eight-month long winter. To our huge surprise we come upon a 1 square mile desert which millions of years ago used to be the ocean floor. I must mention that there is often mention here of climate change and what it is doing to the ecosystem here. At Caribou Crossing we get a “small” lunch (yeah right) of the biggest chicken thigh we have ever seen, baked potato, coleslaw and donuts. 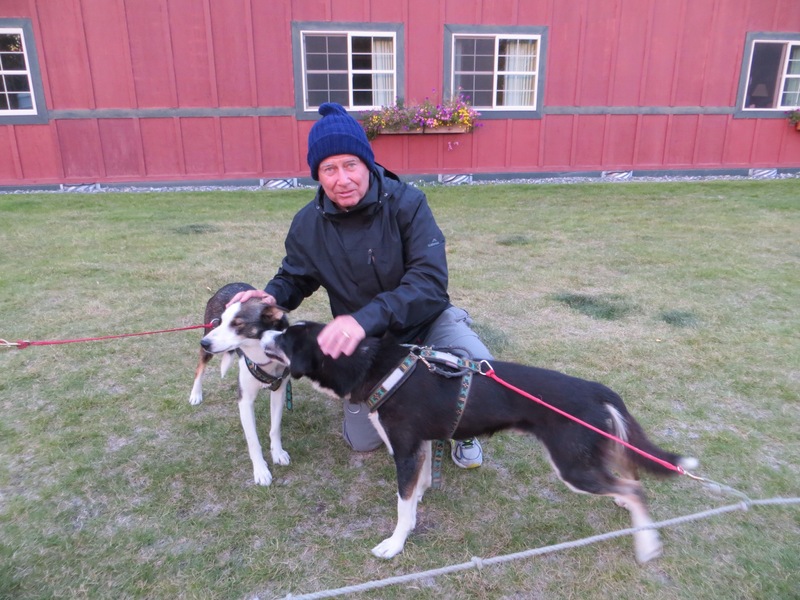 After we have digested the little snack we spend time with the Alaskan huskies, bred for dog mushing including Chinook and Kenai which gave us a thrill. It was interesting to see and read about how they are treated, trained, fed etc for this national sport. 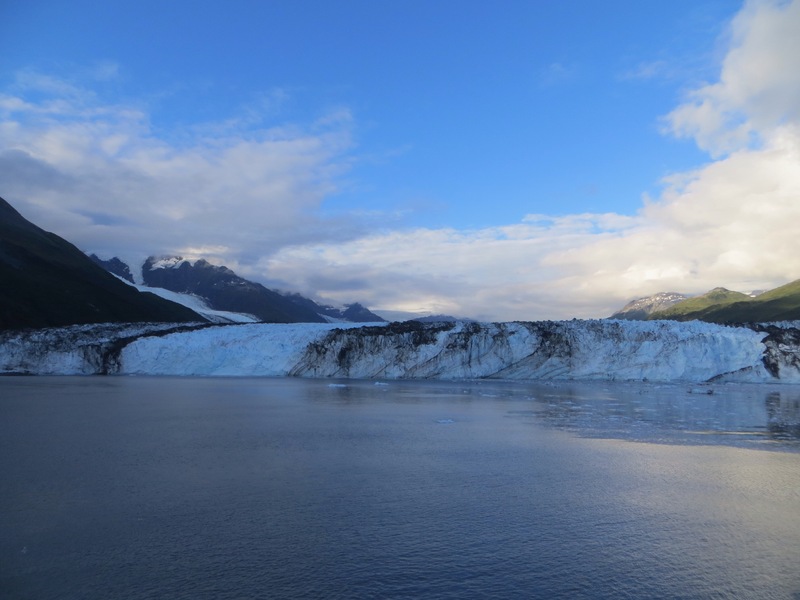 We now look forward to two days of cruising in Glacier Bay and College Fjord before we disembark in Whittier to begin eight days on land here in this fascinating place called Alaska. Today is Rocky Mountaineer day and we have an early start and breakfast before arriving at the station to board the train. The shiney train arrives and rolls out a short red carpet and a call to hop aboard – good start we are thinking! We board the upper level of the glass-topped carriage and get the drill – there are two breakfast sittings and we are in the second one. What? But we have had breakfast! Because we are in the second sitting we get served tea and scones to keep us from starvation. 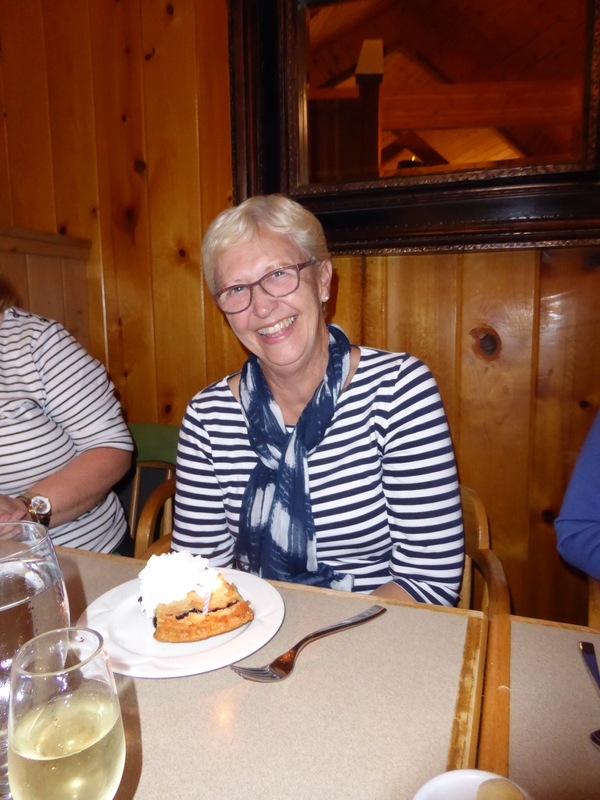 Oh my goodness – this is a two-day trip and now we get the feeling the clothes are going to shrink even further so, after a 5-second discussion, we decide we will flag a second breakfast because, strangely enough, we have only ever been used to having one breakfast each day! It just gets better (or worse actually depending on your habits) because at 10 am the blimmin bar opens up. Well, I guess it is 5 o’clock somewhere! 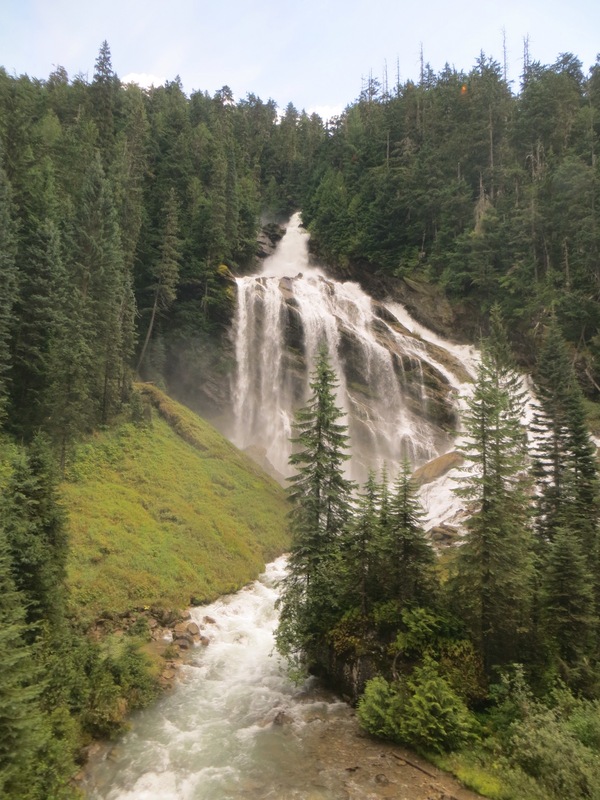 The Rocky Mountaineer rolls on quietly surrounded by beautiful scenery on both sides and the conversation in the cabin gets a little chirpier as the morning progresses and, here it is 10.30 am and I am sipping champagne. Heaven forbid! Can you belieeeeeve it? The boss is doing a sudoku puzzle – can you belieeeeeve it? By the way, we had to put the clocks back one hour so it is kind of 11.30 am! Of course, we are also in the second lunch sitting so to “get us through” we are served a little bowl of cheese, fruits and crackers and wine. Oh no!! 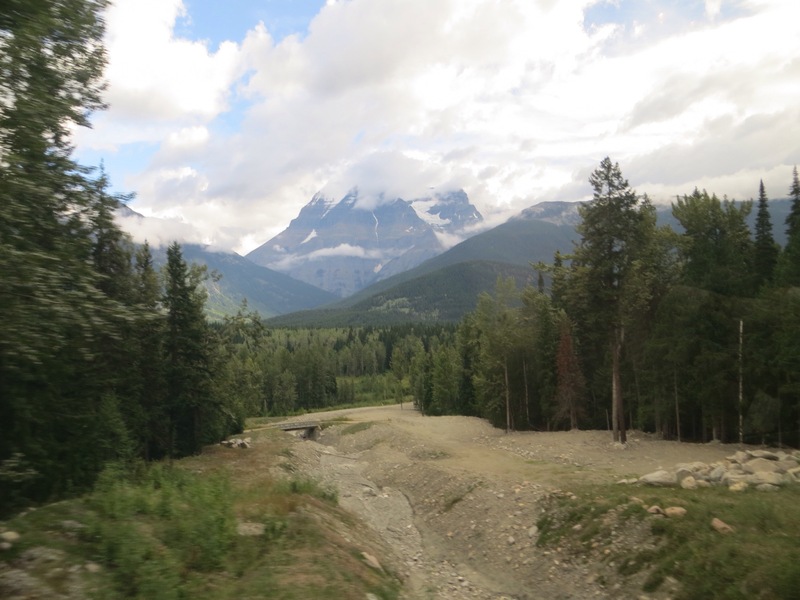 This amazing train slows right down for all the important scenic points like high Mt Robson (highest peak in the Canadian Rockies at 3954 m) and Triangle Falls. 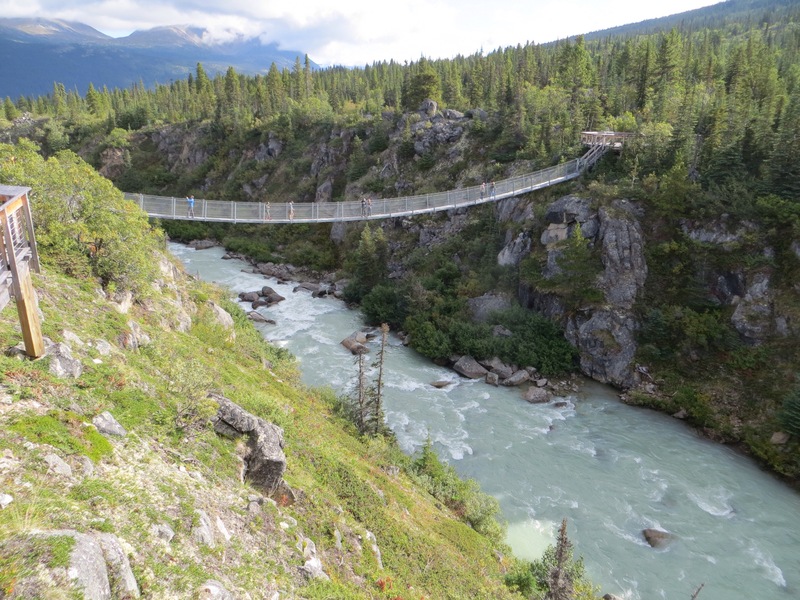 We pass Blue River which gets 10 m of snow in winter – this seems incredible but it is true. In fact they shoot cannons in some places to create avalanches. It is starting to look like this train is all about the food so we make our way to the second sitting of lunch which is three courses with more wine, tea, coffee etc. Then back upstairs to recommence the bear watch and blow me down it is happy hour. Now really, you must be kidding! Then someone yells out “Bear – left” and everyone dashes around like mad people trying to see this jolly elusive bear. Then it all gets ridiculous as people are yelling out “chooks left, horse right, pigs left, donkey right”. Well you know the hilarity just got worse and worse as they afternoon wore on – I wonder why? 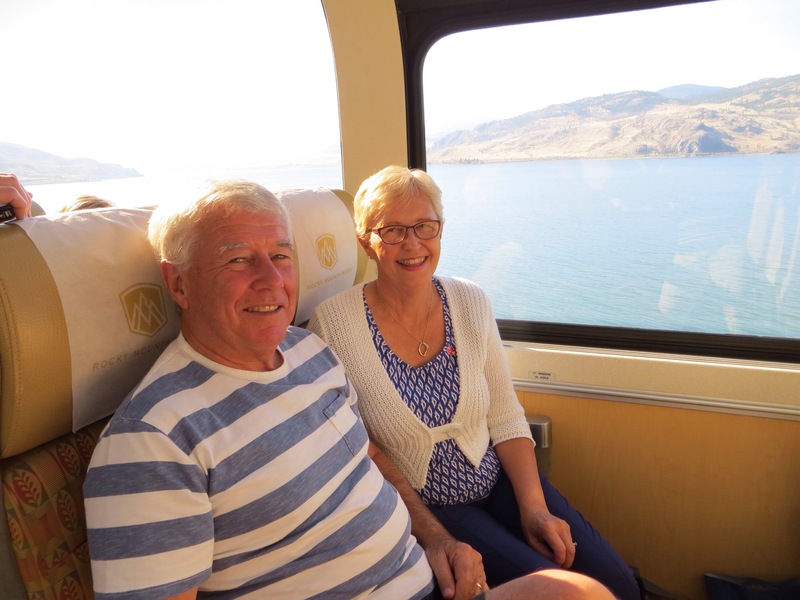 Tonight our stay is in Kamloops and magically our bags are there before us – and no – it wasn’t because they were in the front carriage of this long train but actually they went from Jasper by truck. The coaches are waiting at the station to transport us to our hotel in Kamloops for the night and the driver, like all the drivers here, is on form. He points out the sage plants because Kamloops is considered a desert area. He says he knows three types of sage – the spready outy kind, the sticky leafy kind and the roundy bushy kind!! I told you about the lady with the teddy bear. Well, today the teddy has got married. Yep – he with the glasses etc has married a good old-fashioned Canadian teddy who got dressed up in black satin and lace for the event! 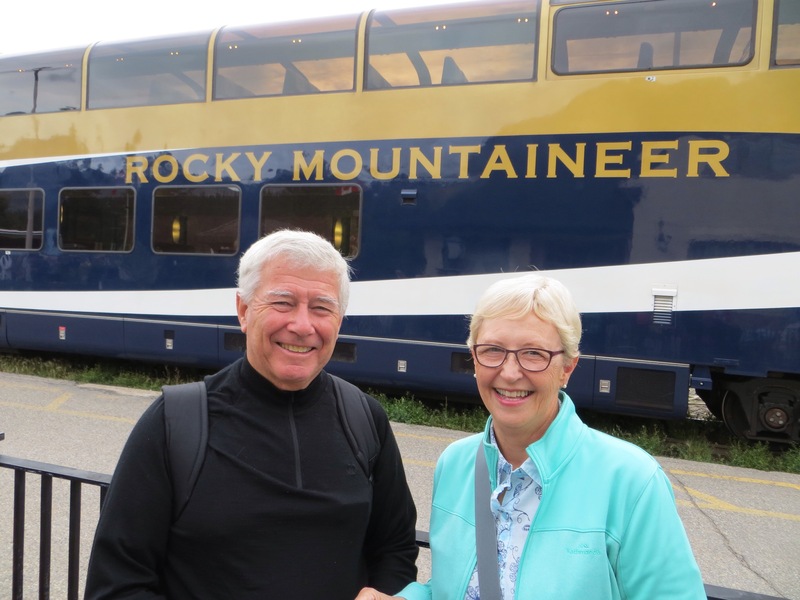 Here we are now on Day 2 of the Rocky Mountaineer on a warm Canadian day, the food is still being served, the blue rivers are still flowing and the Rocky Mountains are bathed in sunshine today. 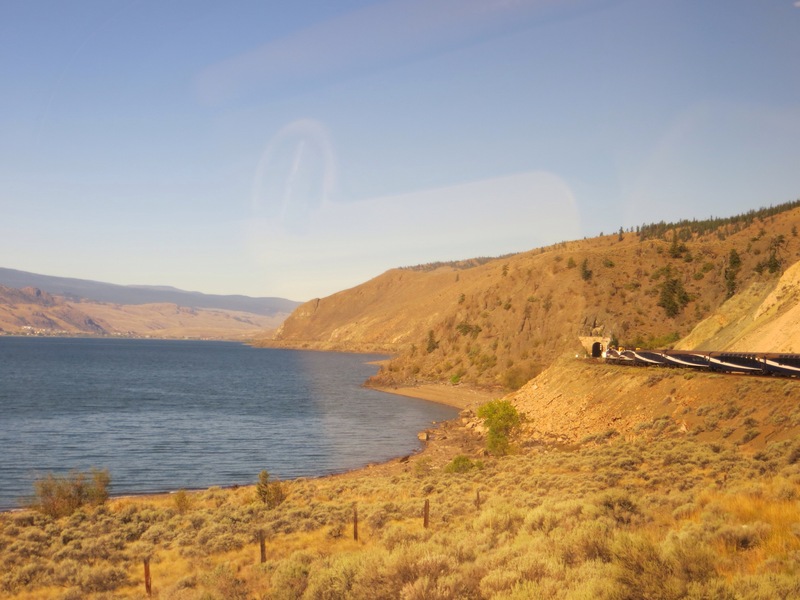 The landscape has changed now as we head out of Kamloops and towards Vancouver as this is considered desert country so we are back to the sage plants and a few pines scattered around. We have seen bald eagles and osprey this morning but we are out of bear country now (thank heavens our eyes don’t all need to be searching for these cuddly creatures) and we have apparently entered a rattlesnake breeding ground so we are thinking we are pleased we are not on a walking track today. The teddy bears who married yesterday have had a baby – can you belieeeeve it? There are now three bears looking at the scenery as we travel along and I am wondering how big this family will be by the time we finish in Alaska. I am so pleased I only have to look after the one teddy bear sitting next to me reading the news. We pass Frog Rock in the Jaws of Death Gorge, Black Canyon and the horseshoe turn. We go through Thompson Canyon and enter Fraser Canyon and at the confluence the river turns brown – we have not seen too many brown waters here. Well, wouldn’t you know it – we are called for the three-course lunch and, of course, we are starving because it is only 3 hours since breakfast! This beautiful Rocky Mounaineer train trip is like a fine restaurant travelling along the rails with some spectacular scenery thrown in for good measure! We prepare to farewell this beautiful country and head for Alaska tomorrow on the ship. 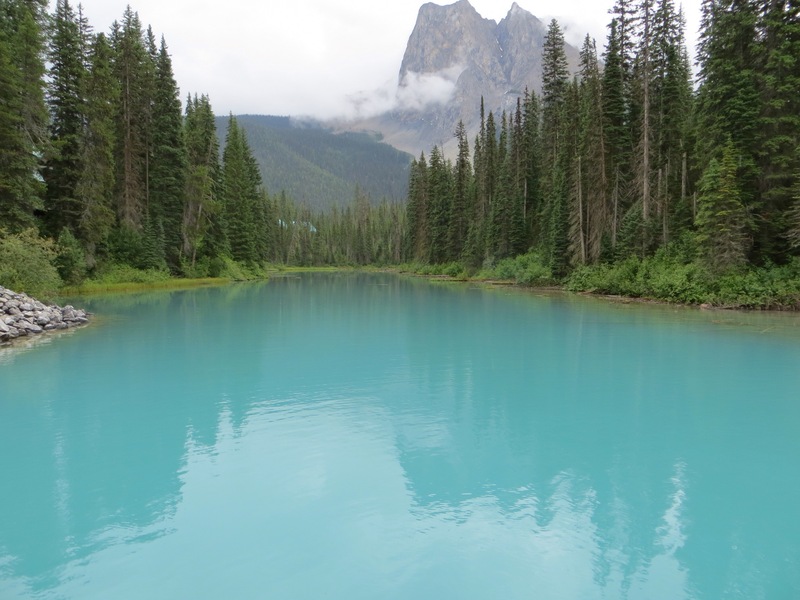 We think that Canada is New Zealand on steroids – beautiful clear blue rivers and lakes, pine forests (although many different types of pines here), huge granite mountains, a love of outdoor activities like rafting, mountain biking, skiing, cycling, fishing, lovely friendly people and nice clean cities. However, there are still plenty of homeless people in every city, beggars on the streets, house prices rocketing and low interest rates. 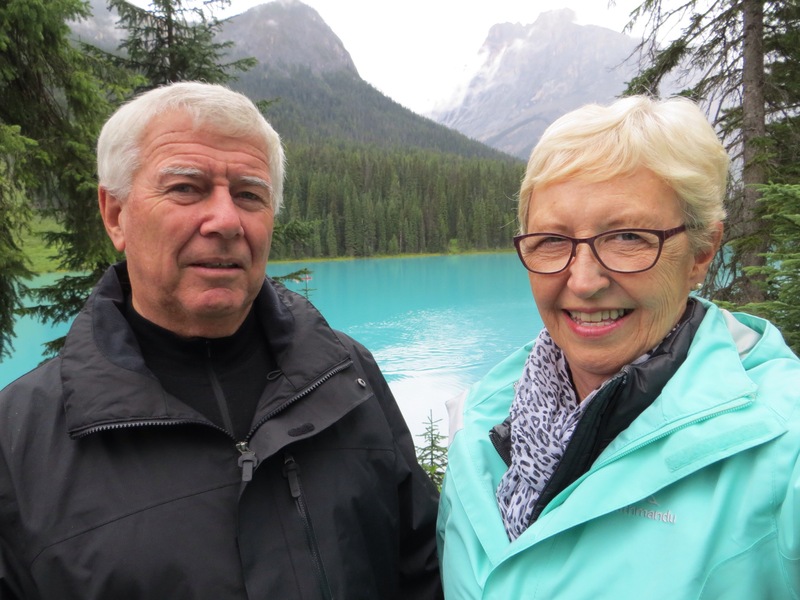 We certainly have loved our time in both the eastern and western side of Canada. We will remember the eastern side for the French influence and the western side for the amazing scenery. So we roll on quietly on this train towards Vancouver and prepare for icebergs and huskies. 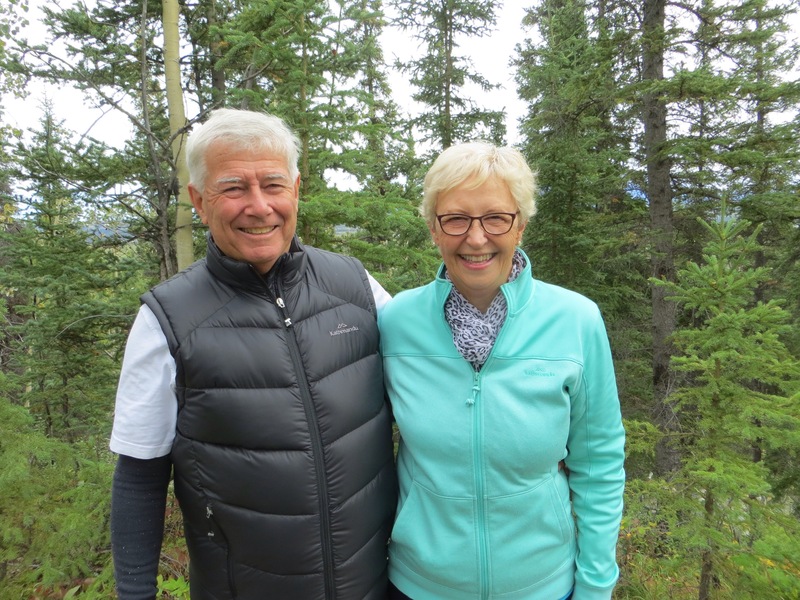 Well, here we are in beautiful Banff with its lovely memories of a family holiday here in January 1991 when the streets were covered in snow and the skiing had long long runs amongst the trees dripping with snow. It is summer here now so the landscape looks very different but still beautiful. The Main Street is a busy place and it has changed with new buildings and lots more accommodation. Just before dinner we are watching the Olympics on TV when suddenly the screen is filled with a warning and the voice is blaring to let everyone know of a tornado warning near Calgary and what to do if you are out walking, on the highway, on your bike, in your garden etc. After a lovely Japanese dinner we make our way back to our room BUT we get to the room we think is ours and it has a “Do not disturb” sign on the door which is puzzling. So we have a debate in the hallway – is it 238 or 239, or is it 228 or 229? We walk up and down the corridor and off to the sides in this rabbit warren and still can’t decide which is our room. There is only one thing to do and that is go down to Reception and get them to sort this out for us! Oh deary me – we are losing our marbles!! 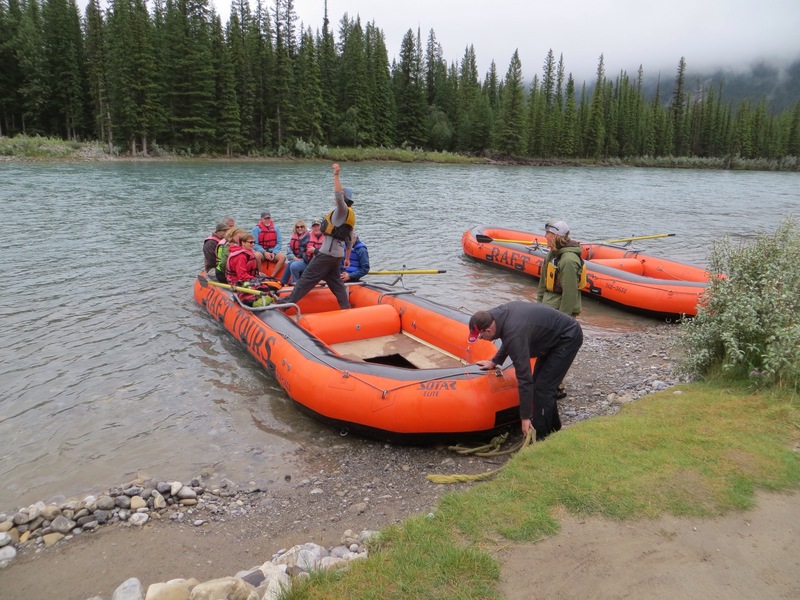 Our choice of excursion this morning was rafting on the Bow River so off we set dressed up for all weathers. We get aboard the raft and off we go about 8 km down the river seeing elk and osprey and lovely scenery on the way with a Canadian guy rowing and entertaining us for the duration. After that a walk downtown to try and find the place we stayed in years ago – found it we are pretty sure so take the required photos and then lunch and a walk back to the beautiful Banff Springs Hotel (which is an iconic symbol of Banff) to rest up before our Hoe Down dinner with the group tonight. 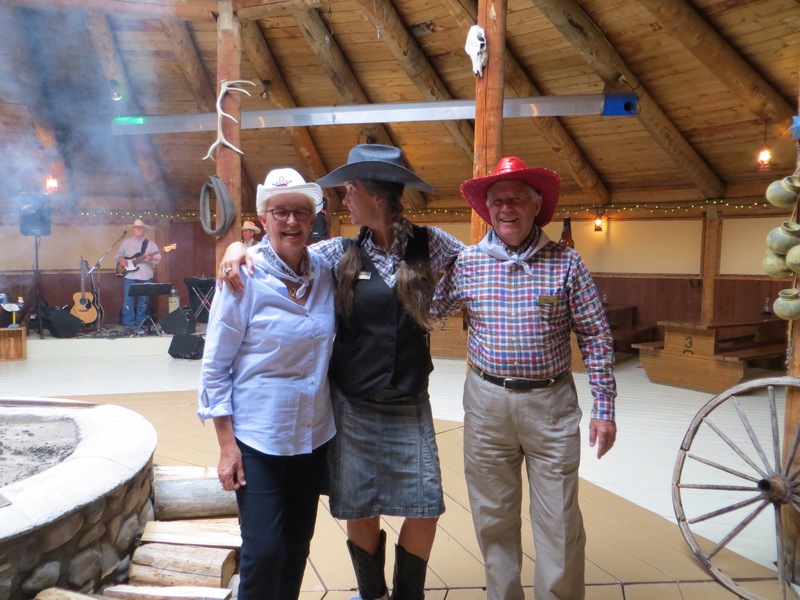 Well, we did the Hoe Down dressed up with cowboy hats and entertained with great music, good food, lots of dancing and, who would have thought it, lessons in Line Dancing! Can you belieeeeeve it? Probably not. This morning we departed lovely Banff after an 11 minute gondola ride to the top of the 7500 ft Sulphur Mountain. 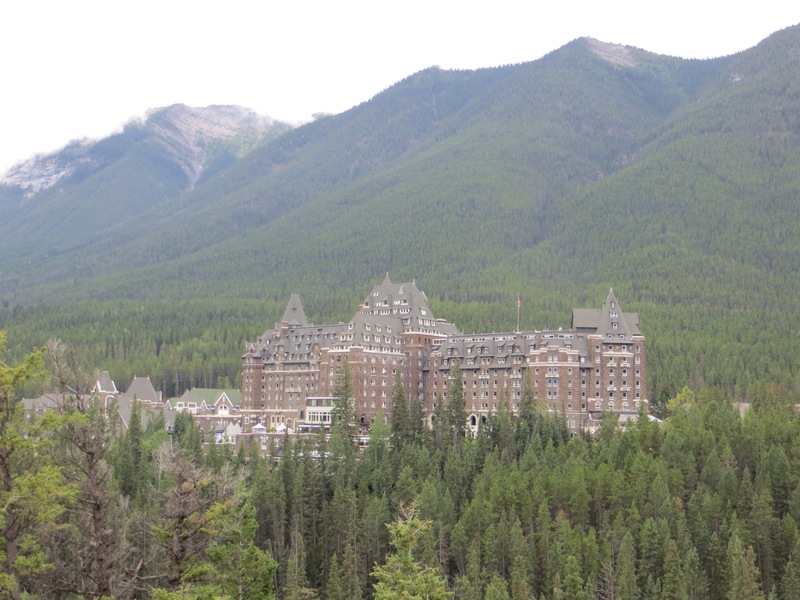 This mountain has lovely boardwalks and stairways at the top so you can walk around and up to look down on Banff and into the distance. 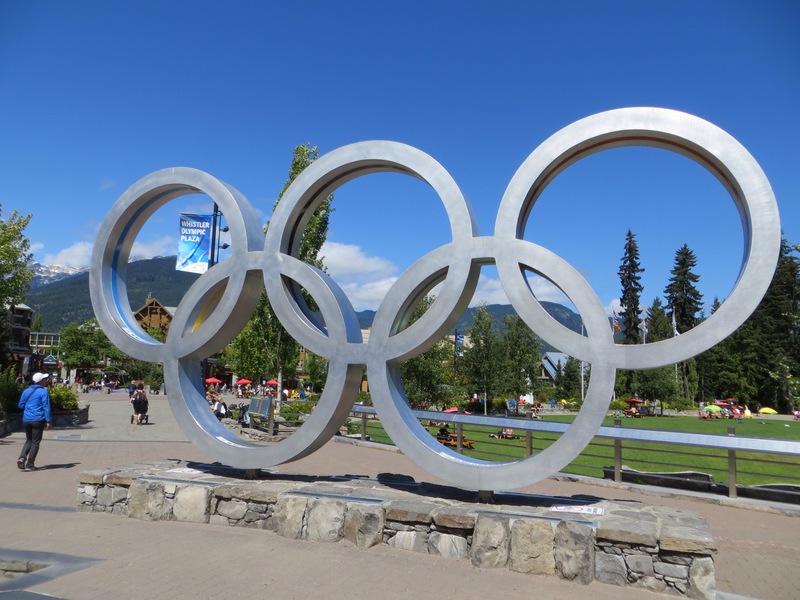 Banff has a resident population of 10,000 but you can only purchase a house or condo there if you have a job in Banff. Otherwise – no! Four million visitors a year descend on this beautiful World Heritage town and most of them decided to come yesterday! 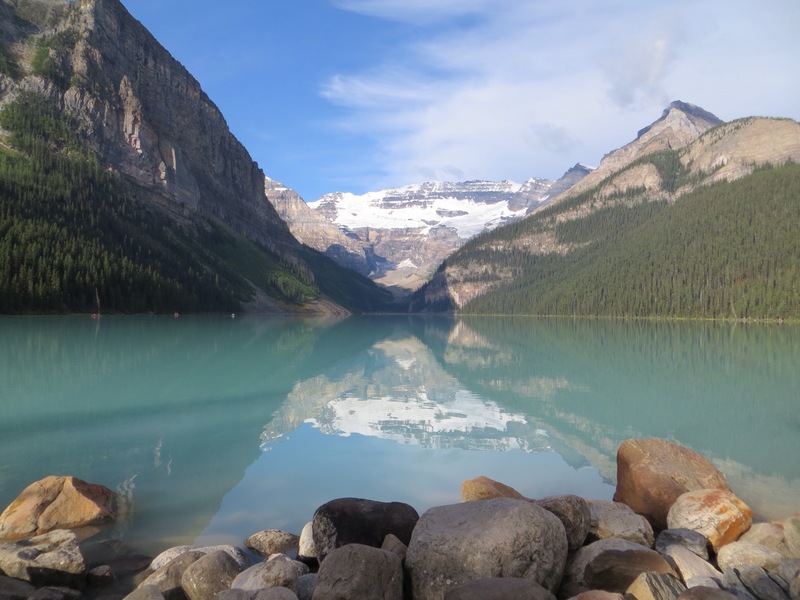 On to the picturesque Lake Louise with its Chateau Lake Louise looking directly out to the lake surrounded by mountains. A bit misty today and a few droplets of rain, little cooler but we don’t mind one bit. After the heat of the desert I can tell y’all that cooler temperatures are no problem at all. 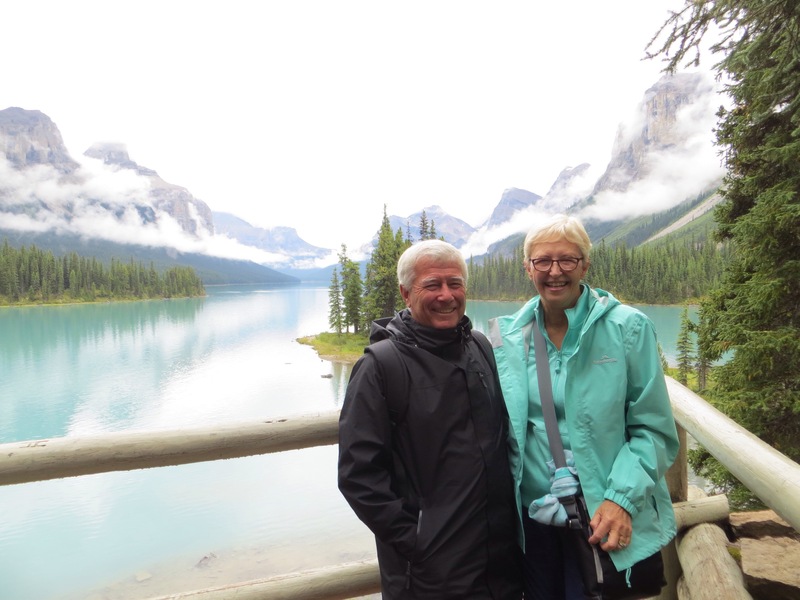 A visit to the gorgeous Emerald Lake (Lake Louise was once called Emerald Lake but was then renamed after one of Queen Victoria’s daughters) completed the day which was one of picture-postcard photos. 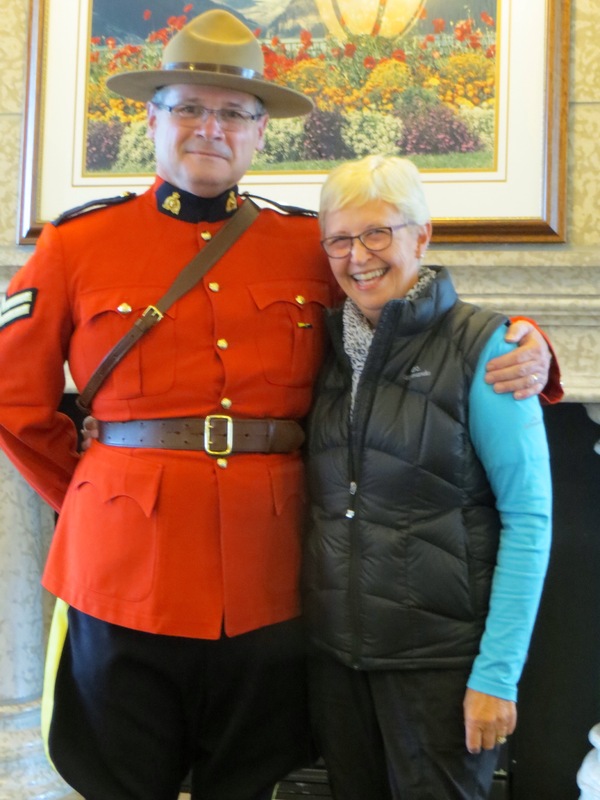 By the way – I got a hug from a Royal Canadian Mounted Policeman. Well, actually, that is a myth now because the RCMP’s stopped wearing their red coats, big hats, boots and jodhpurs some years ago and they only come out for ceremonial occasions now. The only time you will see the uniforms and horses now is when you see the Musical Ride Tour – a group of horses and RCMP’s performing beautifully to music and touring the world every three years. Well, a little surprise was in store in the bathroom today – a heated toilet seat. Yep – really tickled my fancy! 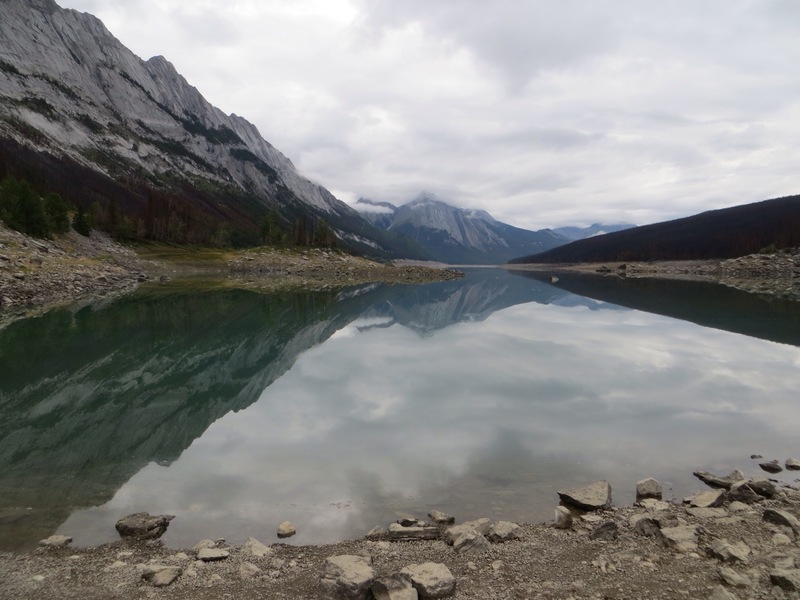 We leave for Icefields Parkway in the Columbia Icefields today to visit the Athabasca Glacier. The highway is 250 km long and is considered the most scenic highway in the world. 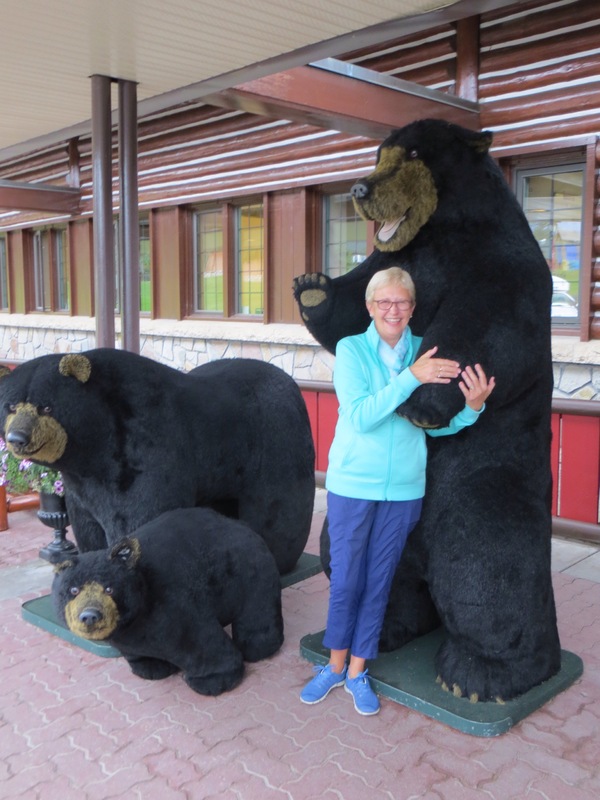 We pass almost 100 ice glaciers, glacial rivers, streams, lakes and more tall straight Christmas-tree forests on the journey all the while looking for these elusive black bears and hoping they are about to spring out from between the trees to nibble on berries. We are not actually sure why the bears would walk out of the forest at the side of the road to wave to us when they have a whole forest to hide in but we live in hope. We haven’t sighted any yet and we haven’t sighted Goldilocks either. 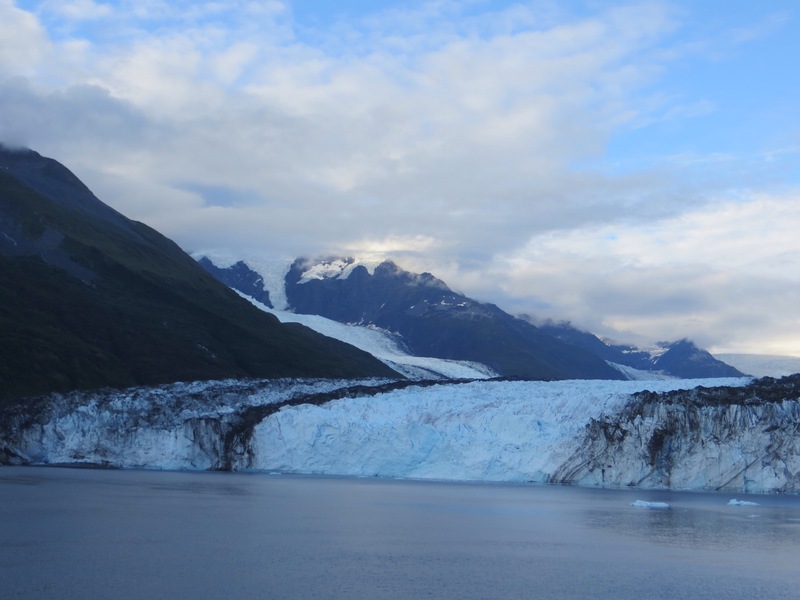 The first glacier comes into view and it is a “wow” moment. 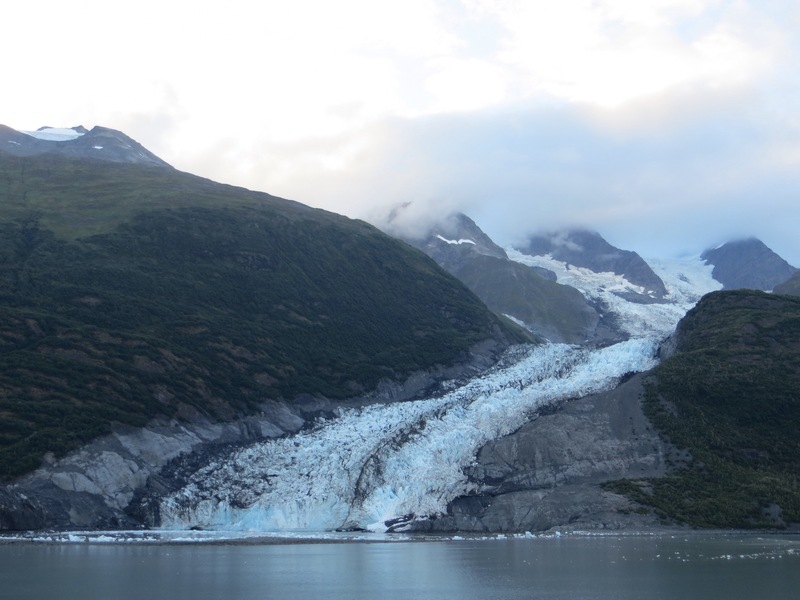 The grey and white ice looks like it is tumbling down the enormous rocky slope. Nature has provided the most stunning landscapes for us to admire as we drive along this highway. Avalanches have wiped out long wide lines of trees. 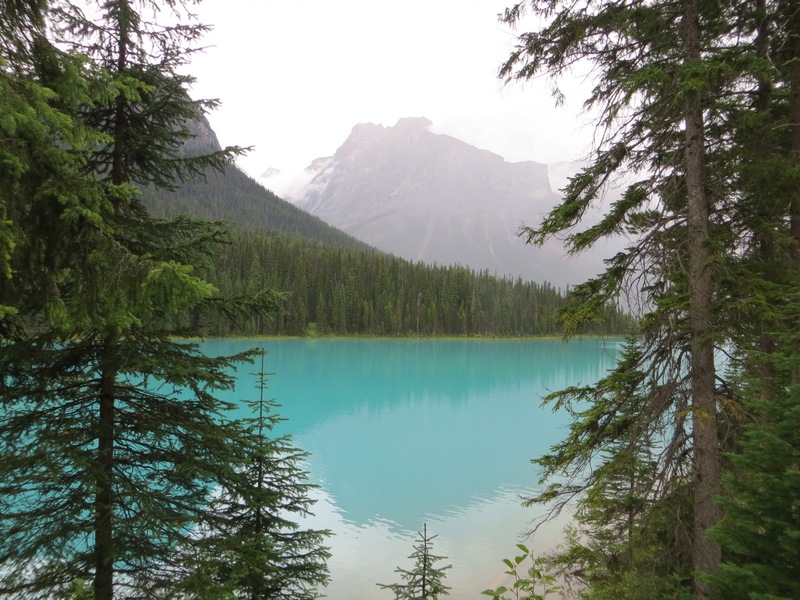 We stop at Bow Summit at 7000 feet to see Peyto Lake, the bluest lake in the Rockies, and walk to the lookout. 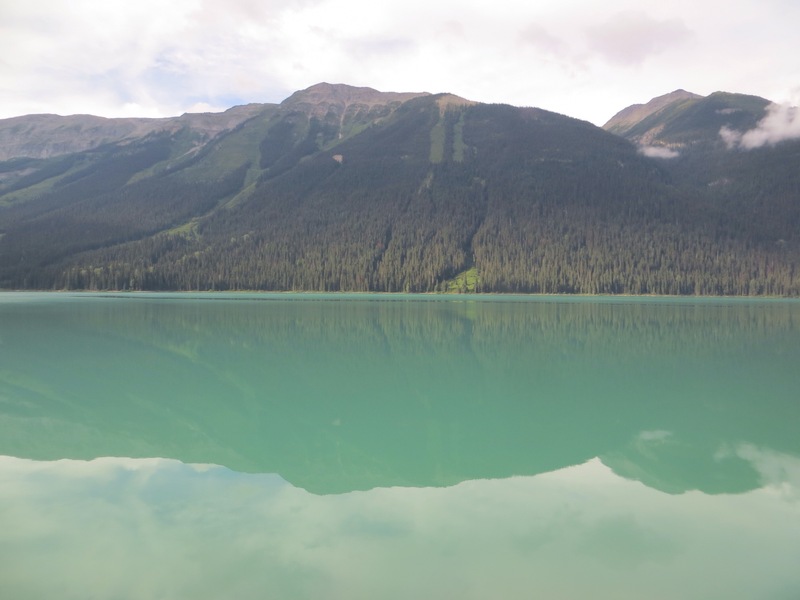 Stretched out in front of us is a vivid turquoise lake reflecting the mountain and the glacier off to the left. Wow! On arrival at the Visitors’ Centre at the Athabasca Glacier we are ushered into one bus to take us onto a 4-minute journey to get onto another big snow coach to take us to the glacier. The young drivers are very entertaining – the first one reminds us to take everything off the bus and “if you by chance leave it behind you can log onto e-bay and see if you can find it” he announces. 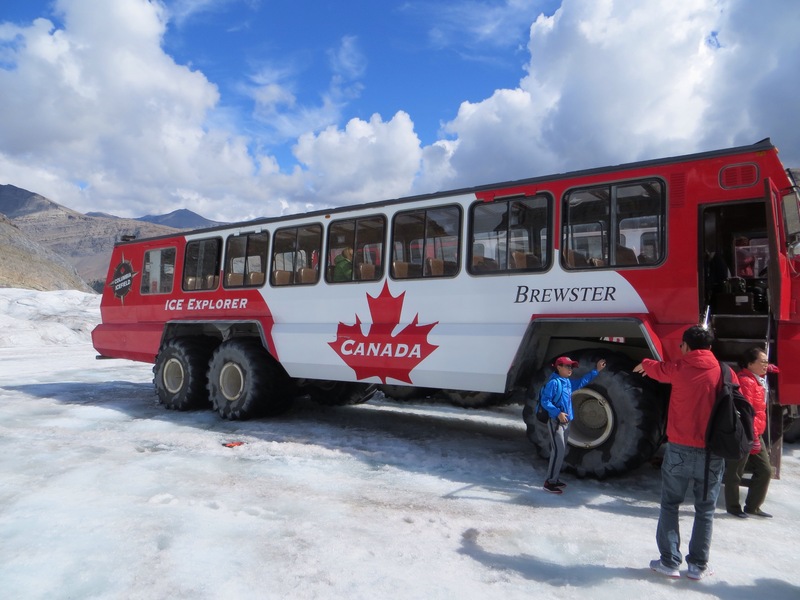 We climb onto the snow coach and off we go towards the glacier descending a 32% grade rocky incline on the way to get there. Thank goodness for the huge rubber tyres on this thing! 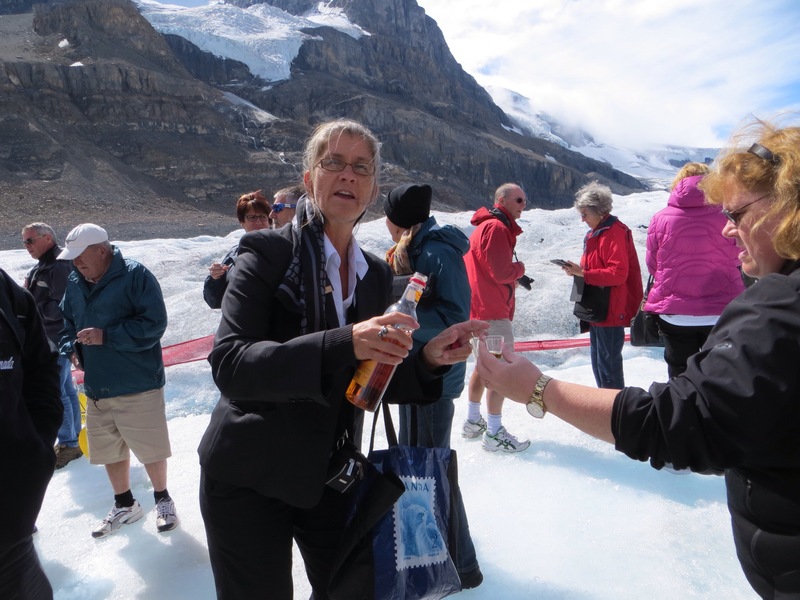 We arrive to do our walk on the glacier and our Tour Director, Tara, is handing out little plastic shot glasses to us all and she produces a bottle of whisky and we all down a toast! Heaven forbid – here we are dressed up warm, standing on slushy ice and drinking whiskey before noon! Well, you have to partake don’t you! This glacier moves 1 cm every 90 minutes so we are back on that snow coach rather quickly so we don’t move with it. 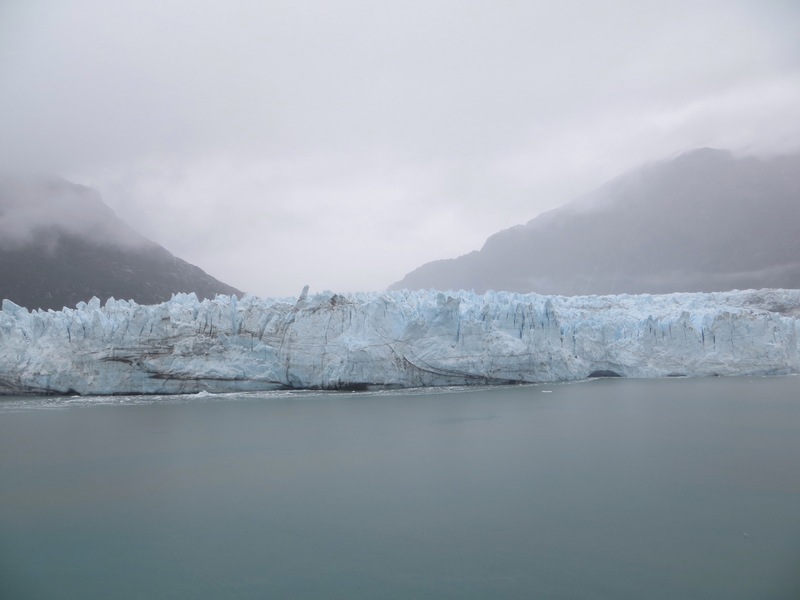 Now talking of being dressed up warmly, our Tour Director told us about six times to dress warmly for the glacier. This was also written on our daily sheet. We are travelling with 36 other people so you get a mixture, of course, but one lady got on the coach this morning (remember it is “visit the glacier day’) and she has a t-shirt and jandals on. Can you belieeeeeve it? 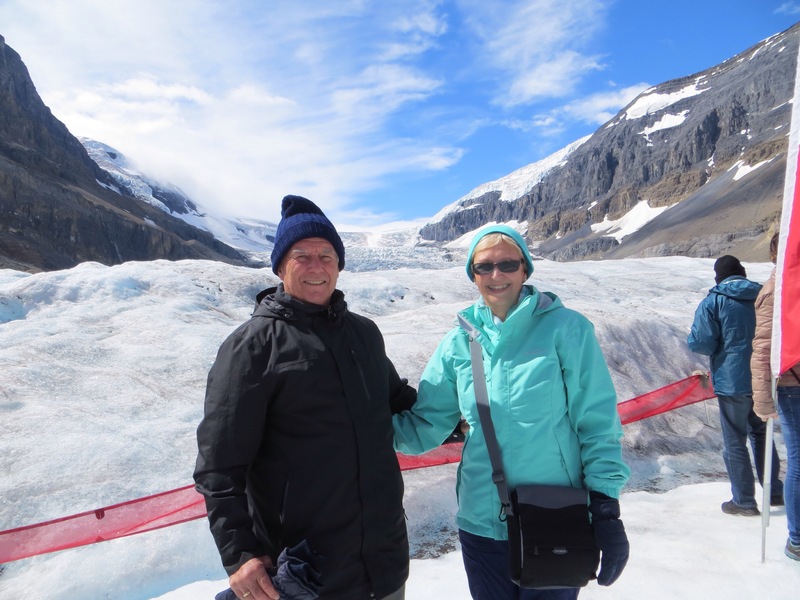 Yes – she did visit the glacier in the t-shirt and jandals! Another lady carries around a huge bag over her shoulder every day like a shopping bag and she struggles with this thing so much that her husband has taken to sitting in a separate seat. Well, the other day she produced a box of washing powder out of that bag! Heaven knows what else is in it. Another lady travels with a teddy bear sticking out the top of her backpack. The teddy is sometimes dressed in different clothes each day and the teddy is propped up on fences, rocks, tables etc to have his photo taken in all the scenic spots. It is all interesting to observe. They all probably think we are odd too! 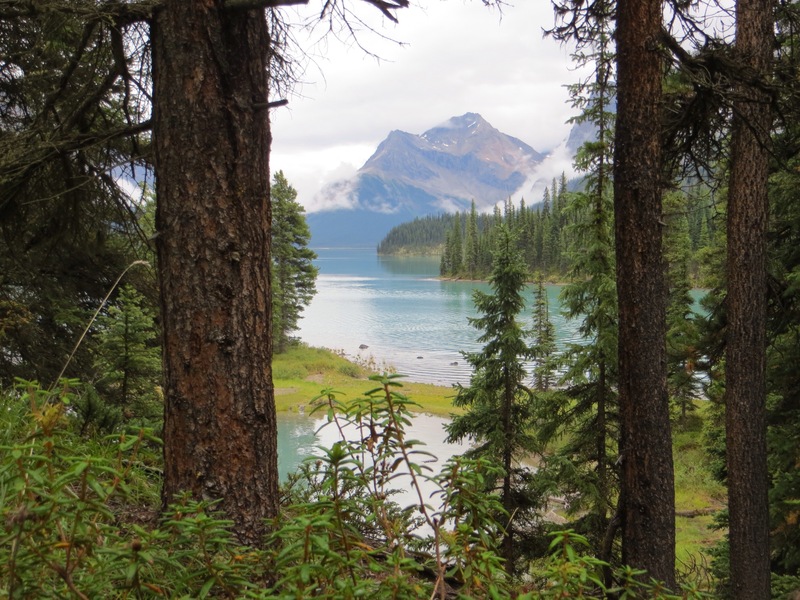 This morning we set out for Maligne Lake to do a boat trip down to Spirit Island and we are still craning our necks to look for bears but it seems they are all having a sleepin. Darn it! We pass a long mountain range with sawtooth ridges and more Christmas-tree forests – I think they must cover all of western Canada. The scenery is still absolutely stunning everywhere you look. 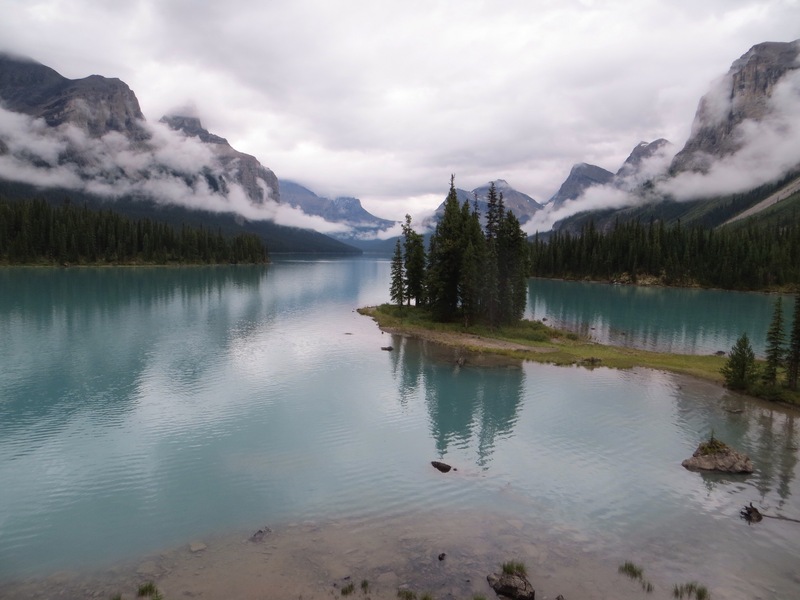 Maligne Lake is 22 km long and freezes over to a depth of 1 m in winter. The summer season is from around May/June until end of September. Average temperature of the lake is 4 degrees so no swimming done here during the summer. On our return we decide to go for a walk around the lake here at the beautiful Fairmont Jasper Lodge (which is a whole lot of log cabins set around the main building and beside the lake – beautiful). We are going on a bear hunt and those critters had better be out there because we are getting sore necks trying to look for them. Off we go – camera at the ready – along the track and off onto a side track and guess what we saw…………. 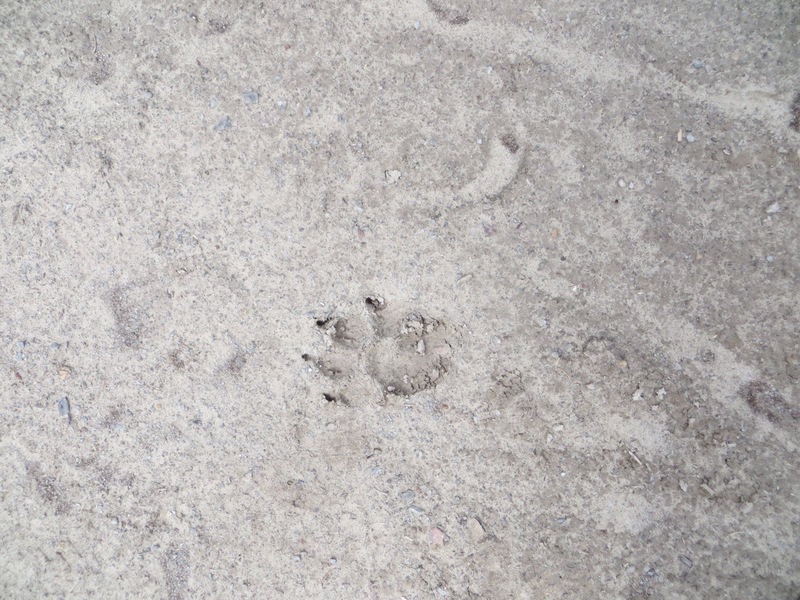 bear footprints. Yep – that’s as close as we got so I took a photo! After walking approximately 10 km, according to the boss, we rest up to watch the Olympics and Yay – the Sevens are playing Fiji. But that was short-lived! Boo hoo – they are out of the Games. 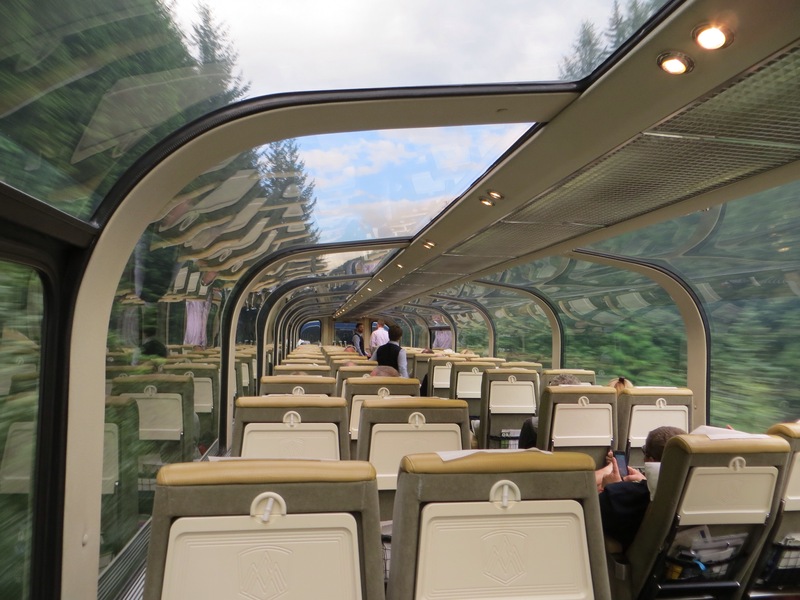 Tomorrow we board the Rocky Mountaineer to travel to Kamloops and then on to Vancouver on Friday. 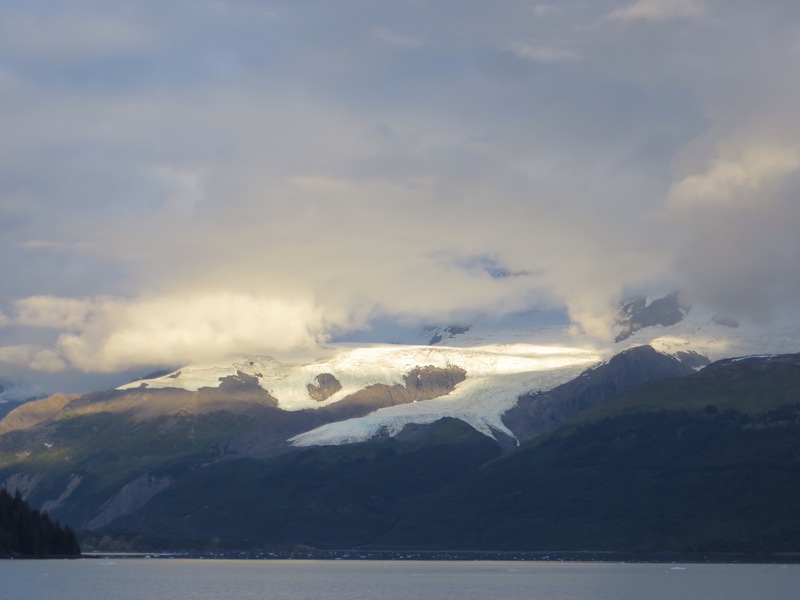 Then we farewell this beautiful Canada and enter Alaskan waters on the cruise ship. We arrive in Victoria a little weary but are soon perked up as we check in to the beautiful Fairmont Empress right on the waterfront. This magnificent hotel dates back to 1908 and, like many of these hotels, resembles an old chateau. The place is buzzing because the Victoria Symphony Orchestra is performing tonight on a large stage on a pontoon right out in front and thousands of people are picnicking on the lawn here and are gathered right around the area. We walk along the front to find a place to sit for a while and listen to the music and to have dinner. On the way back to the hotel the bagpipes are playing and somehow we managed to get ourselves into the throng following them so we march back to the hotel to the tune of “Scotland the Brave”. We have a couple of rest days now to recover and do the housekeeping before movin on. 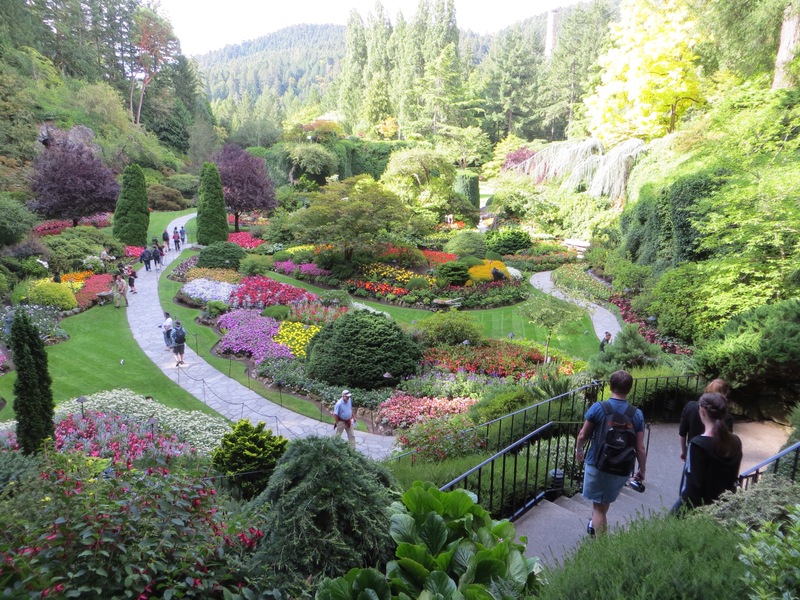 This morning’s visit is to the beautiful Butchart Gardens here in Victoria covering 53 hectares and dating back 100 years. 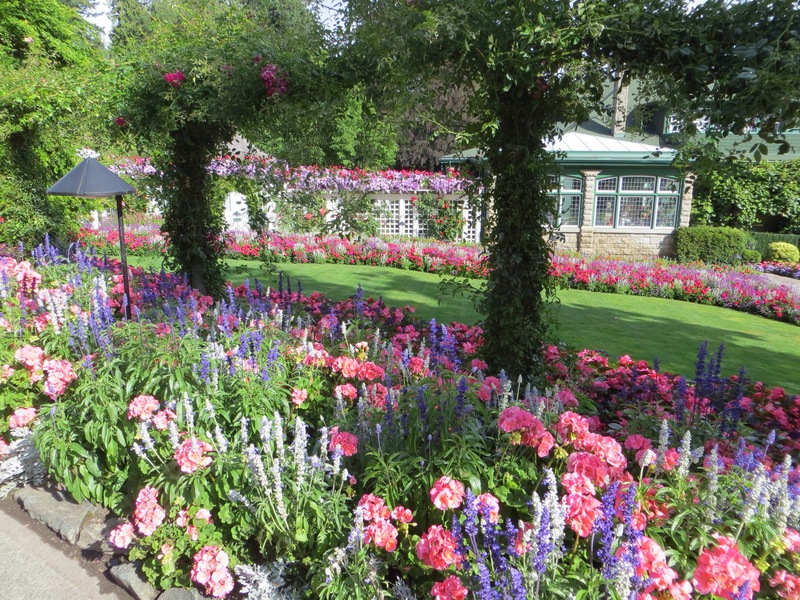 There is a sunken garden, a rose garden, Japanese garden, Star Pond, Italian garden, Piazza and Mediterranean garden and every single one of these is truly a place of great beauty, colour and tranquility. Seventy Gardeners tend the gardens and many of them are out today dead heading, weeding, lawn mowing, trimming etc. One of them told us that there are 26 greenhouses with plants which will go into the gardens at some stage and that in November they will be planting 300,000 bulbs. 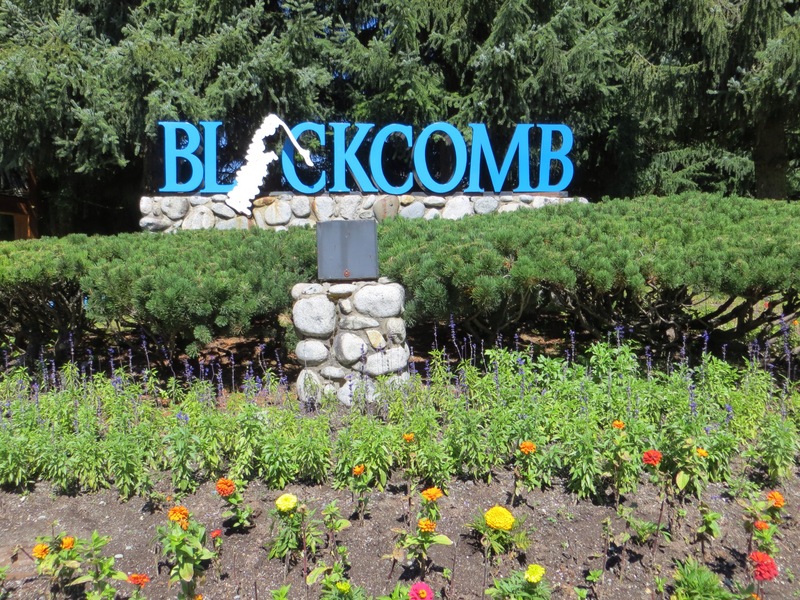 When annuals are removed they are composted to go back into the gardens. There are stunning fountains, sculptures and ponds and we loved it all. Tonight’s included excursion is Chinatown Lantern walk and dinner so off we set all wrapped up warm because the wind is chilly. 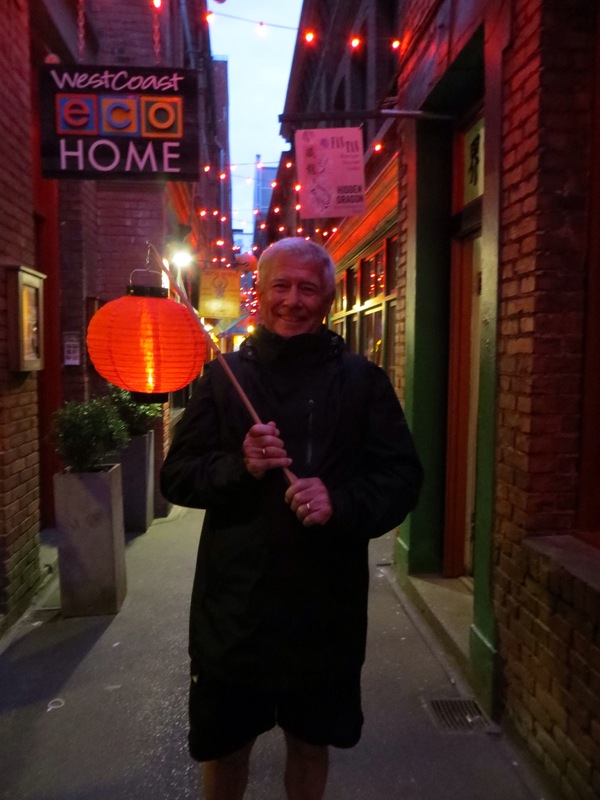 After a rather large and tasty dinner at a small Chinese restaurant, our guide presents us with a bamboo pole with a lantern and off we set to wander down the street and into Fan Tan alley and another narrow alleyway dating back to the early 1900’s. Well – didn’t realise we would be walking around with a lantern at the end of a pole!! 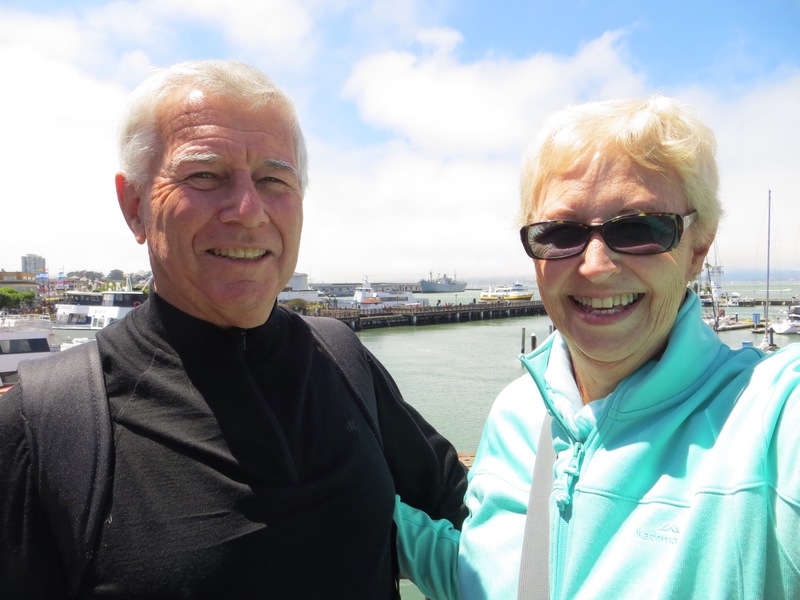 We departed Victoria on the ferry passing many small islands and arriving at the terminal in Twassassen and then driving towards the centre of Vancouver seeing bald eagles, blue herons and very large seagulls on the way. We also passed crops of blueberries and cranberries. The visit to Granville Island, which is a heritage site, was pleasant with its large Marina and markets and was a hive of activity with the street entertainers playing away. 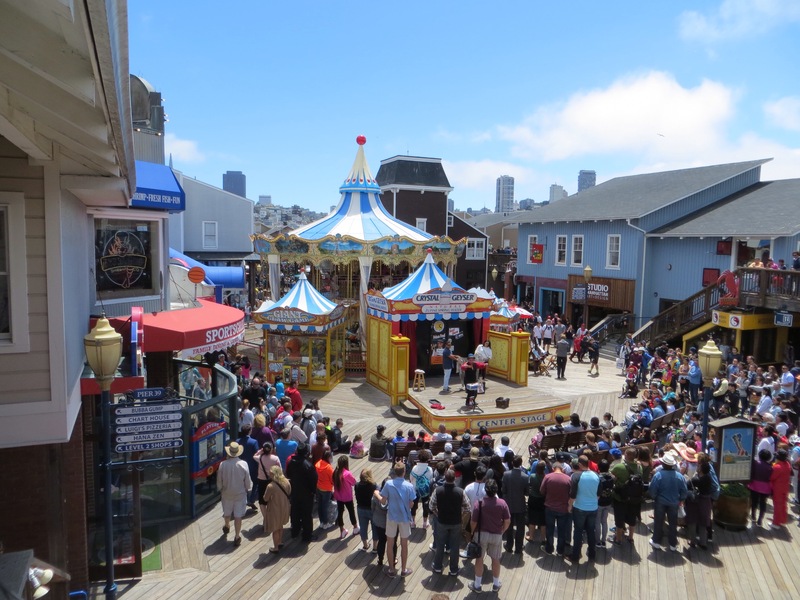 Here the buskers have to audition to get a permit in order to entertain on the streets. This was followed by a visit to Stanley Park to look back at the nice landscape of downtown Vancouver. Now the bathrooms – well actually, as you will have noticed, there haven’t been any major problems of late. Yay! However, today on the ferry I did have a tiny wee problem. I walked into the Men’s by mistake and banged into an Indian man who, with a look of surprise, said “Maaaam – wrong side, wrong side Maaaam – go to other end”. Well, for heavens sakes – why can’t the Canadians make those Male/Female graphic images clearer!!! Now there is a little blurring of the lines of responsibility here on tour. I am in charge of the P’s, the boss is in charge of the B’s. We have that sorted. However, I had a prior arrangement, which was agreed upon, and that was that if I had the responsibility of navigating us through new towns I would need to bring the Tom Tom – I didn’t. That means the apprentice is in charge of navigating but over the past two days he has tried to hand the maps over to me. “Fine – OK – won’t argue” I said but after he thought about it for 5 seconds he decided he would need danger money if I was navigating so he has agreed to take full responsibility for map reading. Whew! I can put the Stress Remedy back into my bag! 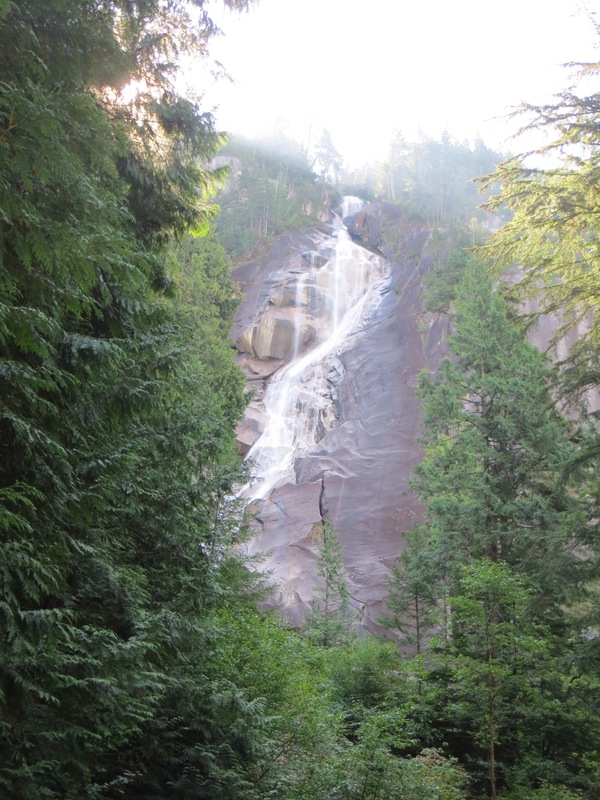 We departed Vancouver this morning and drove the picturesque Sea to Sky highway to get to Whistler visiting Shannon Falls (no kidding) and passing the tall rainforest here of varying types of pines, cedar, red alders and broadleaf oak trees on the way. We passed Stawamus Chief – a huge granite mountain with forest and trees with its gondola rising up to the top of the valley. This is the second highest granite rock in the world after the Rock of Gibraltar. By the way – petrol here in Canada is around 112c which is about $NZ1.30 per litre – why do we pay so much in NZ? 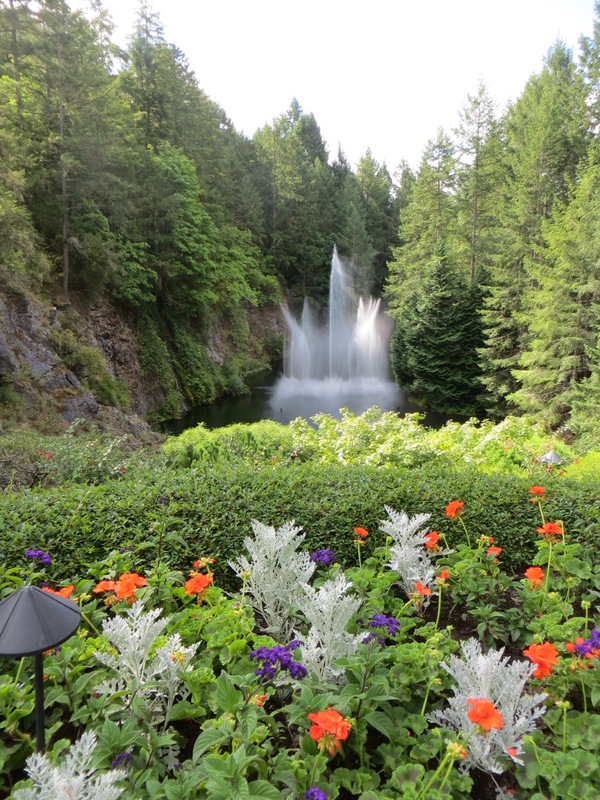 An inclusion in our tour was a Freechoice dinner and we chose the Fairmont Whistler Golf Club. 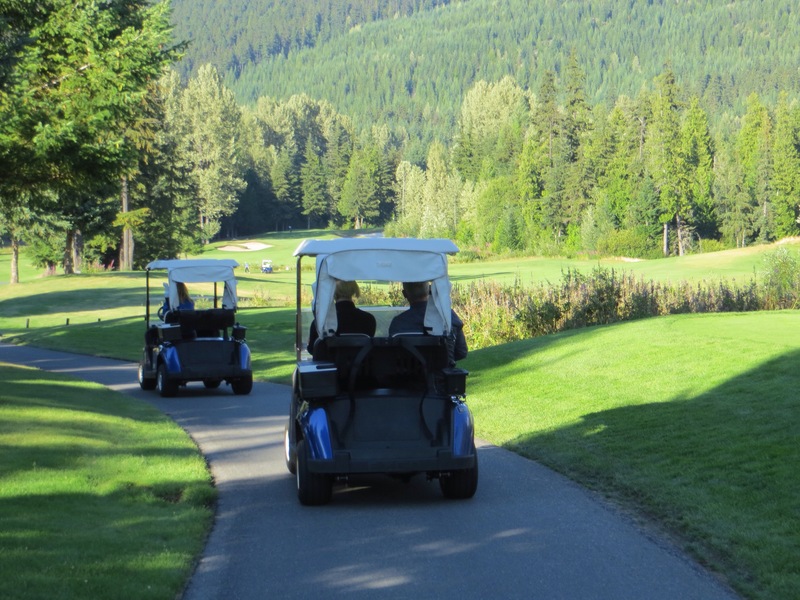 We went with one other couple and on arrival we were each given a golf cart for a “wildlife” drive so our golf cart set off with a lady from the Club driving out in front to guide us through part of the course to look for black bears or elk. Well, we saw none but we did see absolutely magnificent scenery around the 8 holes of the course we drove around with Vern at the wheel – have to admit that at times it felt like we were in the dodgem cars at the fairground!! Honestly, he hasn’t driven for 7 weeks and as soon as he gets his hands on the wheel the power goes to his head!! This is a 6630 metre par 72 course with 400 feet of elevation and magnificent valley and mountain views. 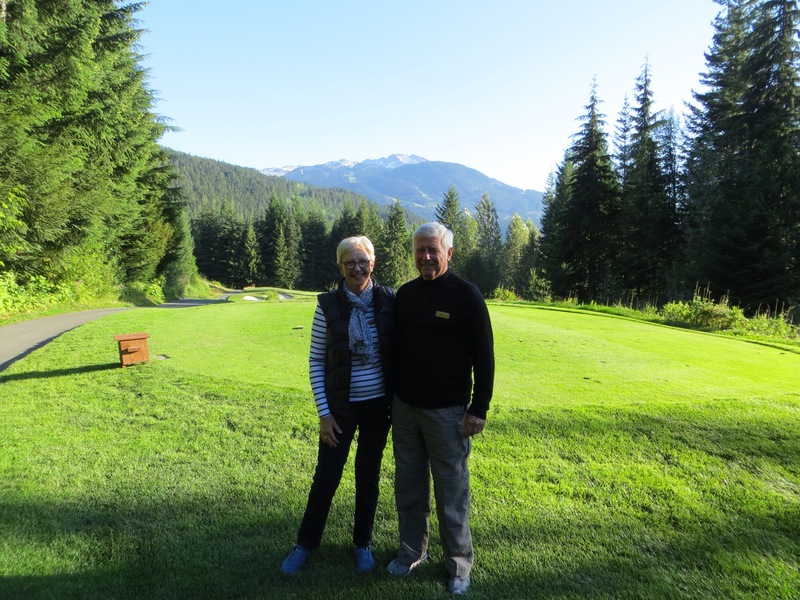 It has a signature 212 yard par 3 8th hole and the 18th finishes in front of the lovely casual clubhouse where we had a very enjoyable dinner and then a walk back to the hotel on a mild night here in Whistler. We depart Whistler for Sun Peaks passing crops of potatoes and large areas of pumice in this farm bowl surrounded by mountains. 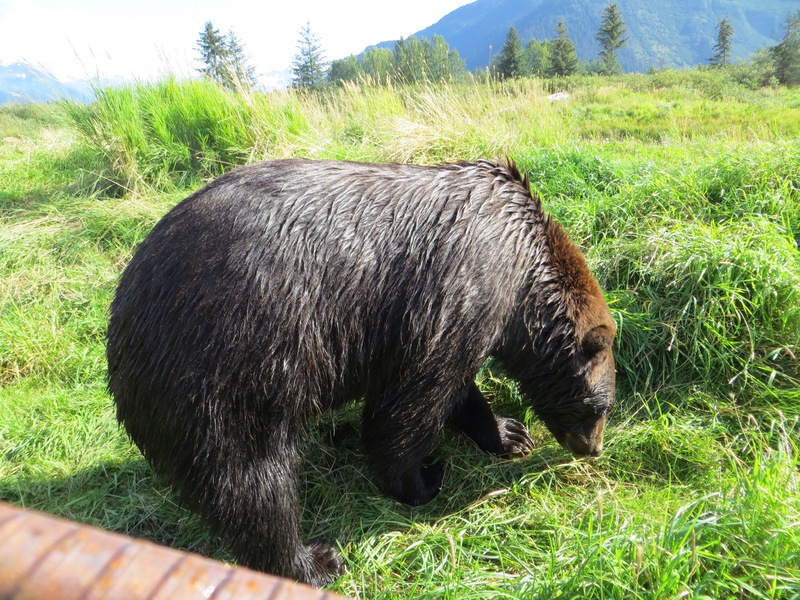 Suddenly there is a black bear on a side road – possibly eating the plentiful berries in the early morning sunshine. We fleetingly see another brown bear through the trees and are pretty glad we flagged the early-morning walk!! We pass First Nations reserves which are easily identifiable because of the many car wrecks on all the properties. Up we climb on this windy road with lovely views of glacial rivers and lakes, mountain glaciers and Christmas-tree forests. We see salmon-spawning channels and green pastures as we climb and descend all day through these enormous mountains. Suddenly in this mountainous wilderness we come upon a lake with a large camping ground and off to the left cliffs of white rock with fir trees clinging by their toes to the sheer surface. 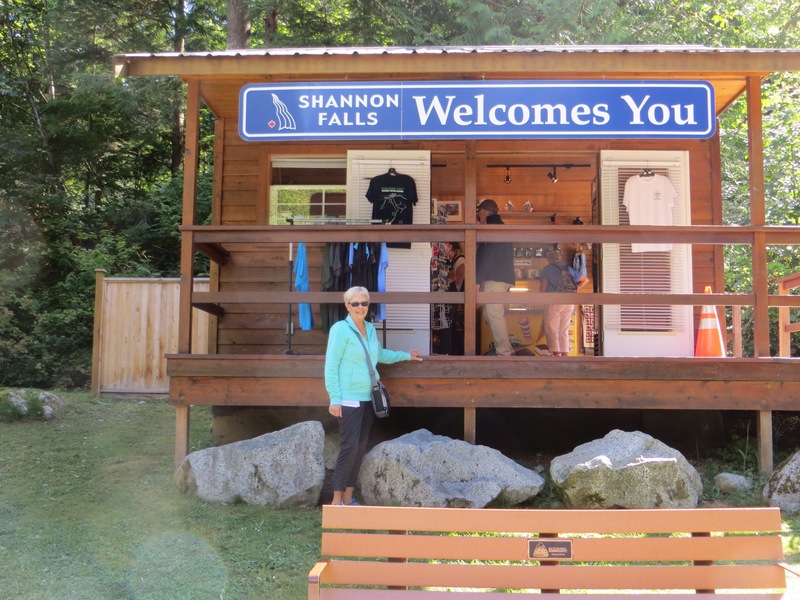 We join the Trans Canada Highway and see crops of Ginseng (for alternative medicine) while listening to the music of Joanne Shannondoah – can you belieeeeeve it? Wasn’t me! Incidentally, the Trans Canada Highway is 8000 km long and runs from Newfoundland to Victoria. We arrive at the small intimate ski village of Sun Peaks for the night and the first thing we do here is take the long gondola ride to the top of the mountain saying “hello” to a little deer sitting quietly right under the chairlift. 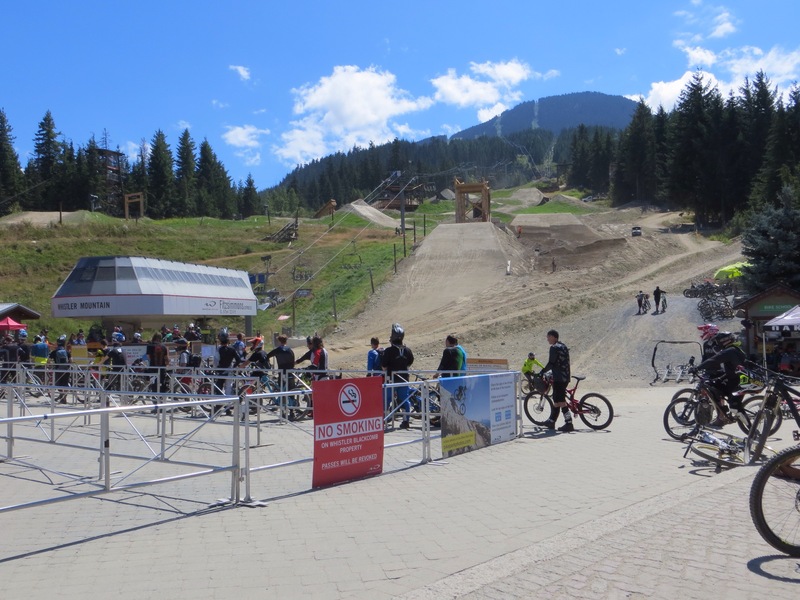 The mountain is a hive of activity with all the mountain bikers enjoying some fast rides down the mountain. 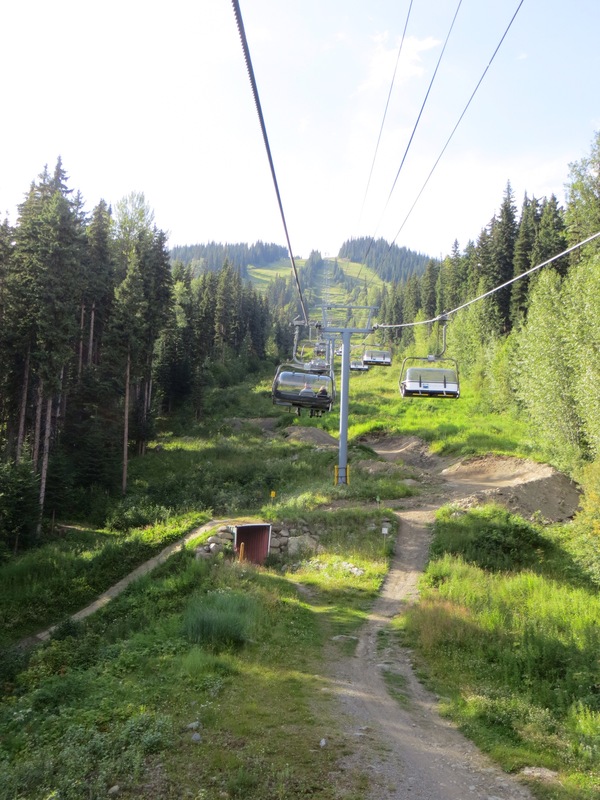 It seems a lot of the ski fields here have developed these mountain bike trails with various grades, just as they grade the ski runs, and this means that the mountain is being enjoyed both summer and winter. Today we have seen extremely long goods trains – trains that stretch out approximately 1.5 km in length and are pulled sometimes by two engines, sometimes with another engine in the middle of the long load and another at the end. The shipping containers are stacked 2-high and the train seems to go on forever. We pass more glaciers on the mountains, lots of snowy peaks and we drive through several avalanche snow sheds built to protect the road from being blocked by an avalanche and keep the traffic flowing. So we make our way to beautiful Banff where we holidayed in January 1991 with the family in winter in the freeeeeeezing temperatures and were confronted by elk on the streets. Well, you wouldn’t believe it would you. I turn my back for 2 minutes and the apprentice gets hold of the iPad and writes the first thing that comes into his head like something about me using the wrong brand of toothpaste etc! Now really – as if I would do something like that! Well, maybe! Actually, what I do need to say is that we had this enormous jacuzzi bath with a shower at either end and I am just so glad the boss didn’t decide to share the shower that night because I would have had no one to fetch the 7-Up from ze fridge!I am writing this on a flight from San Francisco to Victoria and, as I do so, the guy sitting next to the boss has fallen asleep and his head is almost resting on Vern’s shoulder (he is also asleep). I am a little worried that the boss might subconsciously put out his hand and place it on this guy’s knee. Then all hell will break loose here in this row I fear!! So I am hoping one of them wakes up very shortly! 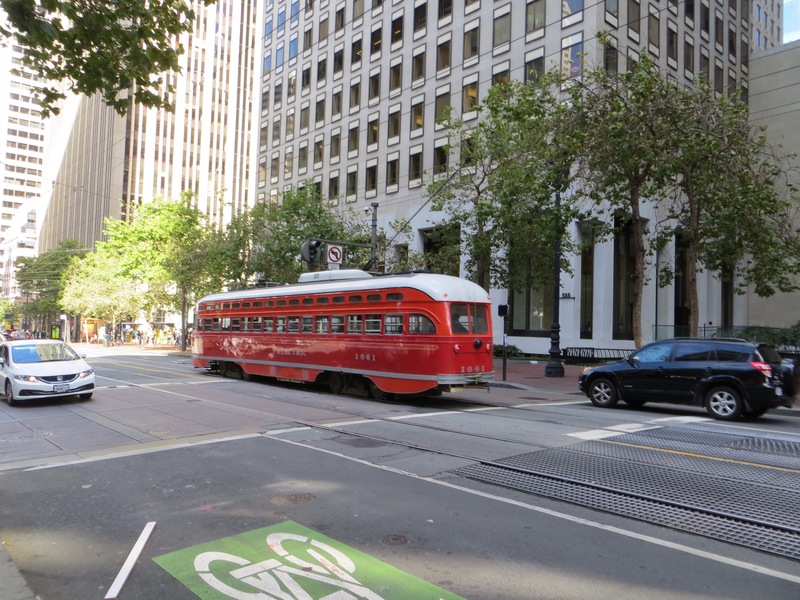 I know my apprentice has told you a little about San Francisco but I will backtrack a little. 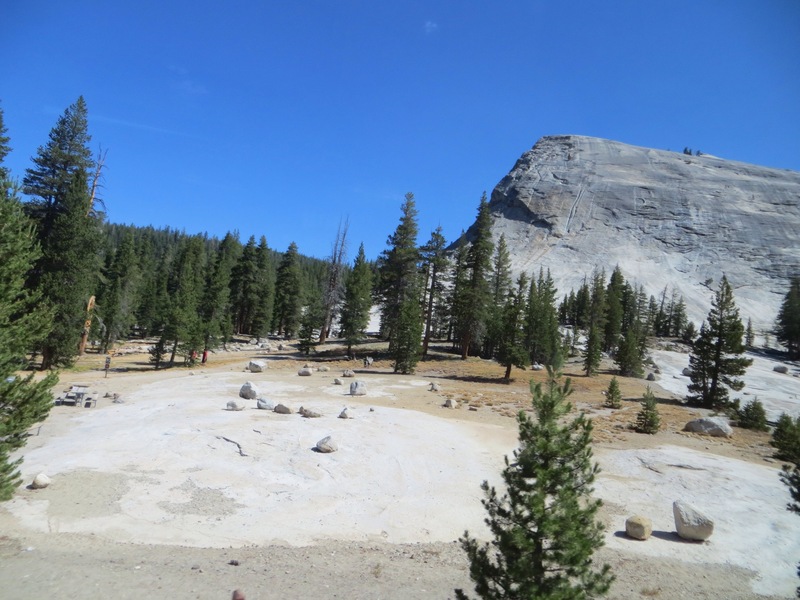 After the breakdown in the desert and all that excitement we travel up the Tioga Pass (which has an altitude of 9941 feet and is the highest automobile pass in California) to get to Yosemite National Park. Louis Armstrong is singing “What a wonderful world” on the bus and “we are seeing trees of green and skies of blue” as we climb the narrow road through the mountains to get to the top. 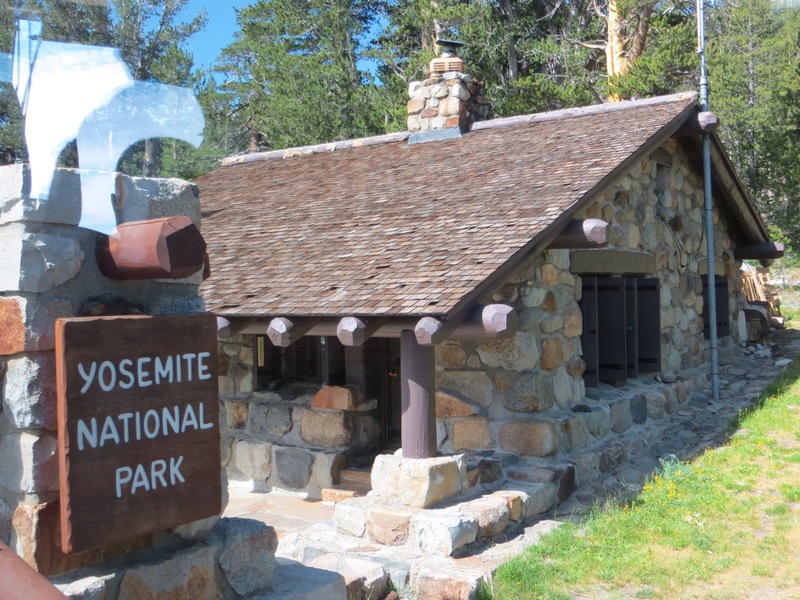 We pass through the entrance gate at Yosemite National Park and drive on passing pretty meadows, granite mountains, gorgeous little lakes and streams. We are now at 10,000 feet and many of us are feeling the effects of the altitude with a little chest tightness when we breathe. We had a stop in the park and a large RV managed to scrape the side of our bus. Well, we are in the USA and the paperwork takes an hour with the Park Rangers involved as well. Everyone is happy to wait because today the temperature is great and the air is fresh and we are no longer in the desert! You enter the beauty of Yosemite after you exit a long dark tunnel and when you look right your jaw literally drops as the sun lights up the valley, the mountains and the forest. To the left is El Capitan 900 metres high standing straight and tall and magnificent. 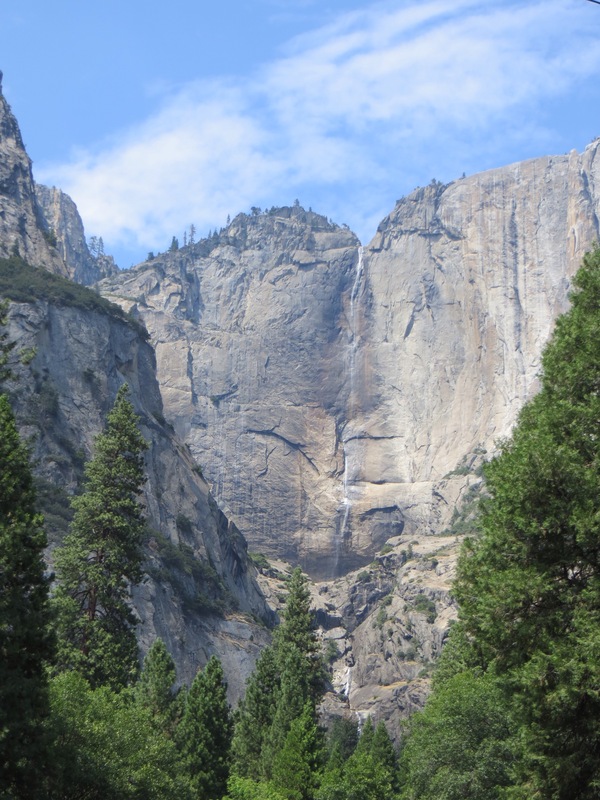 It is a little dry here so the water tumbling over Bridalveil Falls is not a torrent but still visible. The huge white granite walls tower up above us and the pine trees stand straight and tall with their feet embedded in the rock. It is breathtakingly beautiful everywhere you look. The tour director has beautiful music playing and we feel like we are viewing a spectacular movie. The sheer beauty is so moving it makes my eyes leak a little. We start to descend down to Yosemite Valley and are now seeing red fir trees and, further down, cedar trees and sugar pines which have enormous pine cones. Sadly there is still also evidence of the big fires here in 1990 although they also carry out “managed burns” here and in other places to clean up the forest floor and encourage vegetation. We look out for black bears but see none although they are prevalent here and the rubbish bins are designed to puzzle them and keep them from foraging and even manage to be a challenge for people to use because of the design! 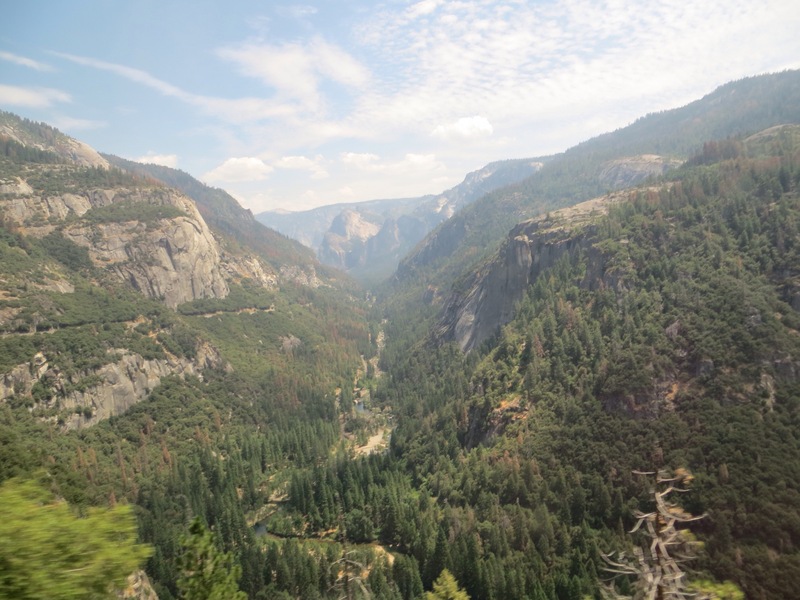 We descend to the valley floor for free time in the park and we go on a walk to Yosemite Falls with our Tour Director. The heat is once again intense here in the valley so the walk is a bit of a challenge, made very much more difficult when Vern gets a call from Dene with some sad news (which he didn’t pass on until we got to the lodge thankfully). 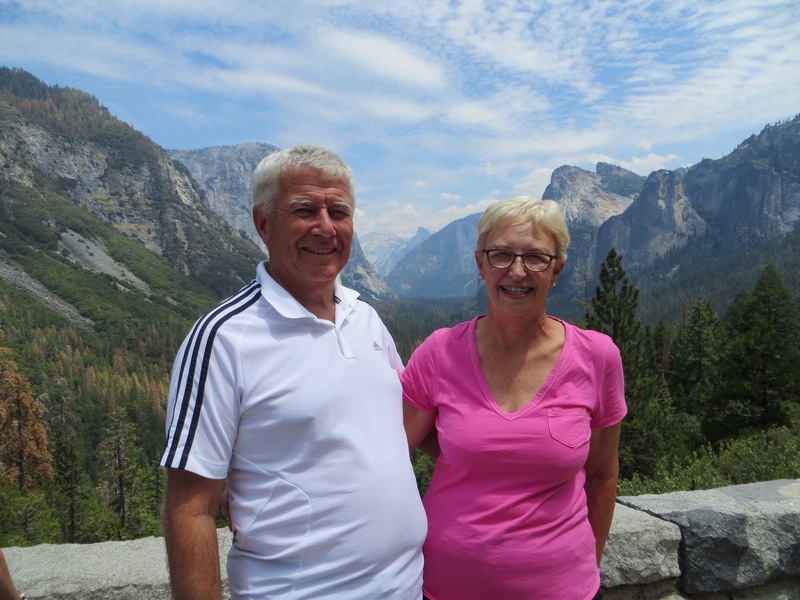 The visit to Yosemite will be remembered for its sheer beauty and the sadness of the news from home which the apprentice talked about when he wrote yesterday. We know Taryn has found her peace and is now with her brother Ryan. Two young lives lost too soon. The next morning we exit the valley slowly and in the process the bus gets swiped by another large RV and the side mirror gets bent. These RV’s are enormous and they are rented so we figure that the drivers are simply not used to manoeuvring them. This one speeds off so it can’t be caught for the lengthy paperwork! We make our way north through the Central Valley of California which produces 25% of food crops for the US – all this on 1% of the land in this huge continent. There are lots of rivers but not much water. However, these crops of stone fruit, cotton, tomatoes, citrus, cereals, grapes, almonds (70% of world’s almonds are grown here), walnuts and pistachios get irrigated somehow and migrant workers work in this valley. We are now back in the state of California and the green crops of the valley give way to the golden hills and pasture. We pass a place called Gilroy and the aroma of garlic penetrates the bus from the large pastures of garlic which grow here. Actually, you can even get garlic ice cream here – yuk!! We travel past San Jose, where the famous Silicon Valley is situated, and Stanford University. We have left the scorching temperatures of the desert far behind and the temperature now has plummeted to 17 degrees – oh deary me! We pass the famous San Andreas fault line where, in 1989, there was a very bad earthquake. So, as the Apprentice has already told you, San Francisco was covered in fog, fog, fog. This is apparently very common at this time of year. The Golden Gate Bridge was a Golden Gate Half Bridge because, after two attempts, we only saw half of it!! Apparently, if you show the locals a photo of fog, they say “so you visited the bridge”. We visited a Japanese Tea Garden, (where we purchase a bag of fortune cookies – the first one said “you can start planning an exciting adventure” so we figure we must be about to win Lotto), Chinatown where 100,000 people live in the space of 3/4 of a square mile and is the largest Asian population outside of Asia. 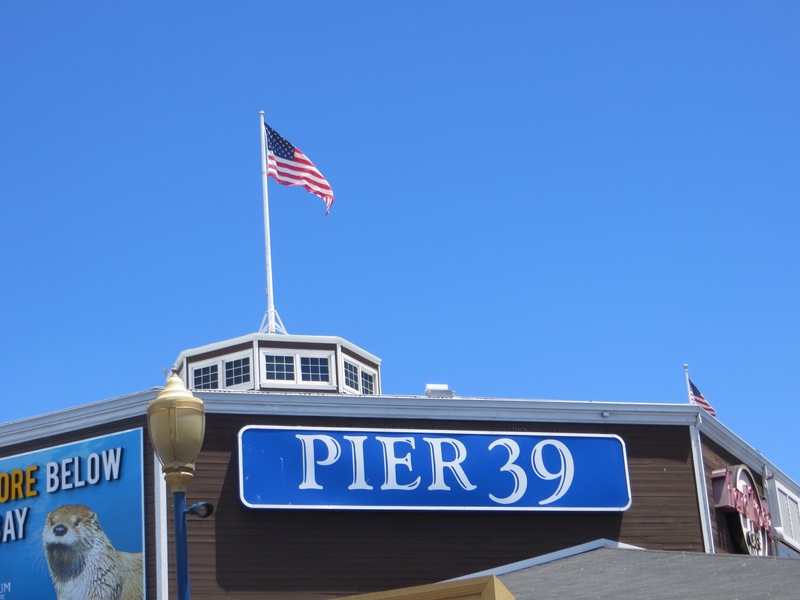 We saw San Francisco from the water with a lovely boat cruise (bridge still in fog) and Alcatraz and spent a few hours at the very busy Pier 39 and Fisherman’s Wharf which was a bustling area with street performers, fish and seafood restaurants, boats and shops and people, people, people!! 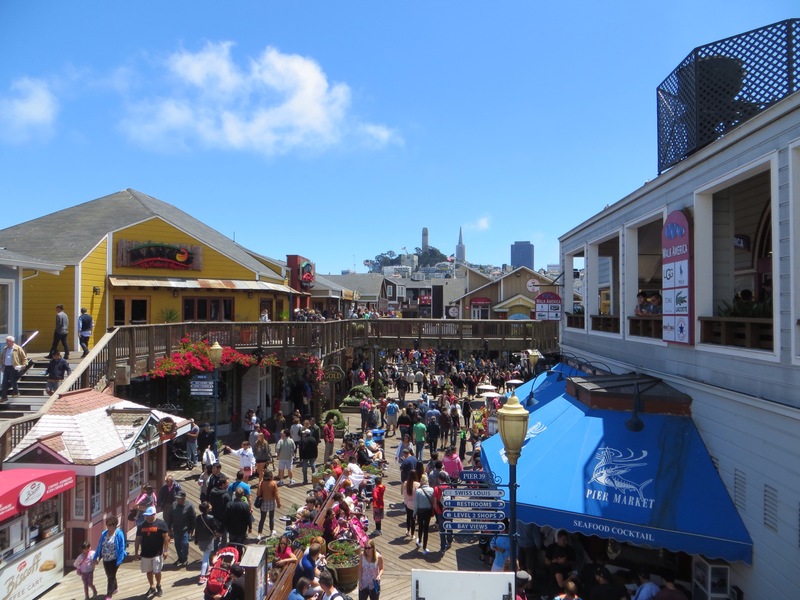 I have to say I didn’t “leave my heart in San Francisco” like Tony Bennett but it was an interesting place to visit. We have farewelled the US now for the next few weeks and will be arriving back in Canada shortly. There is something I am completely over here and that is the queue at the Ladies. Whoever designs the Ladies’ Restrooms here seems to have the idea that women need to make new friends and they do this by queuing at restrooms. For heavens sakes, why do they only build them with just two or three I ask myself? And to make matters worse, this is a worldwide problem of enormous proportions. I wonder if Donald Trump has thought about this because he might plan to fix this as well as build the wall, expel the immigrants and destroy Isis all in a day’s work. Heaven forbid. I am relieved to report the boss has woken up (unlike the guy next to him) so that’s a relief! We are flying due north to Vancouver and then onto Victoria and we are looking forward to that.